"A Proud Tradition of Keeping the Spirit"
Cheerleading; A Sport, or Just a Novelty Act? 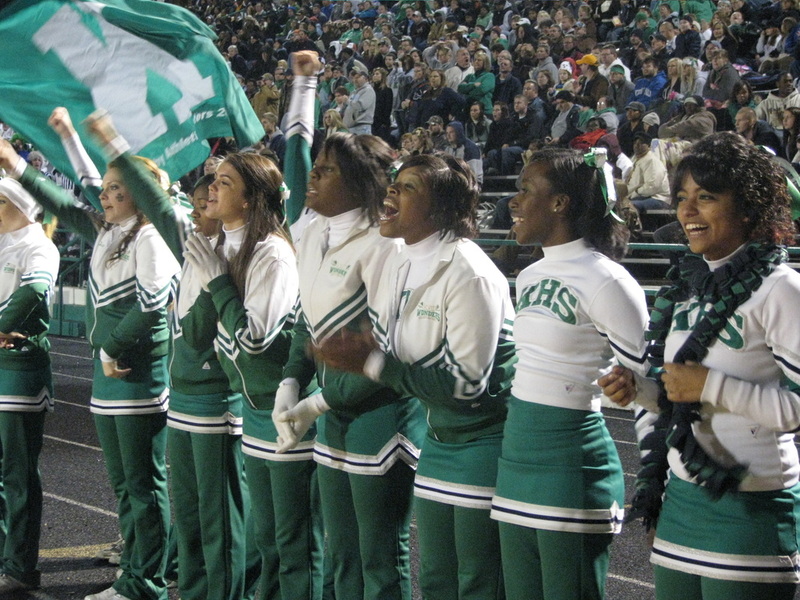 Cheerleading is an important part of many sporting events today, so much so that it is considered as much a sporting event as any other sport. 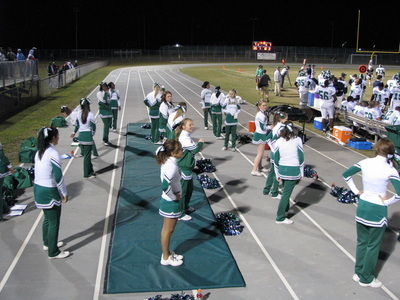 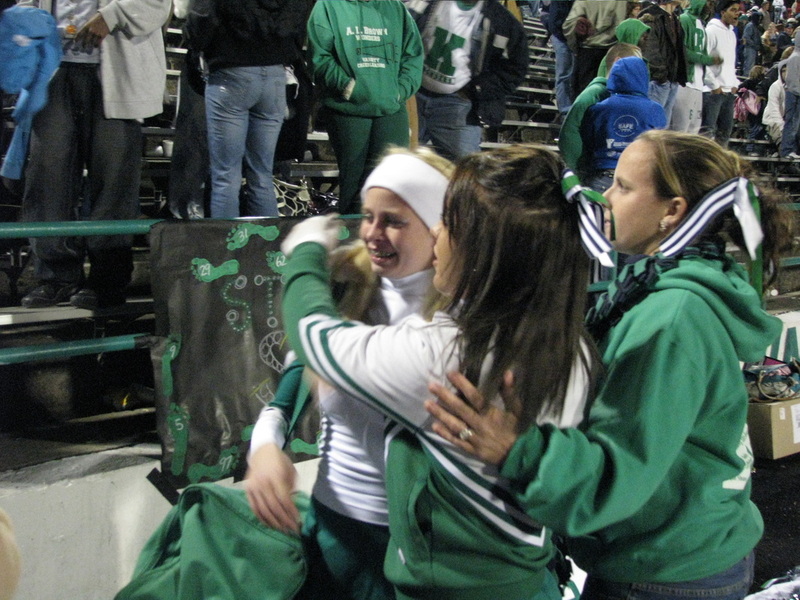 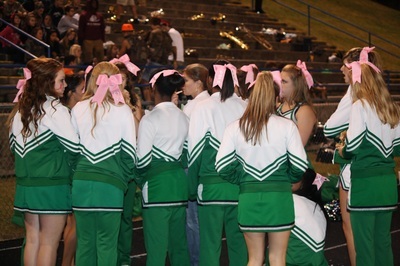 Cheerleaders cheering a team on is known to boost the morale and spirit of a team. 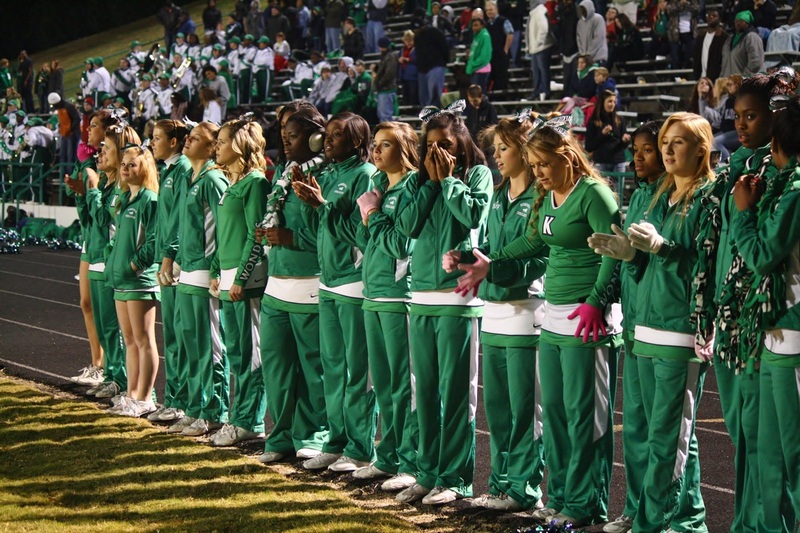 And while cheerleading started out as a means to encourage teams, it has, today, become a lot more than a simple routine, with chants and cheers put in for good measure. For example, did you know that cheerleaders are encouraged to be expert gymnasts because they carry through difficult routines without any safety gear? 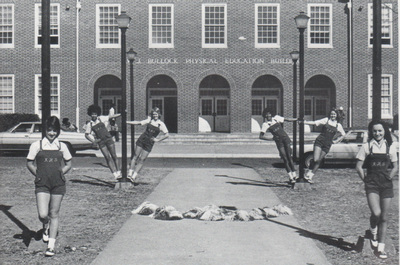 : A physical activity which involves propelling a mass through space or overcoming the resistance of a mass. 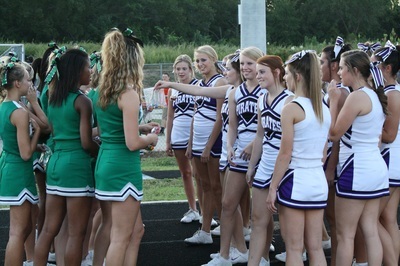 : A contest or competition against or with an opponent. 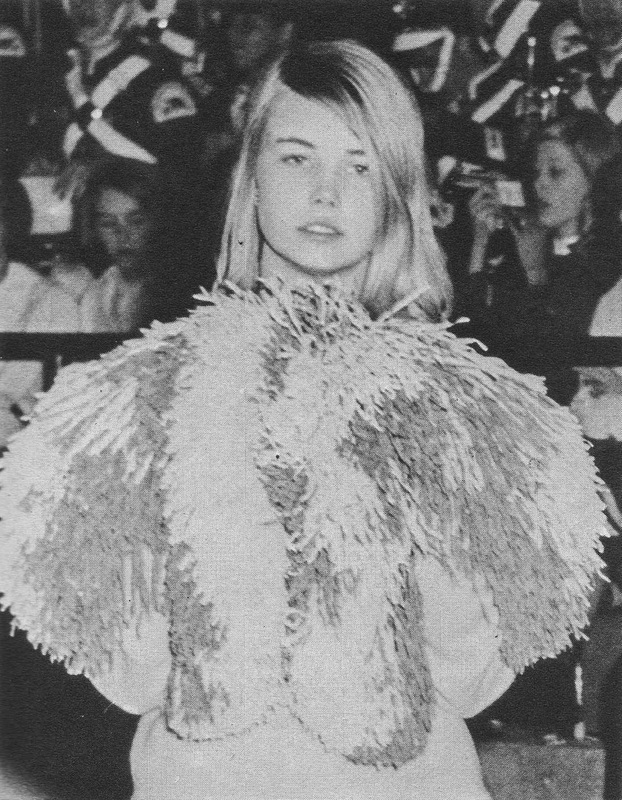 : Is governed by rules which explicitly define the time, space and purpose of the contest, and the conditions under which a winner is declared. 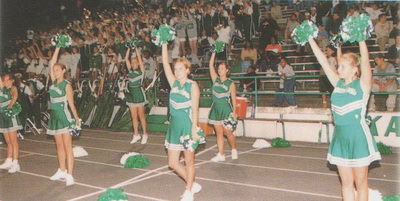 : The acknowledged primary purpose of the competition is a comparison of the relative skills between the participants. 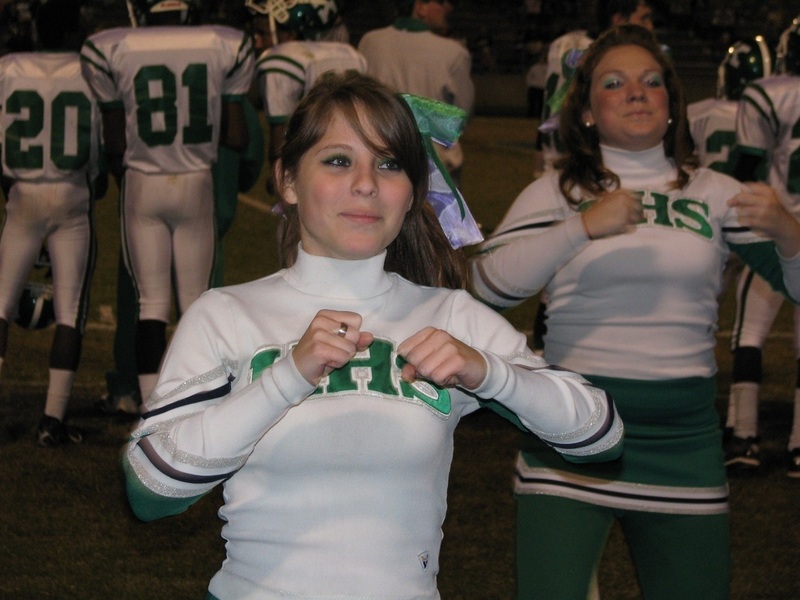 With the criteria above in mind, is the primary purpose of cheerleading to compete? 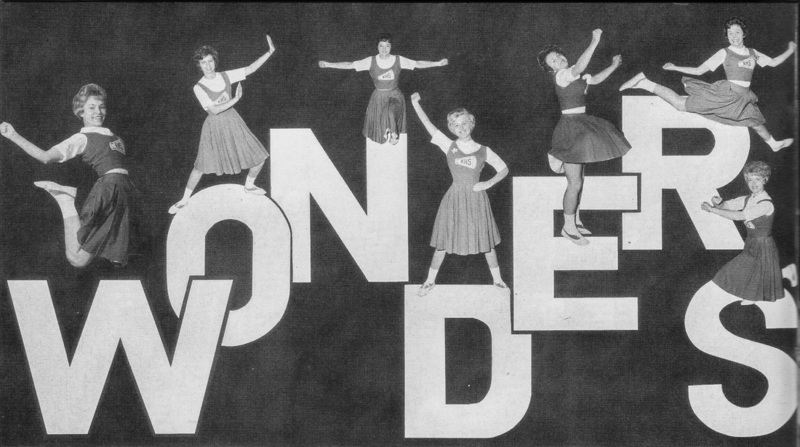 Well, presently no. 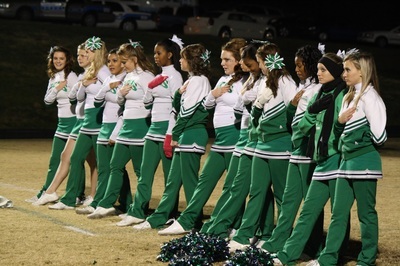 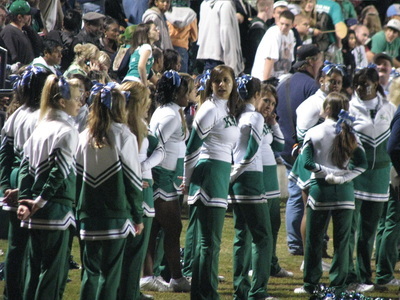 The majority of cheerleading squads do not participate in any competitions. 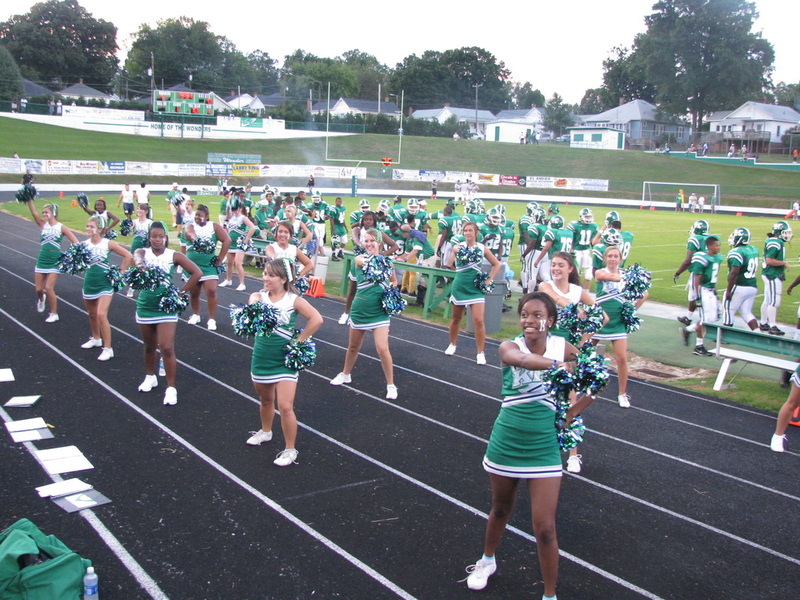 Their sole purpose is to entertain, motivate and unite spectators of other athletic teams that are competing. 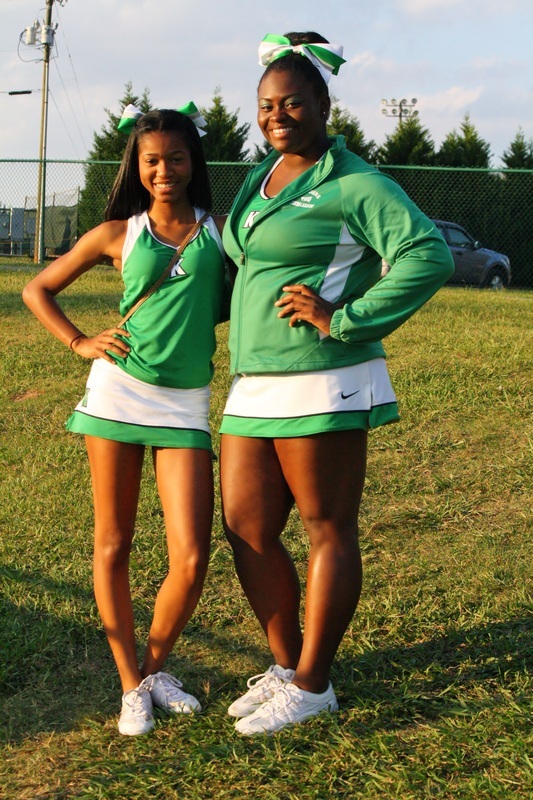 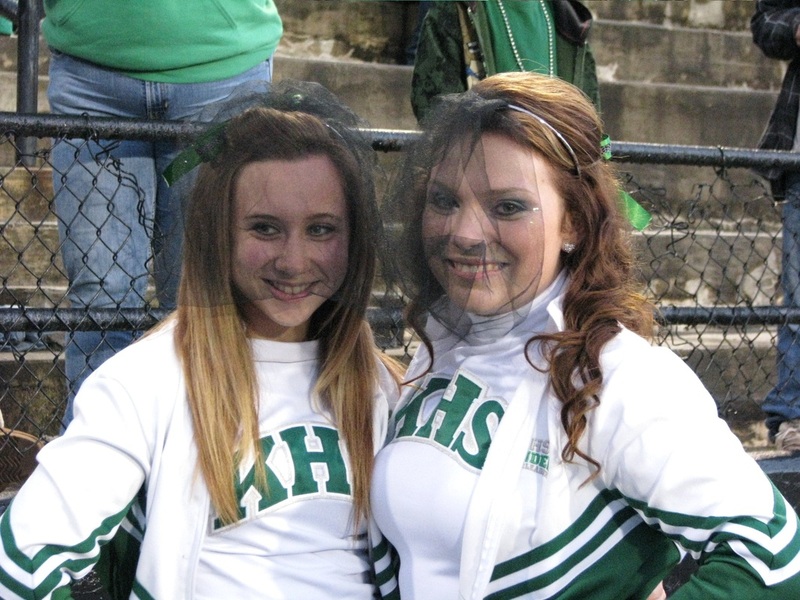 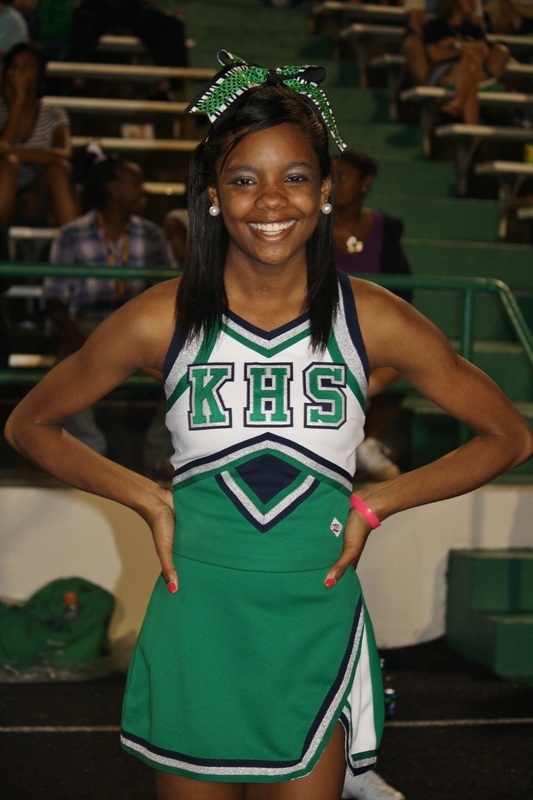 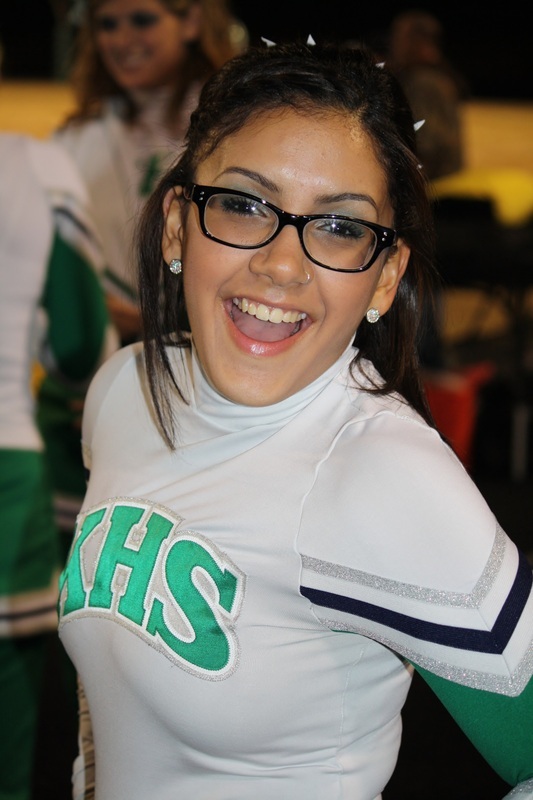 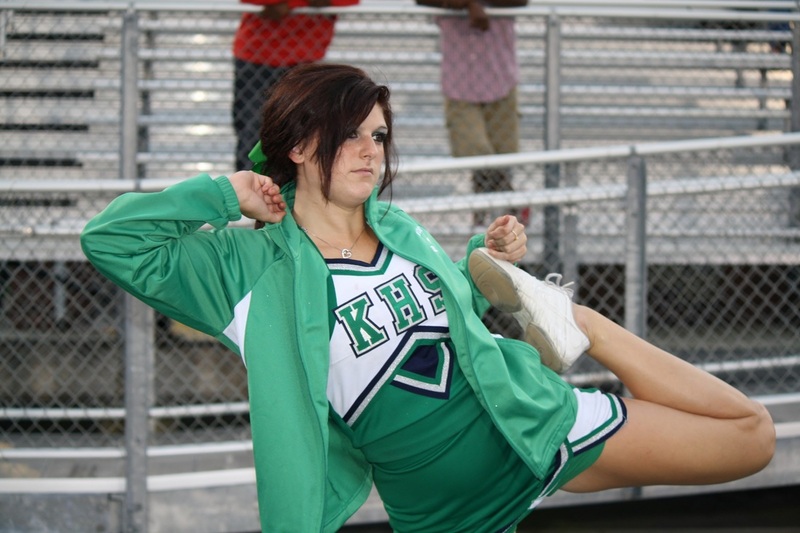 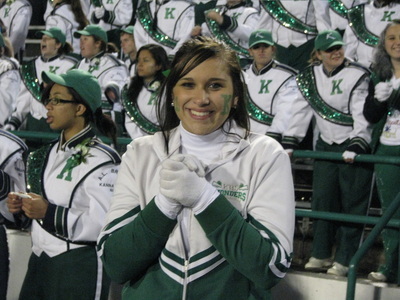 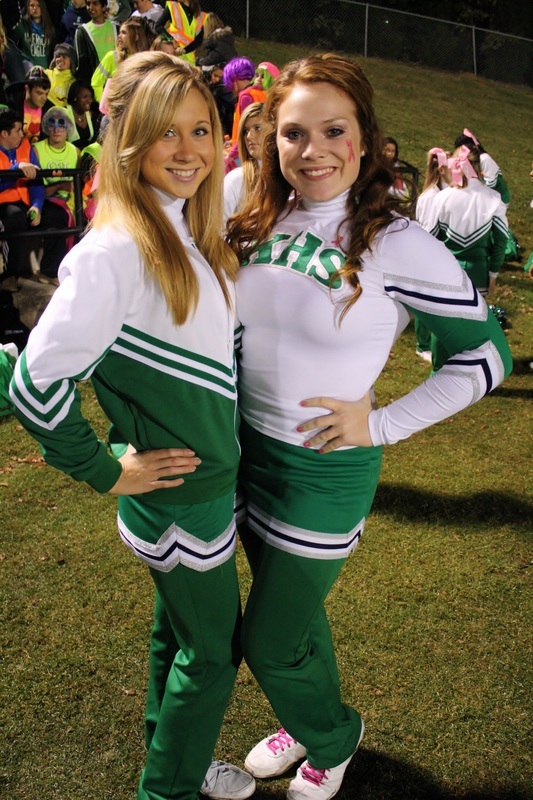 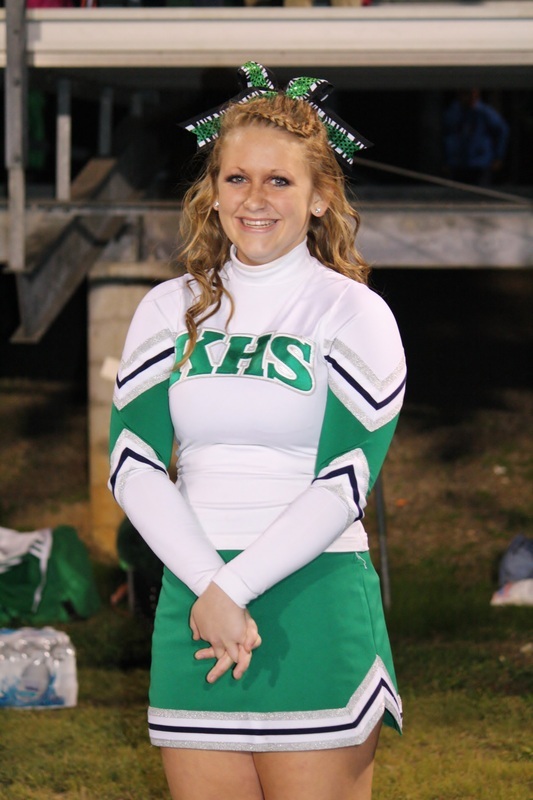 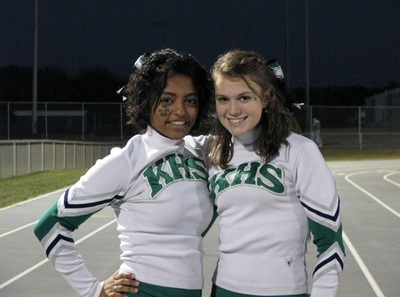 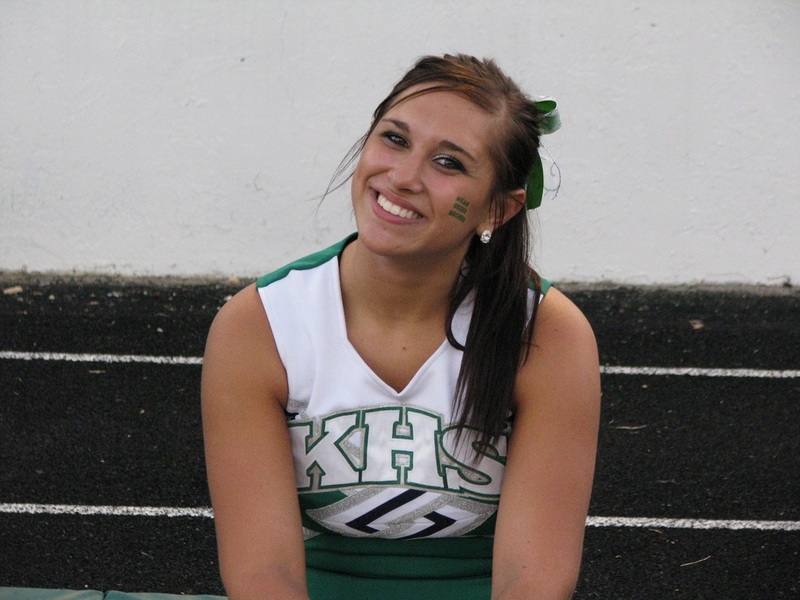 Cheerleading is most often defined as the simple "Act of leading organized cheering, at sports events." 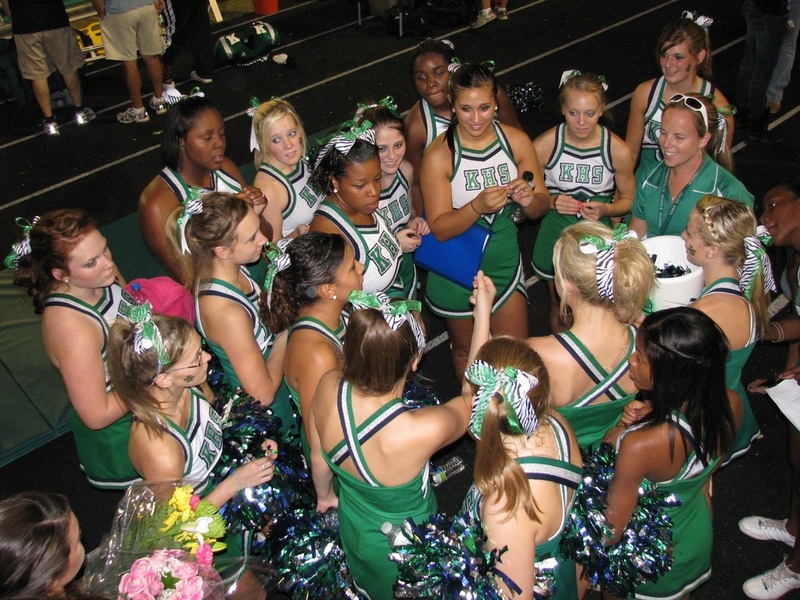 Although there are many cheerleading squads that do meet the criteria of their primary function being competitive cheerleading. 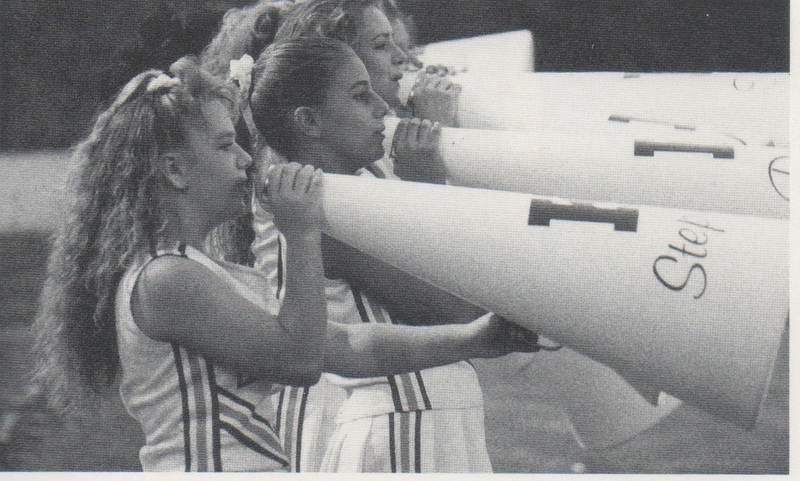 Until the majority of the squads move competing to the forefront and cheering at games to be a secondary function, there is little hope cheerleading will be officially considered a sport. 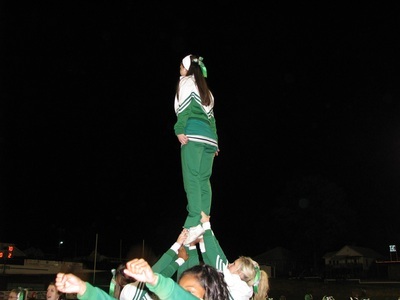 The skills involved in Cheerleading leave no doubt that cheerleaders are exceptional athletes. 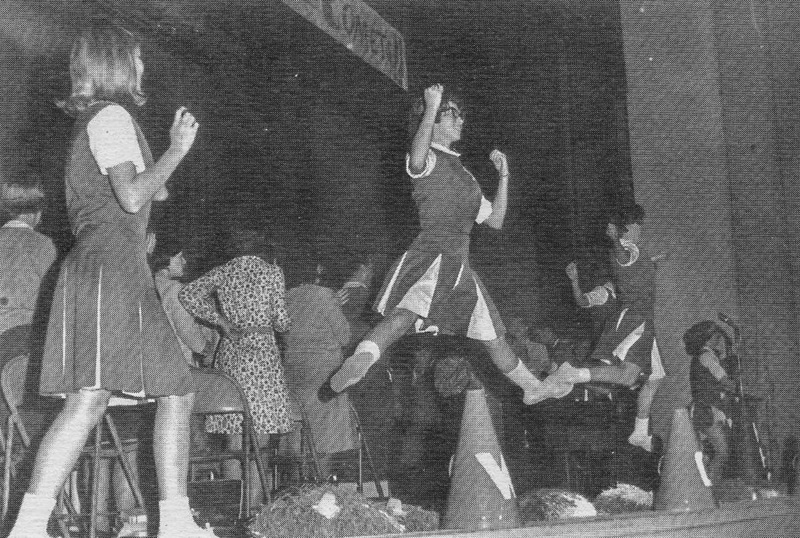 To perform their activities, they must be as strong as any football player, as poised as any dancer and as flexible as the best gymnasts. They are athletes by every definition of the word. 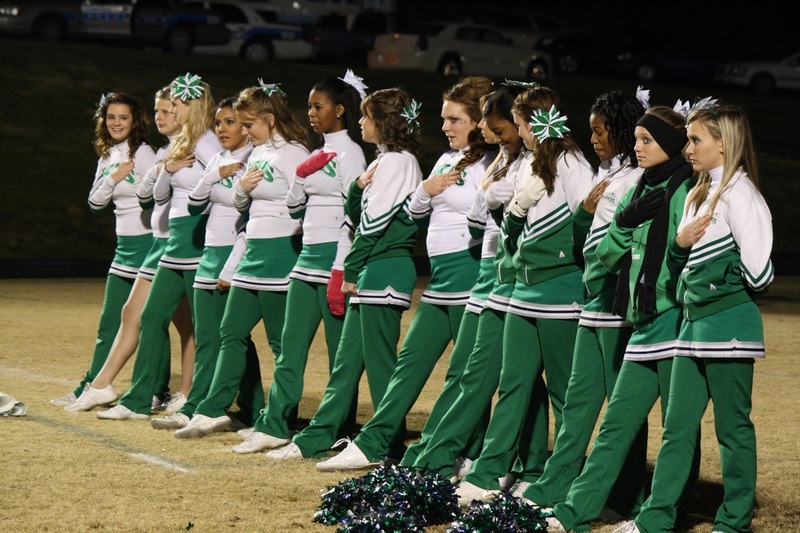 So, does it really matter how cheerleading is defined? Is it not more important to be considered an athlete, even if you don't have an official sport? 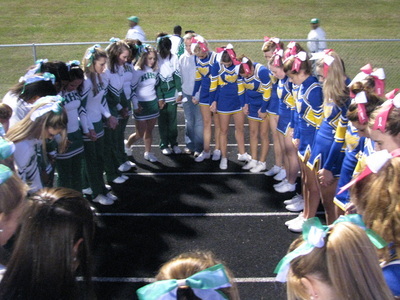 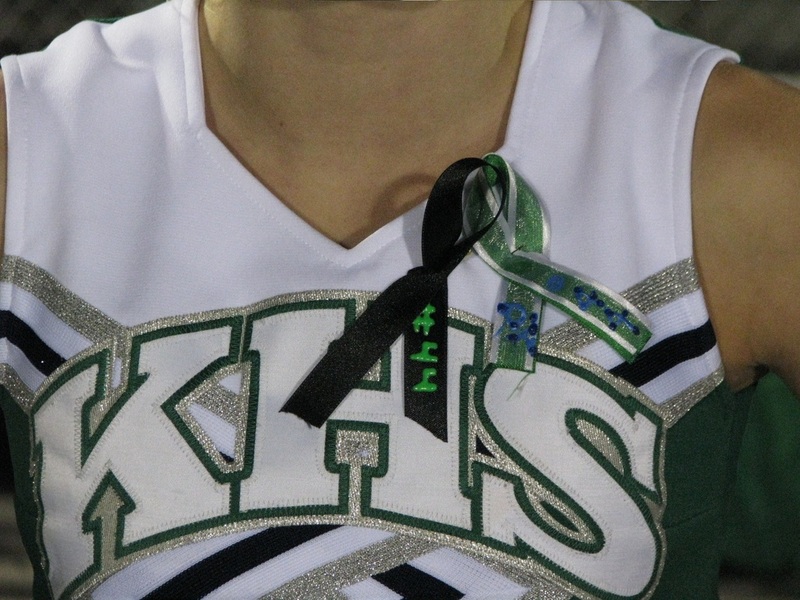 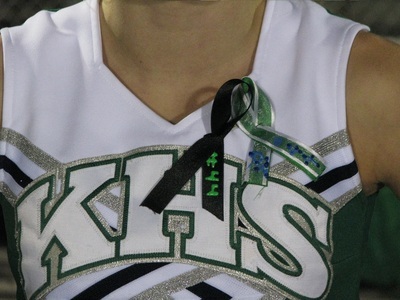 For high school girls and college, cheerleading is far more dangerous than any other sport they can participate in. 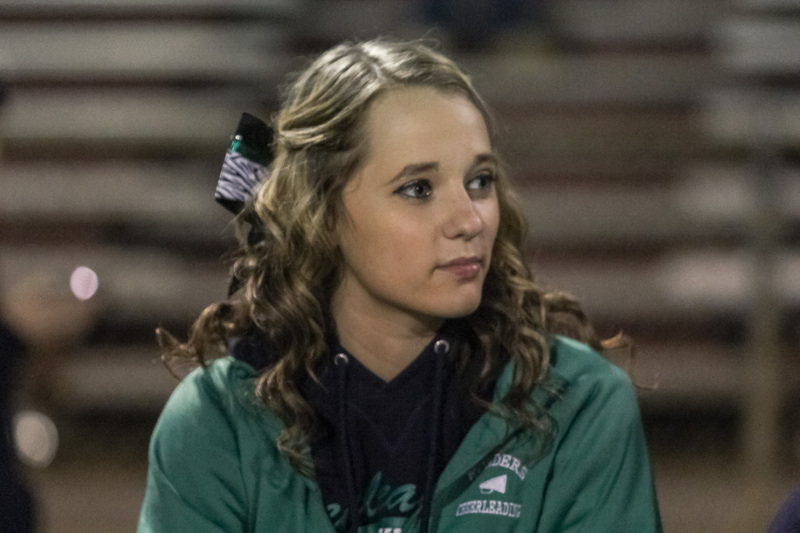 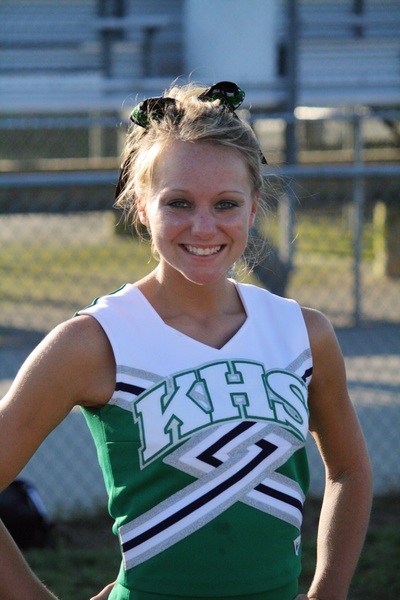 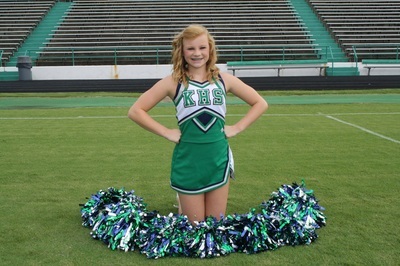 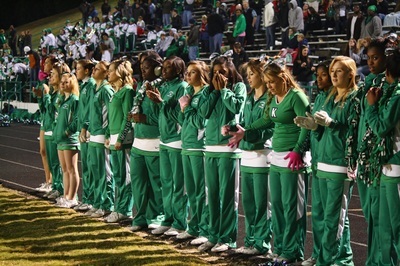 According to a new report that adds several previously unreported cases of serious injuries to a growing list, high school cheerleading accounted for 65.1 percent of all catastrophic sports injuries among high school females over the past 25 years according to an annual report released by the National Center for Catastrophic Sports Injury Research. 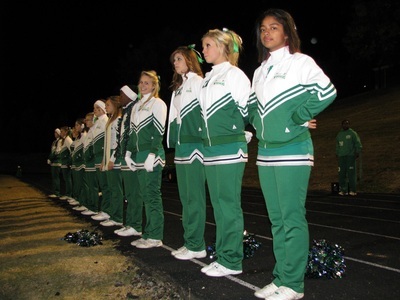 The researchers say the true number of cheerleading injuries appears to be higher than they had previously thought, and these are not ankle sprains. The report counts fatal, disabling and serious injuries. 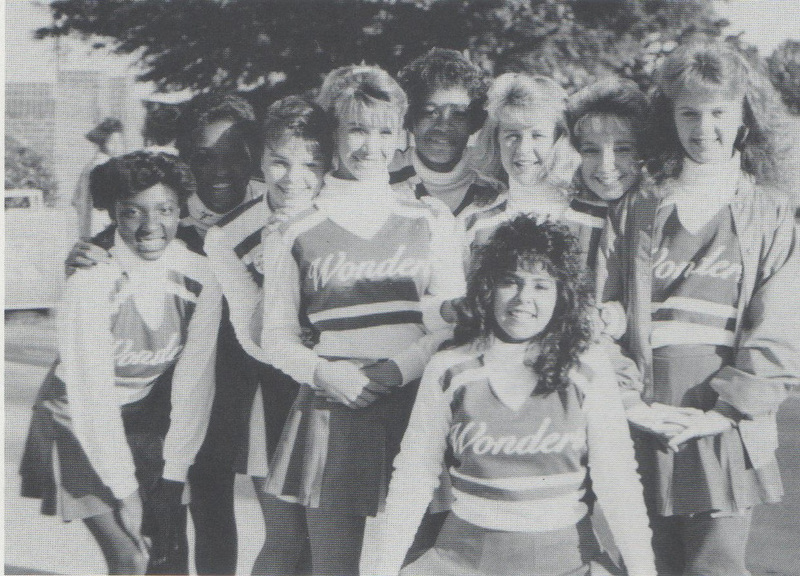 Being a Wonder ﻿cheerleader ﻿is where all the fun begins. You have summer camp, games, homecoming, pep rallies, and many other exciting events to look forward to. Not only are the simple aspects of cheerleading exciting, but many soon notice that practices and stunts become more demanding. 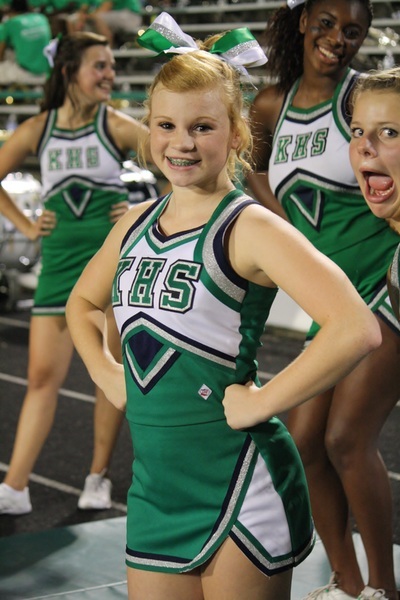 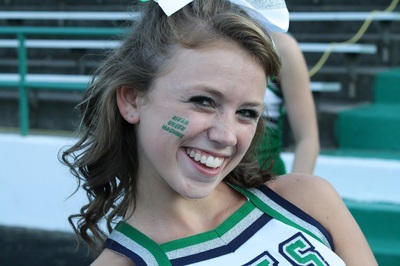 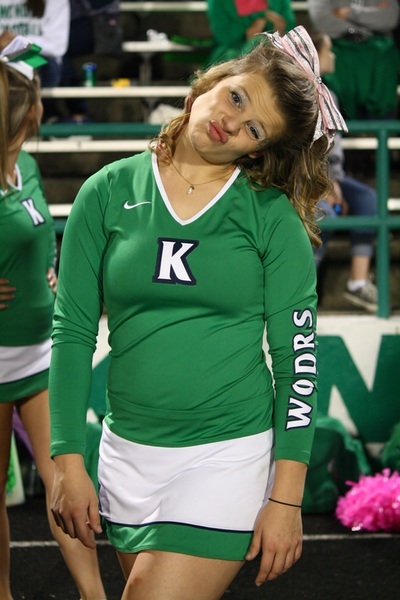 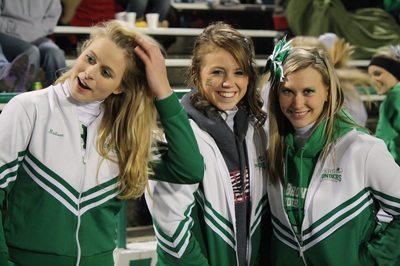 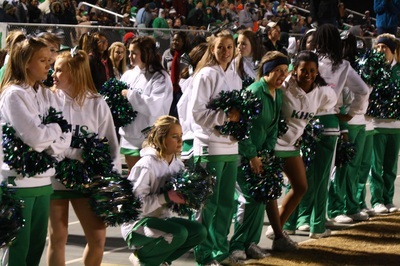 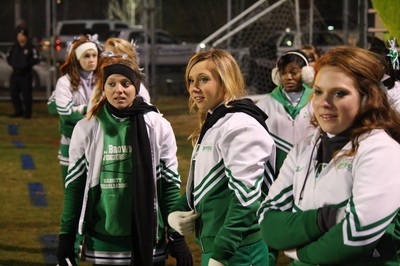 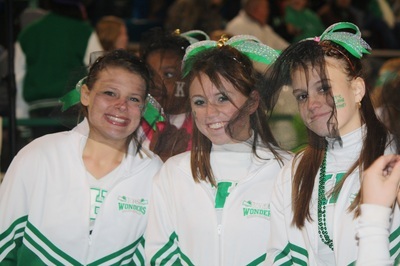 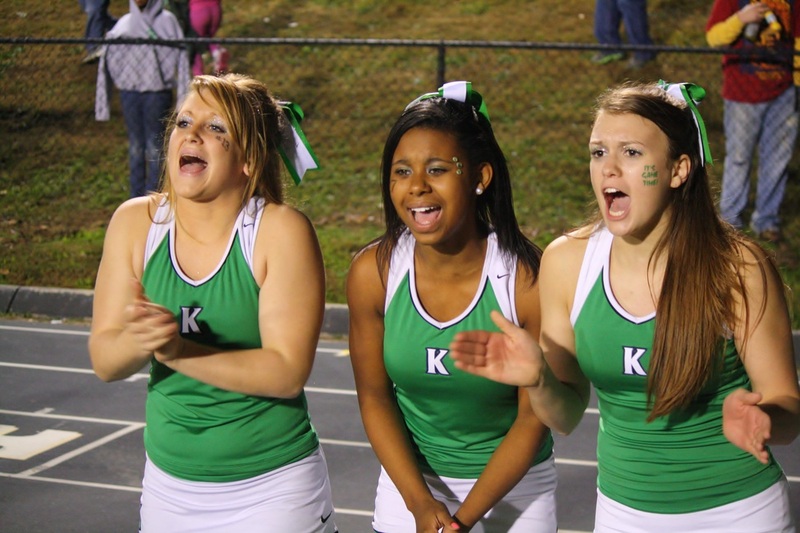 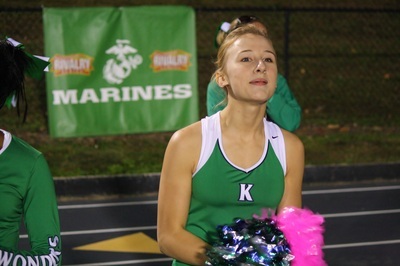 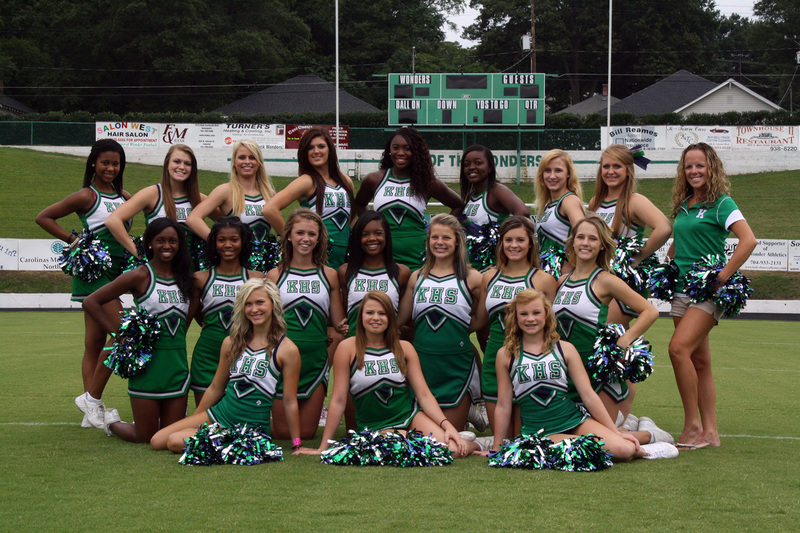 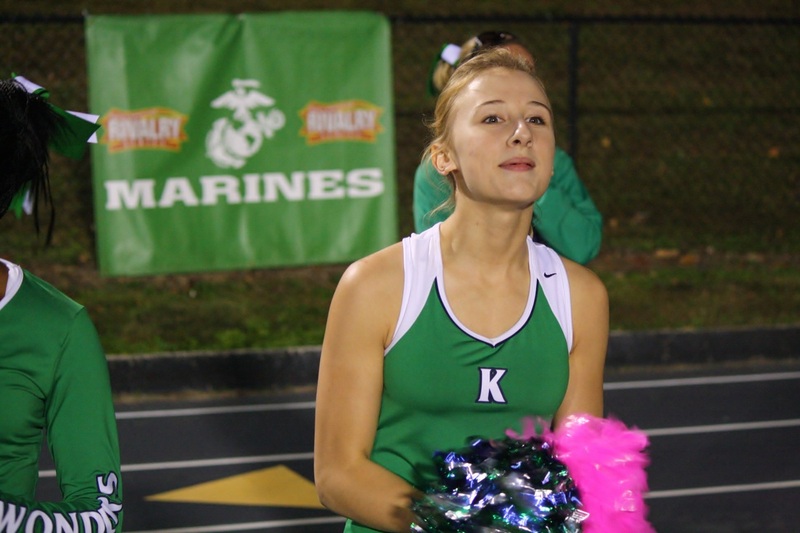 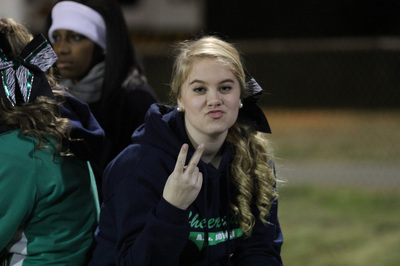 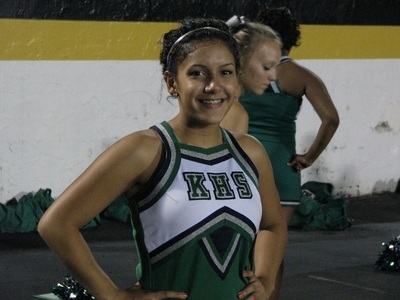 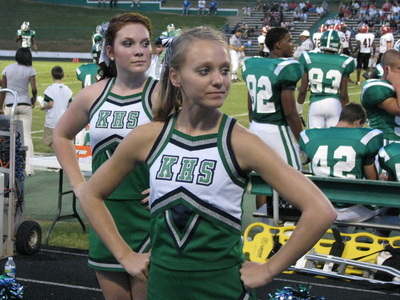 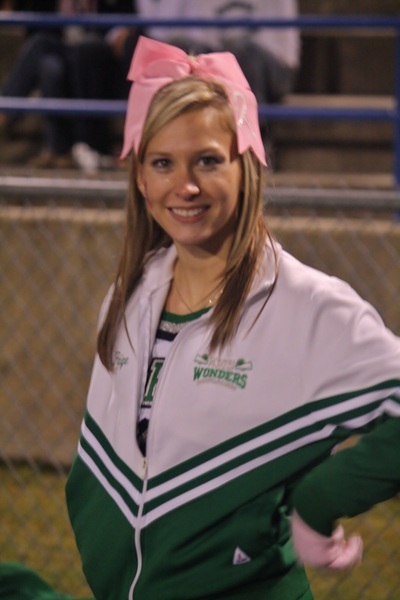 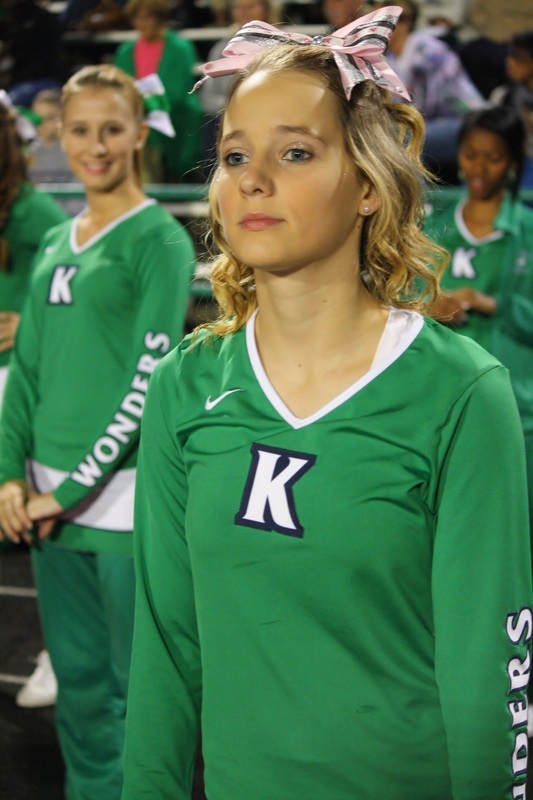 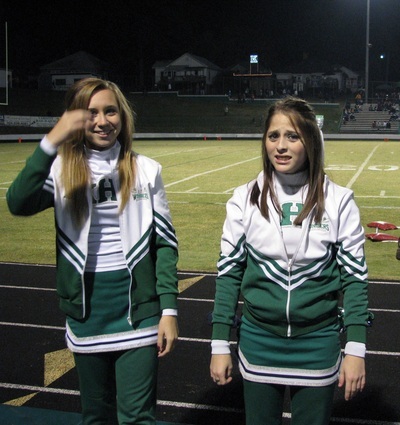 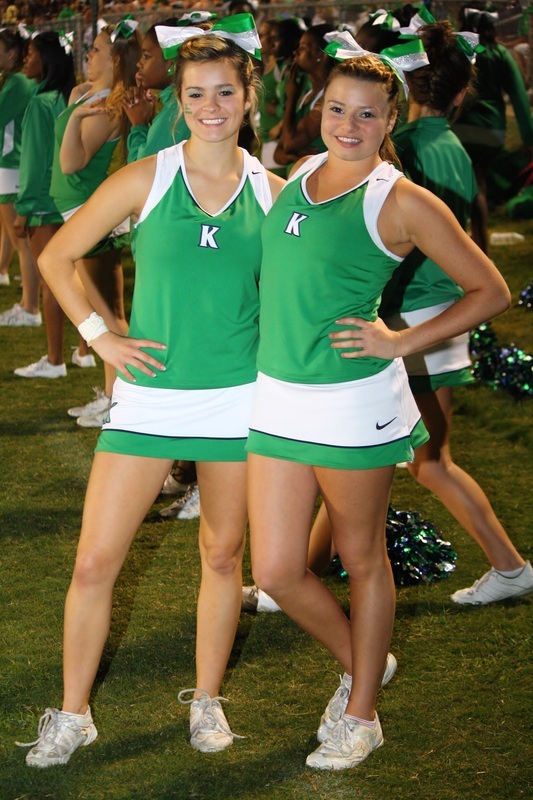 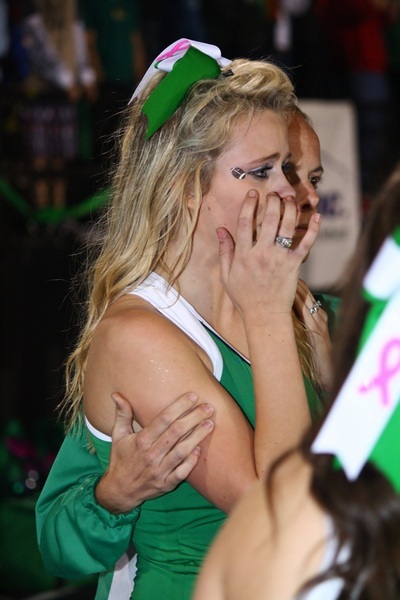 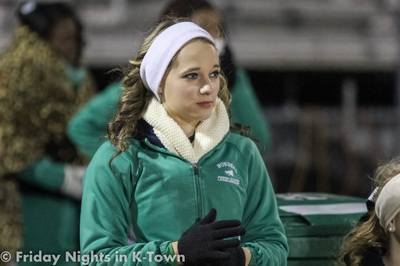 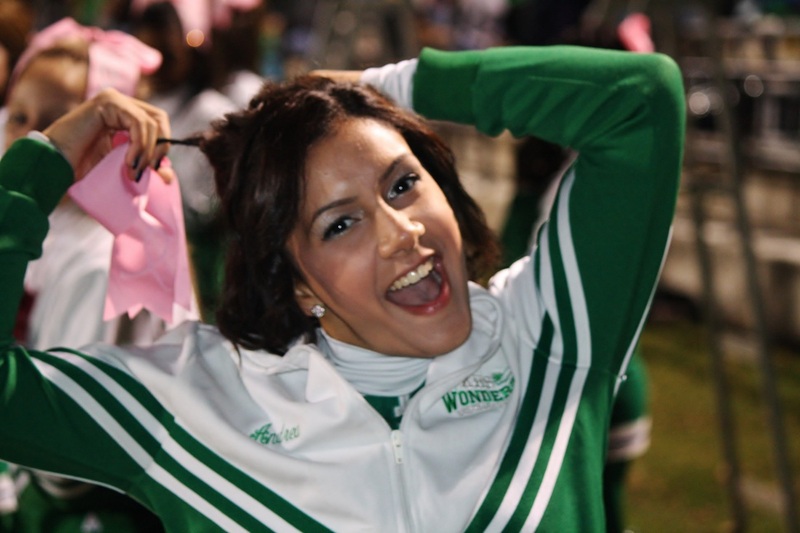 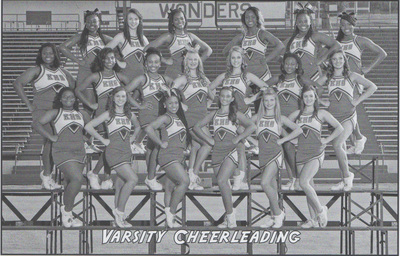 Wonder cheerleaders experience the thrill of cheering at games on Friday nights with stands full of screaming fans. 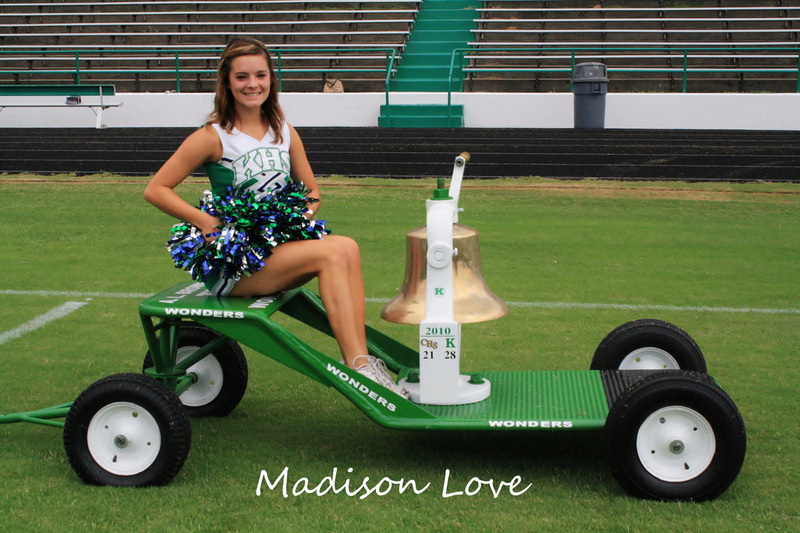 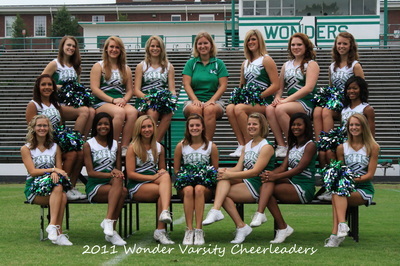 Wonder cheerleaders also become role models to those around them. Wonder cheerleaders, as with any high visibility position hold a very important job within the school and the community as a whole. 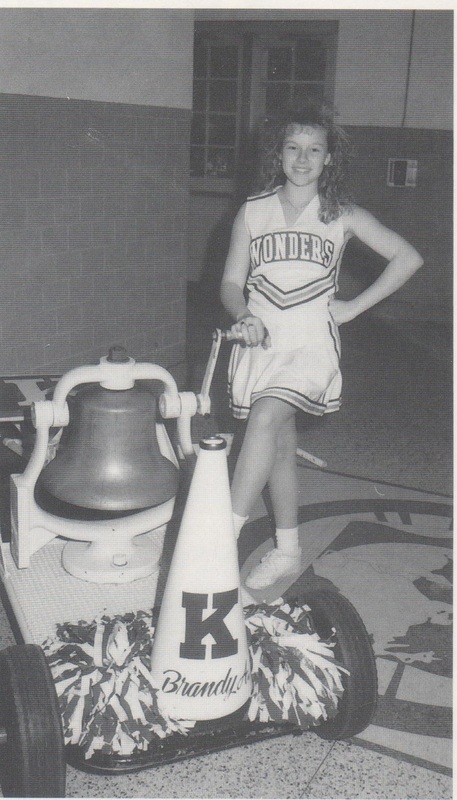 Being a Wonder cheerleader can be one of the most “looked-up-to” activities a young girl at A.L. Brown High School can be involved in, but it can also be a lot hard work too. 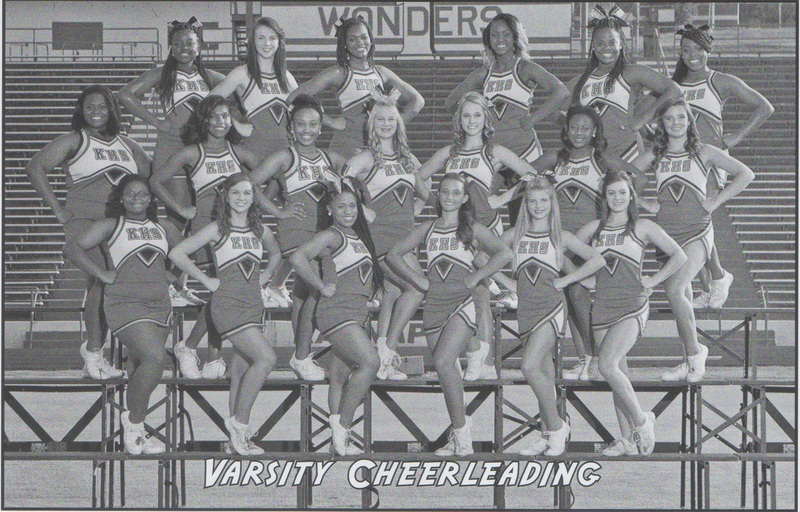 Wonder cheerleaders find that there’s much more to being a cheerleader than just being “cute” and popular. 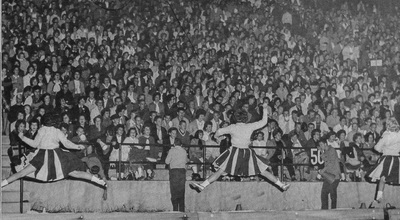 "The Tradition of Wonder Cheerleading"
Cheerleaders from this era would not only handle football cheer duties, but that of basketball as well. The life of a Wonder Cheerleader meant many long hours of practice and spirit related planning endeavors that usually took place after school hours had concluded. 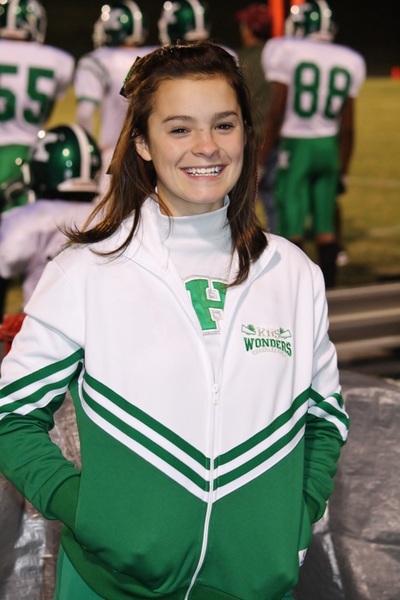 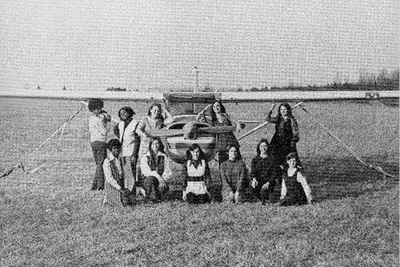 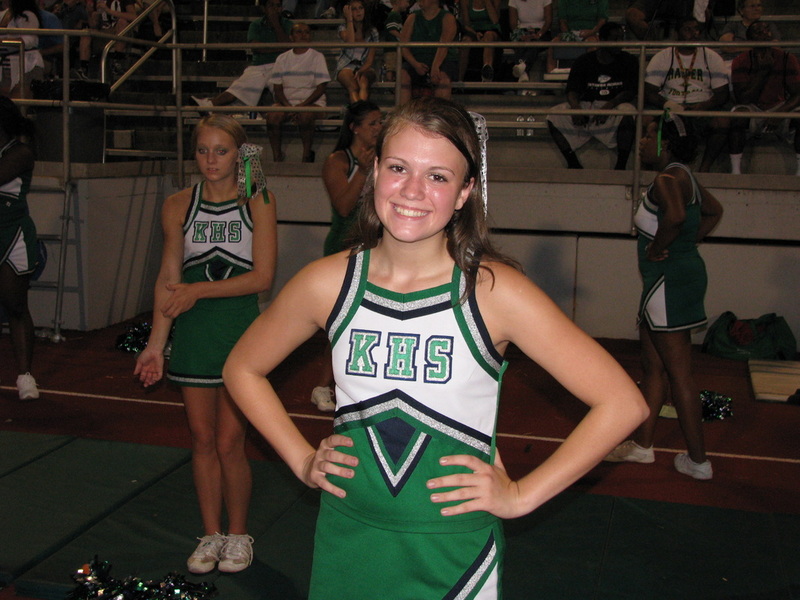 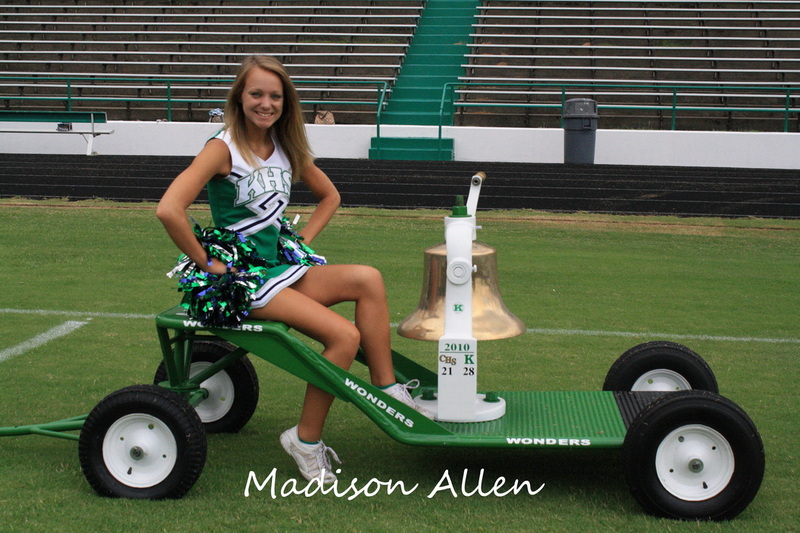 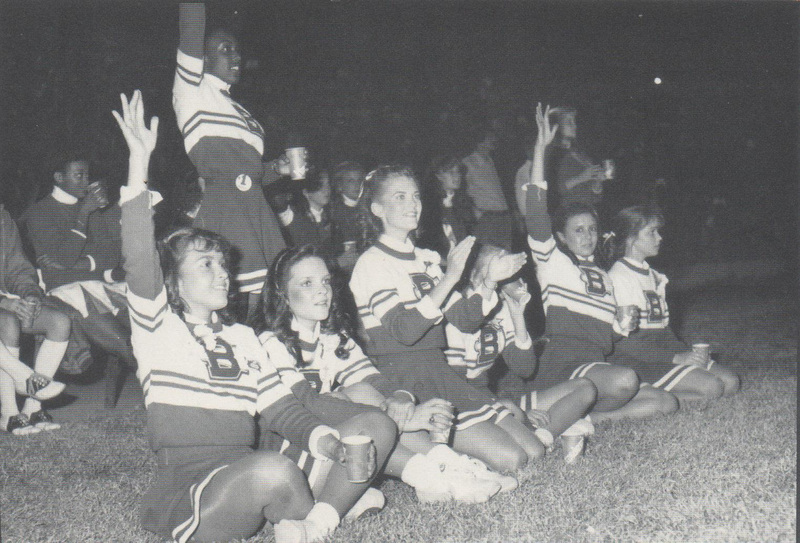 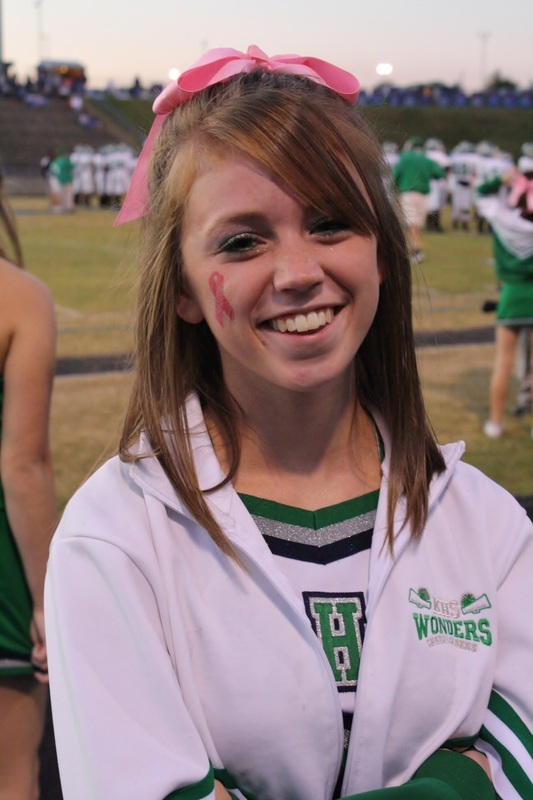 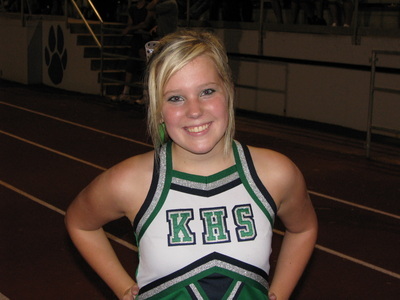 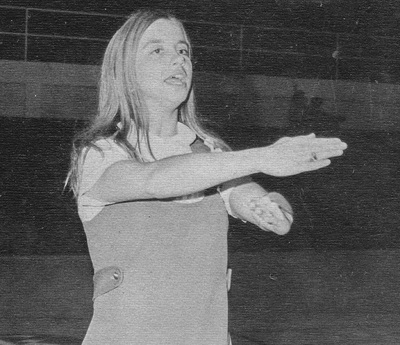 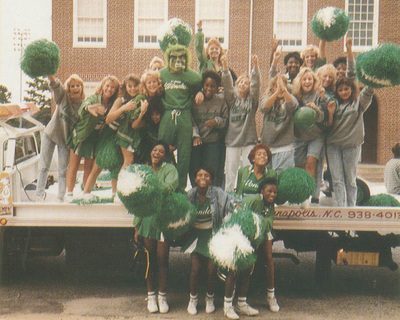 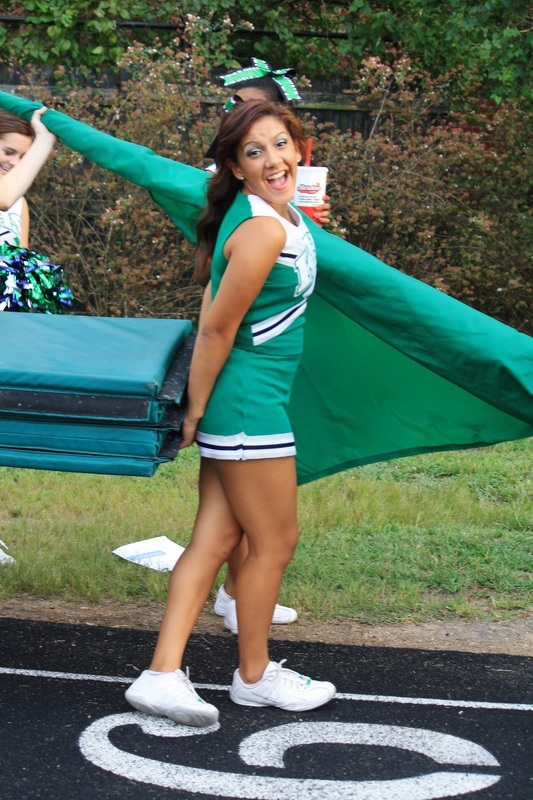 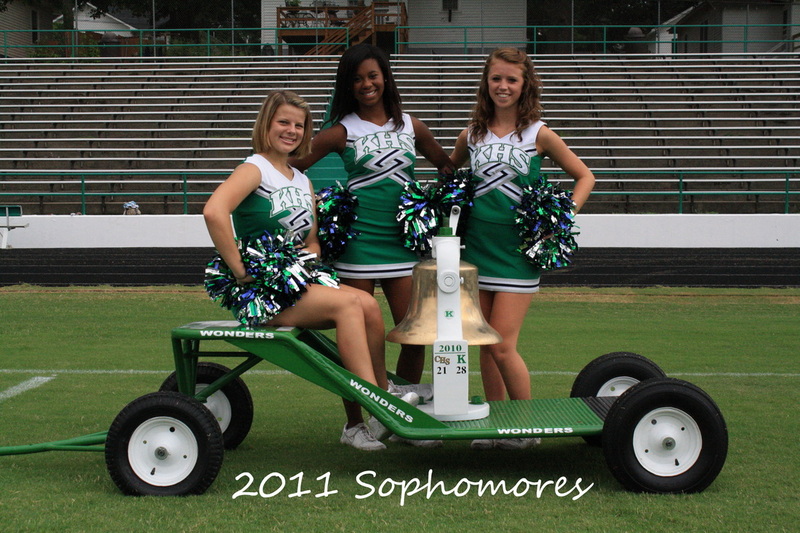 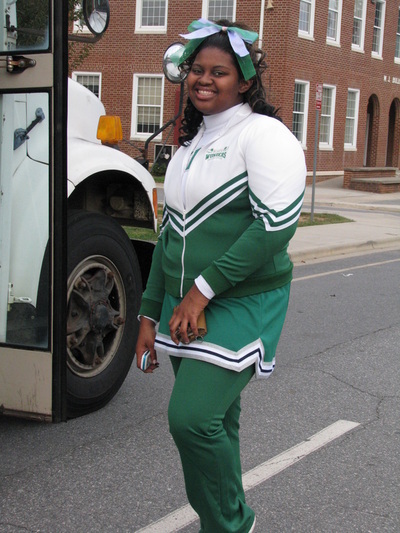 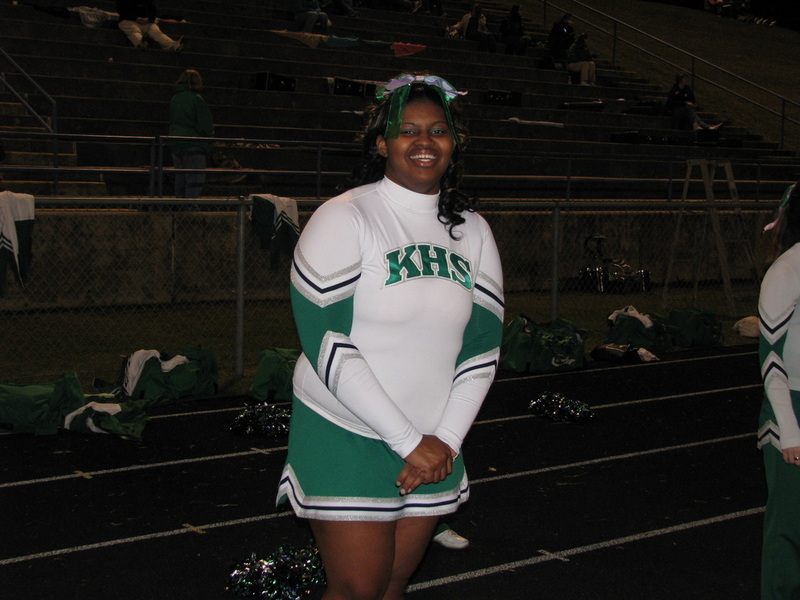 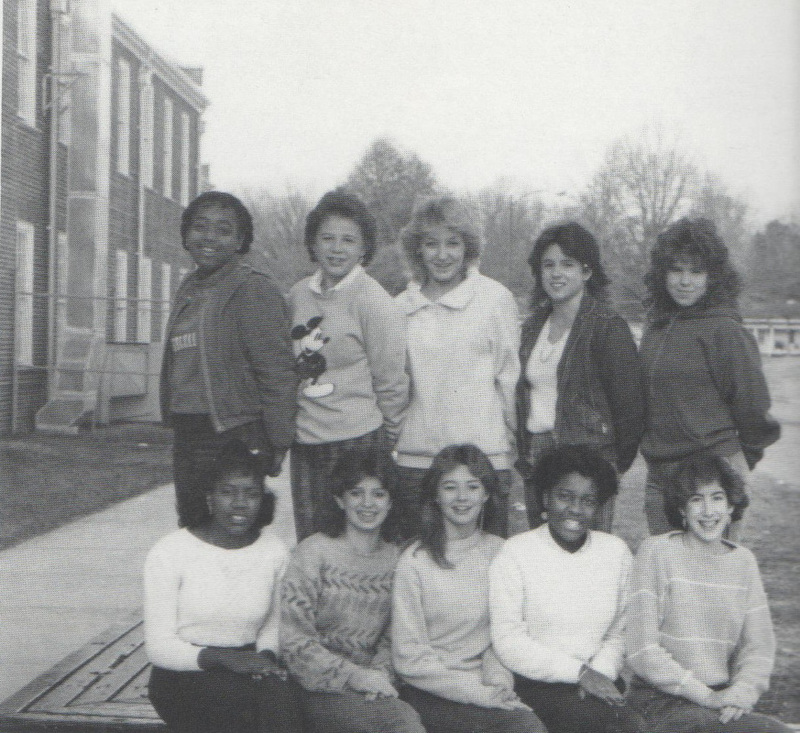 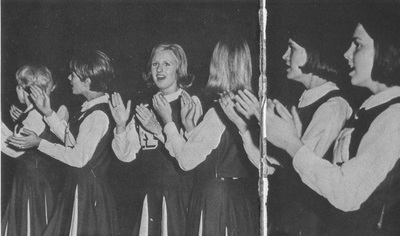 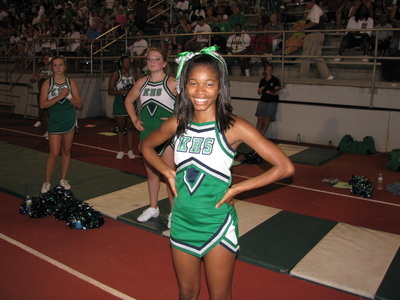 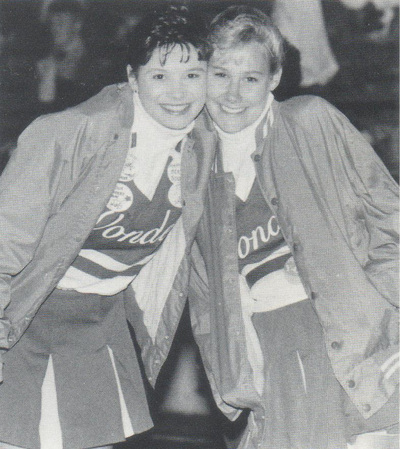 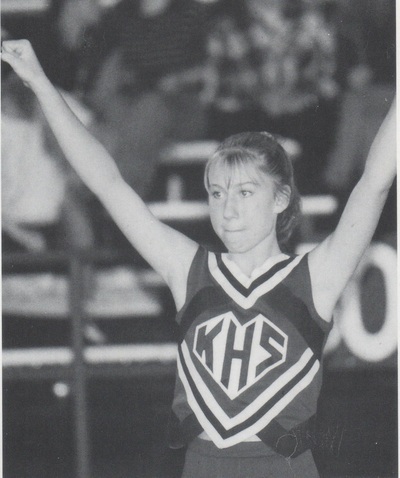 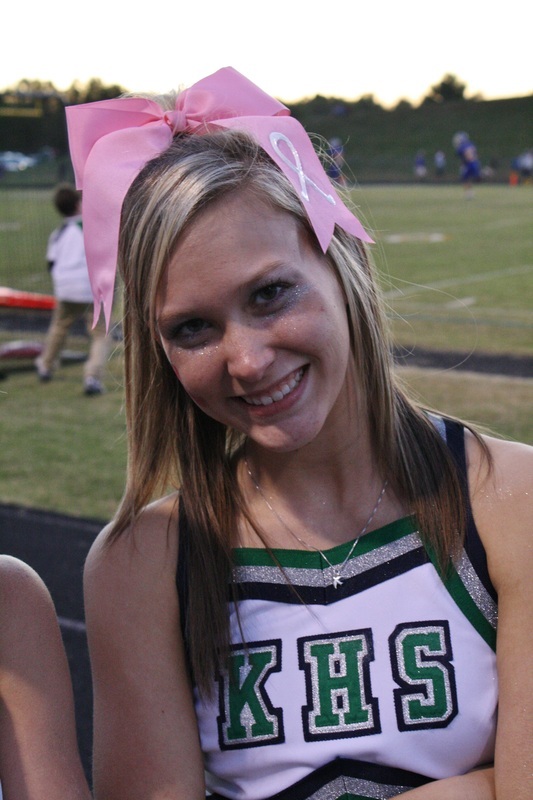 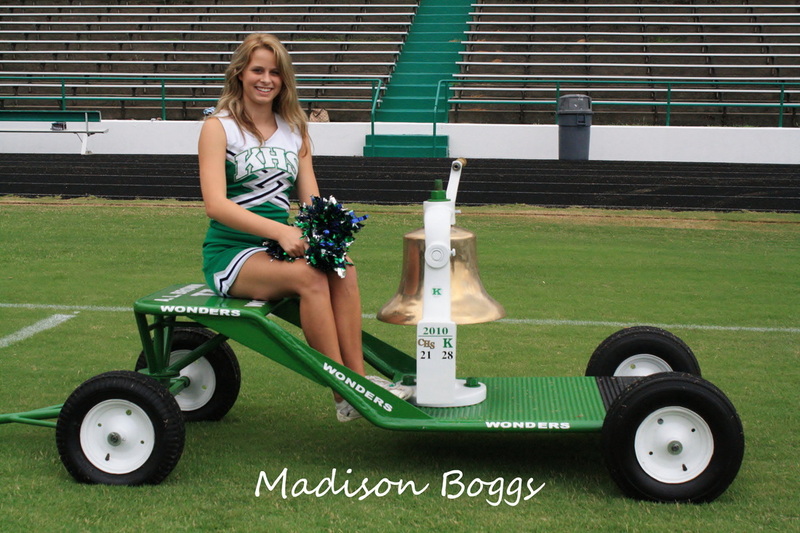 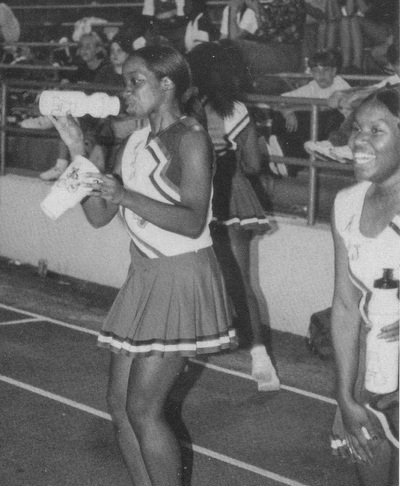 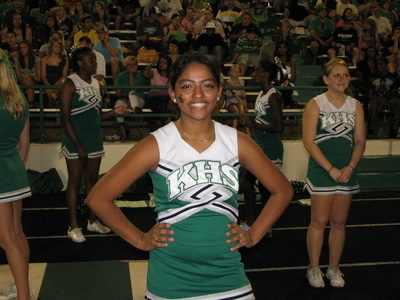 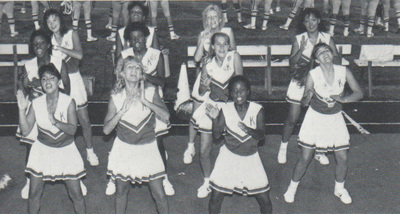 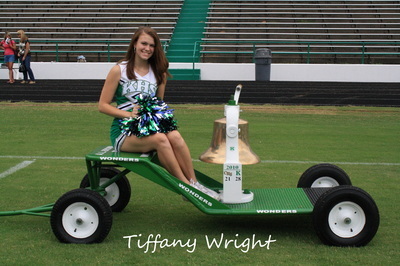 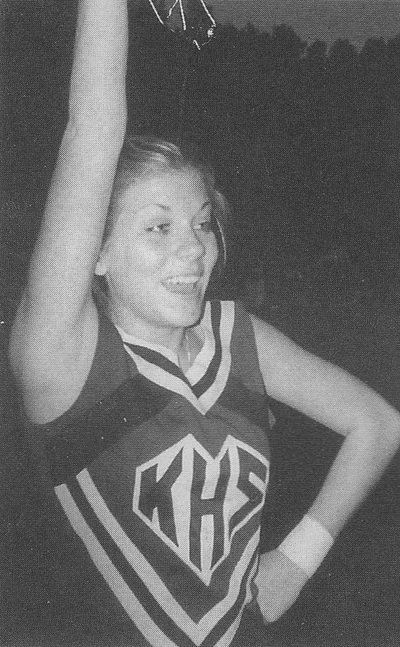 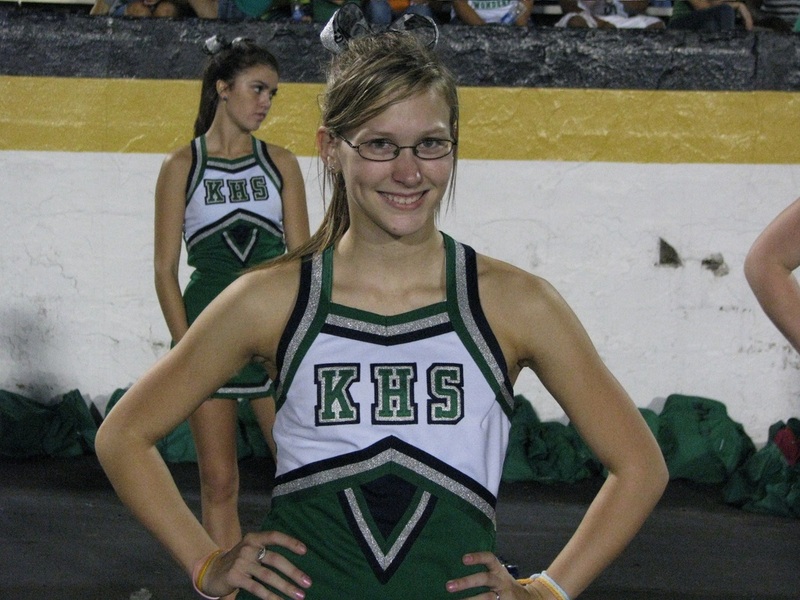 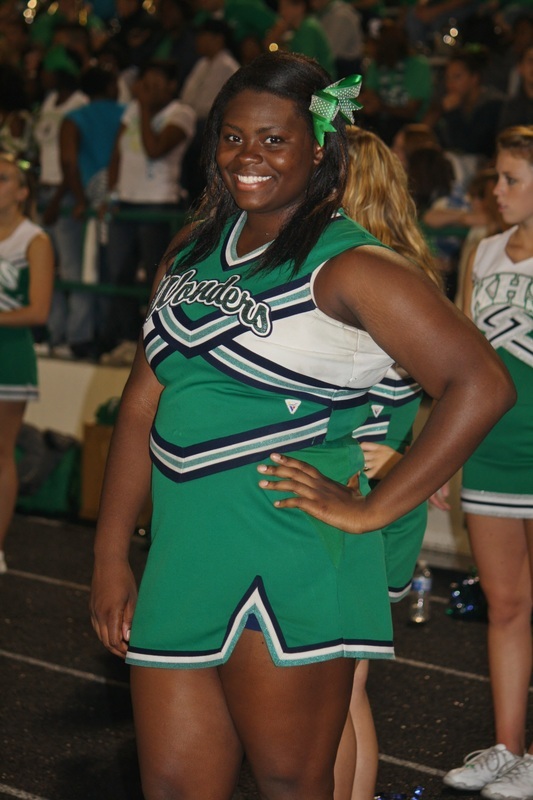 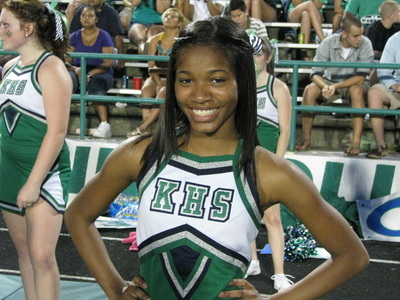 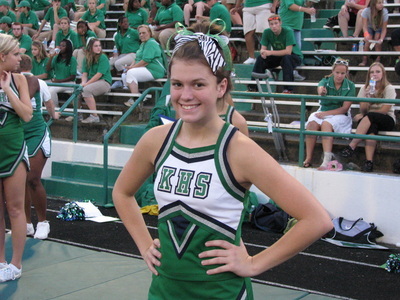 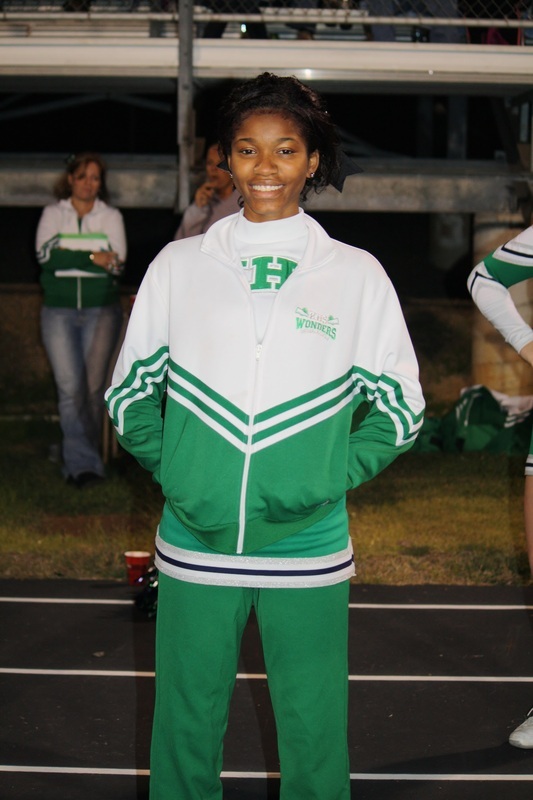 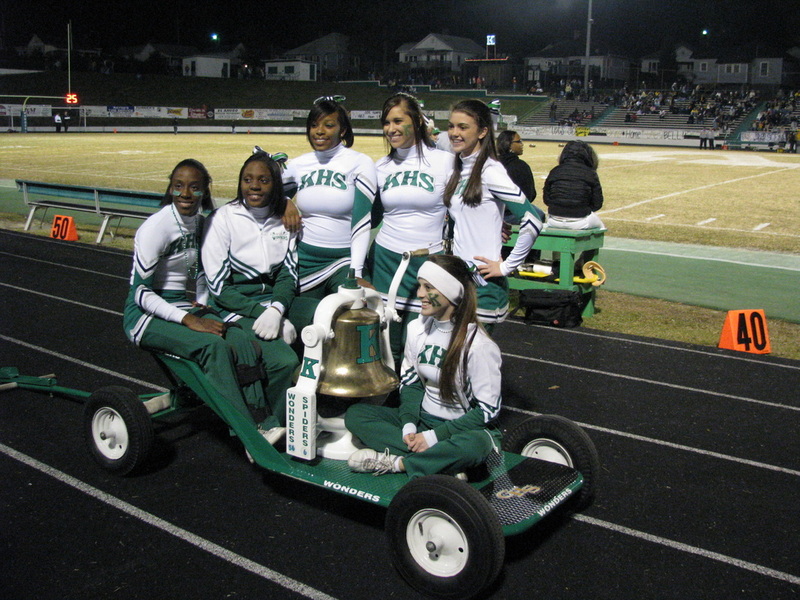 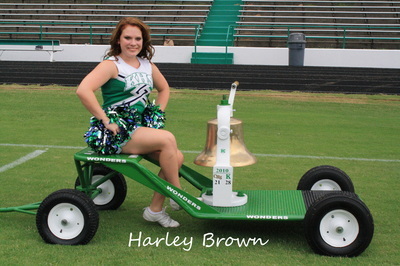 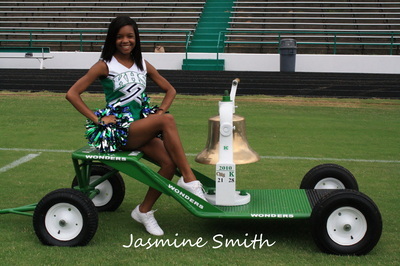 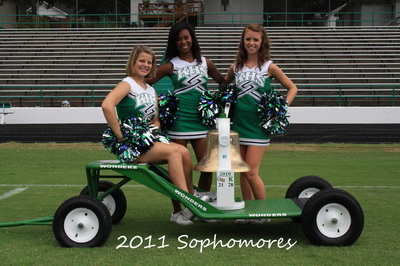 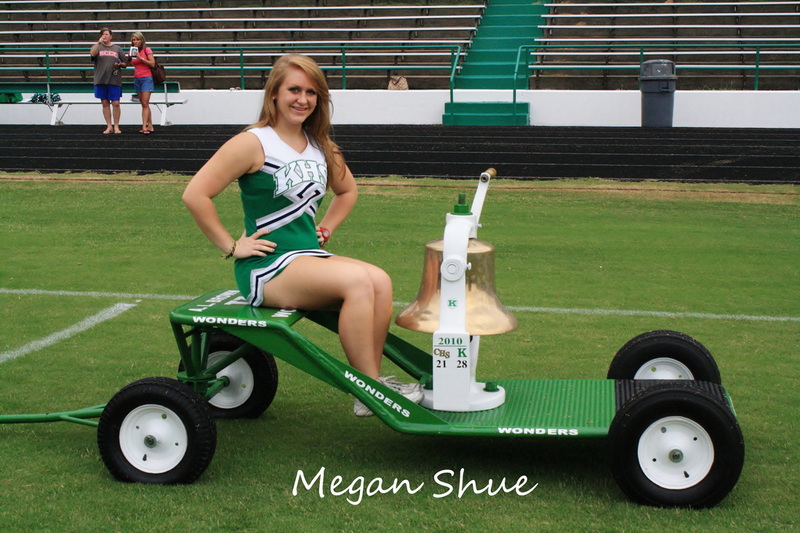 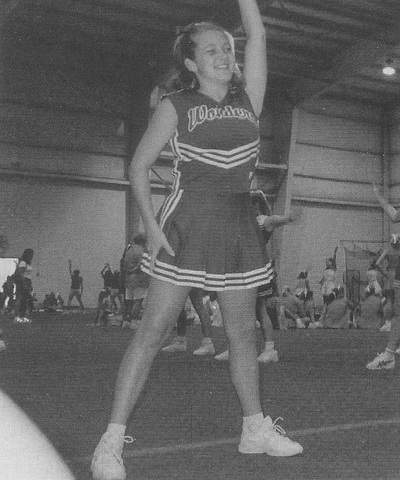 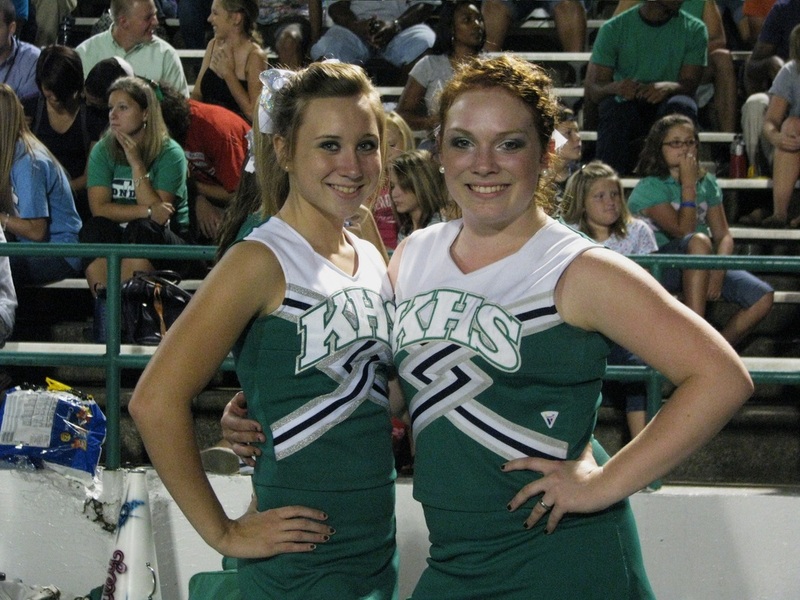 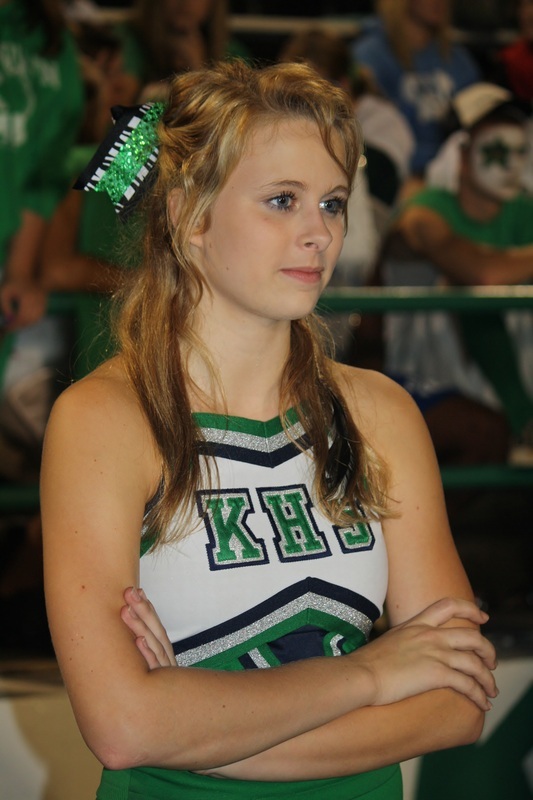 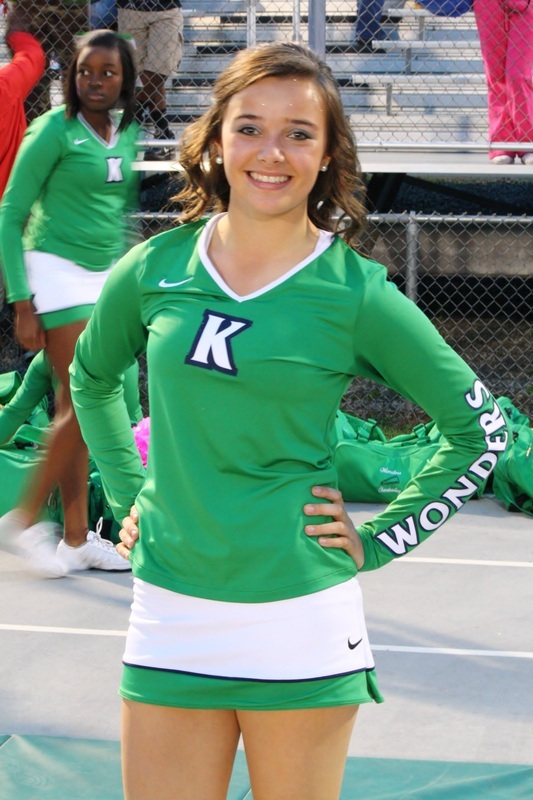 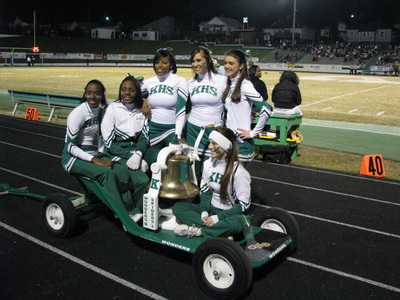 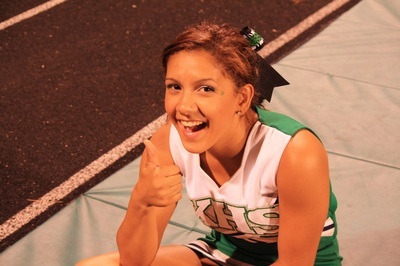 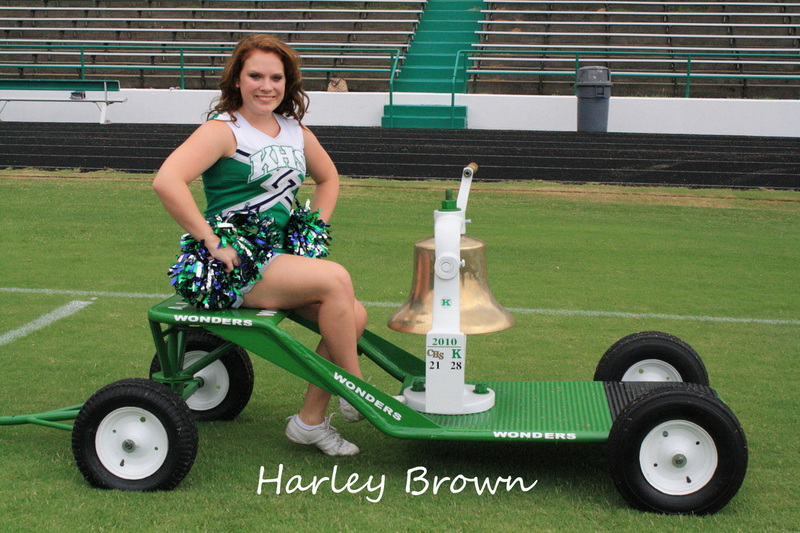 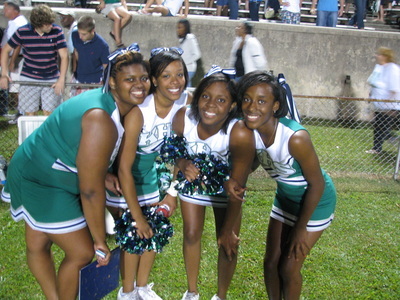 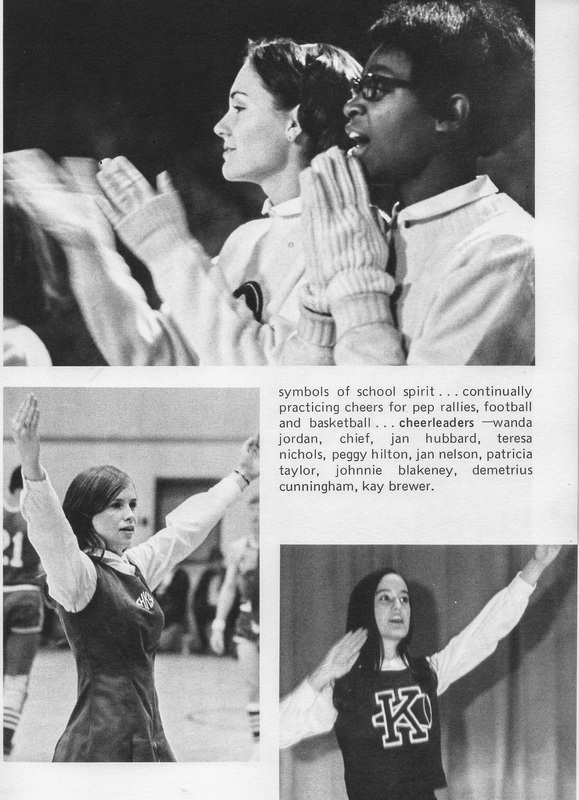 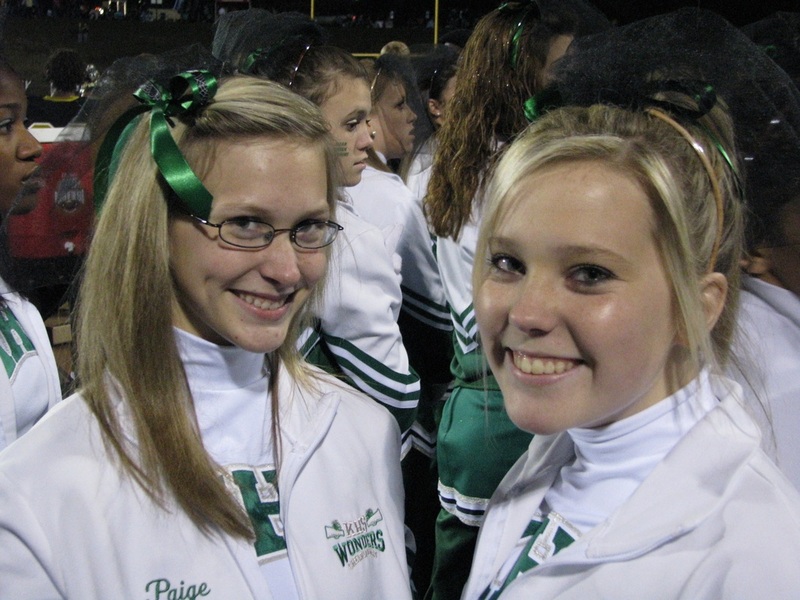 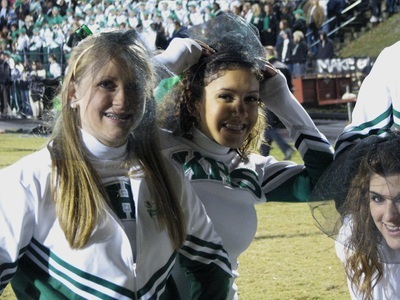 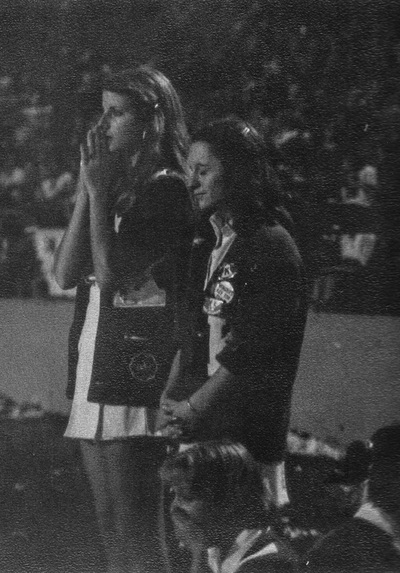 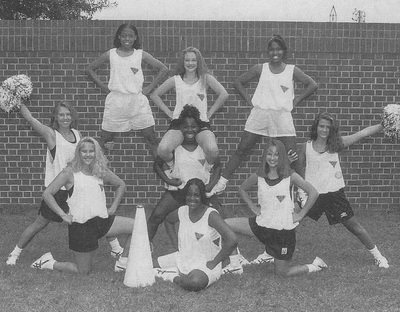 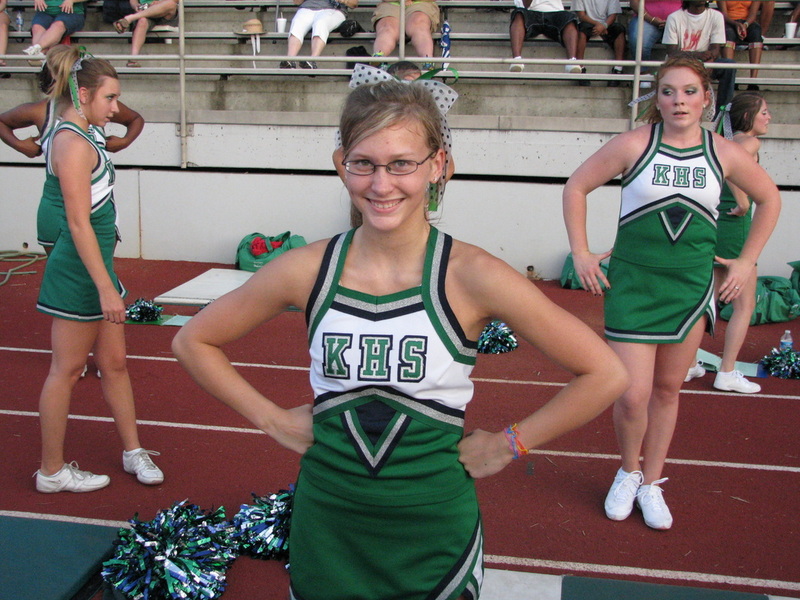 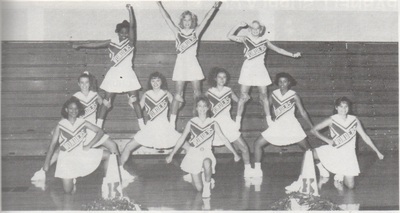 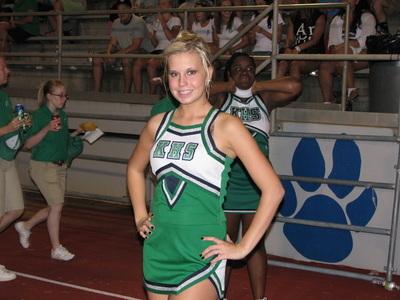 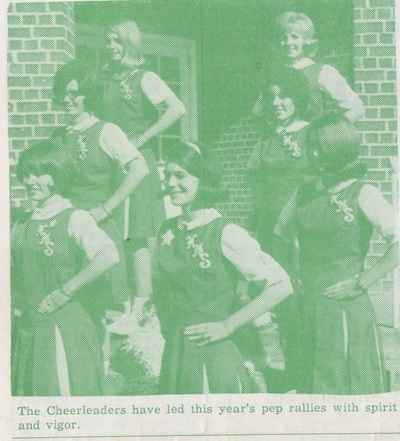 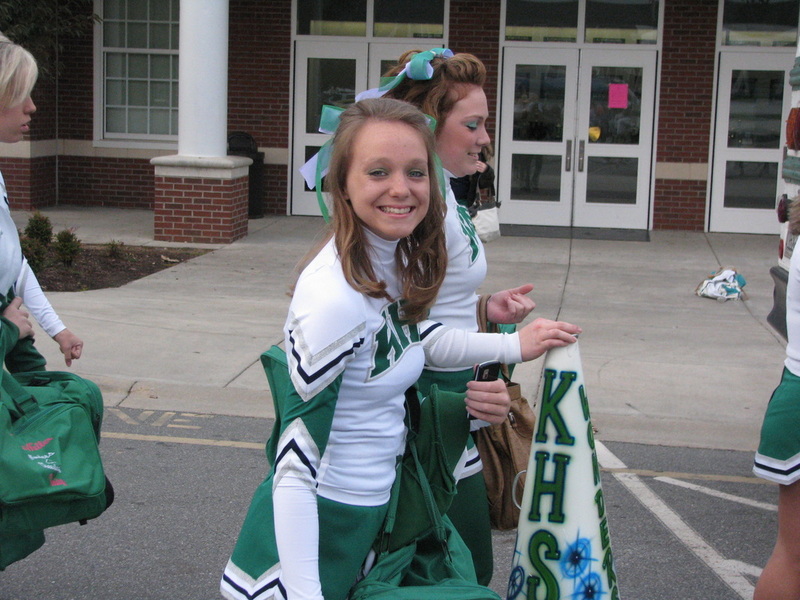 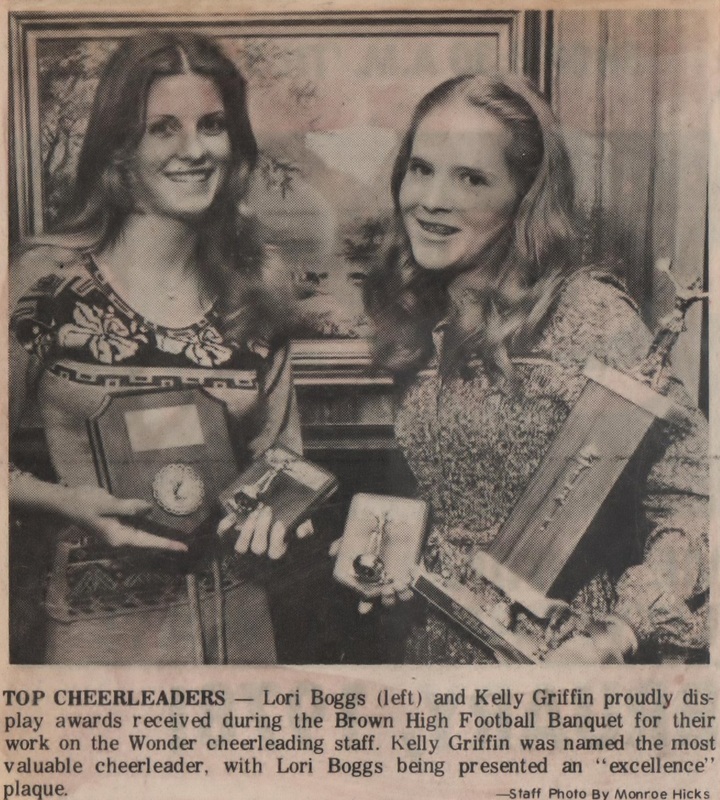 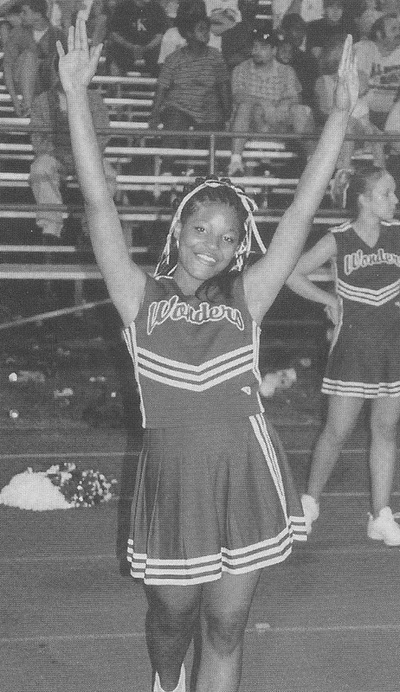 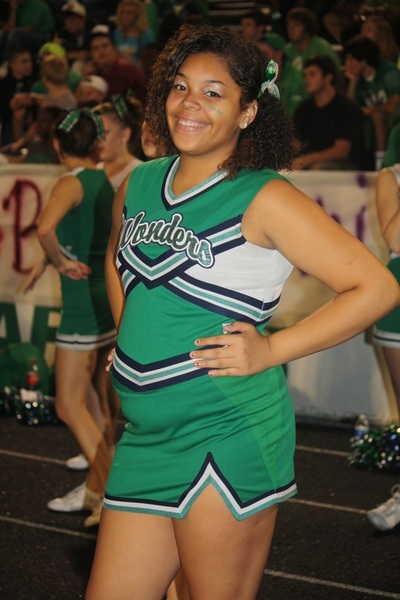 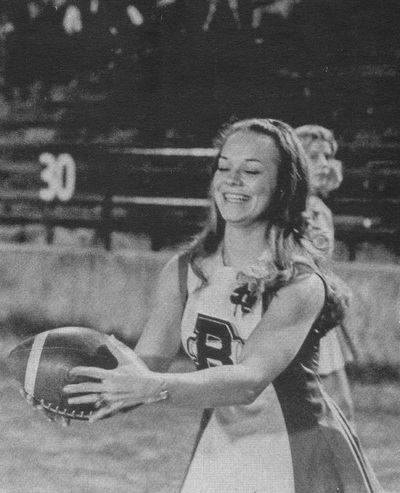 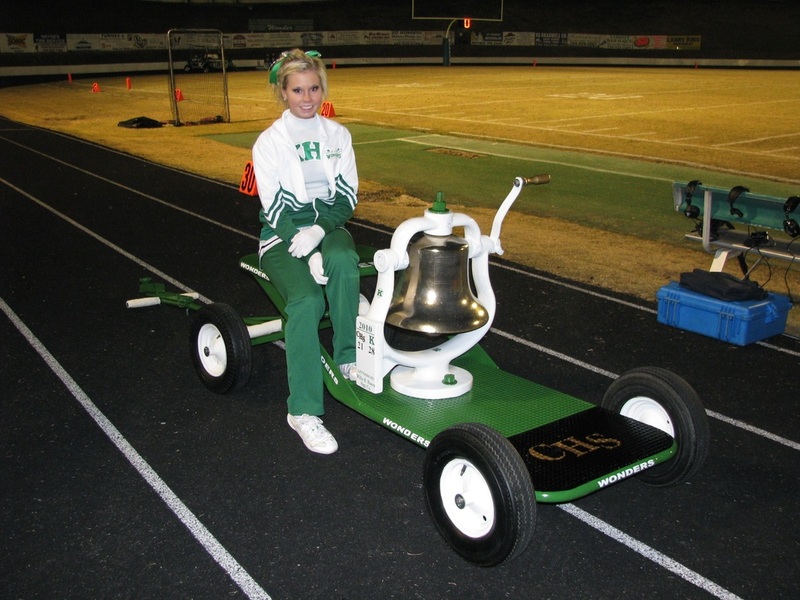 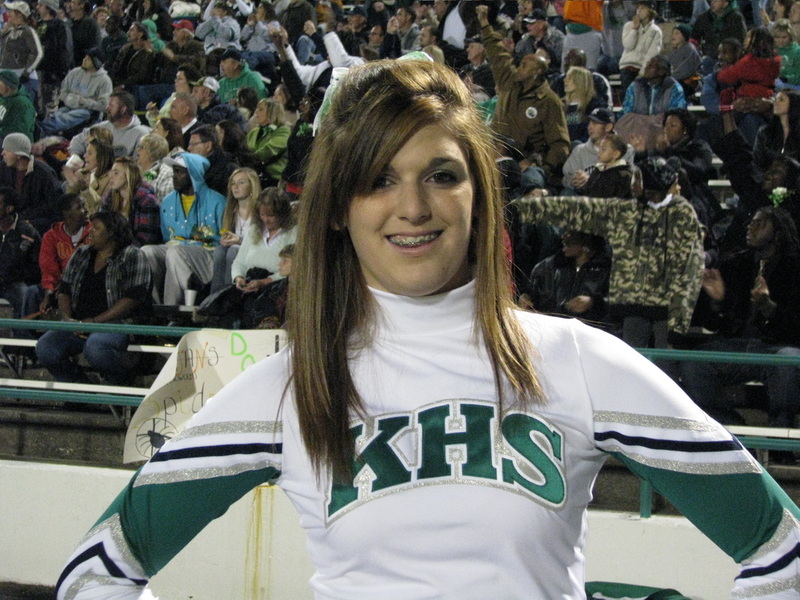 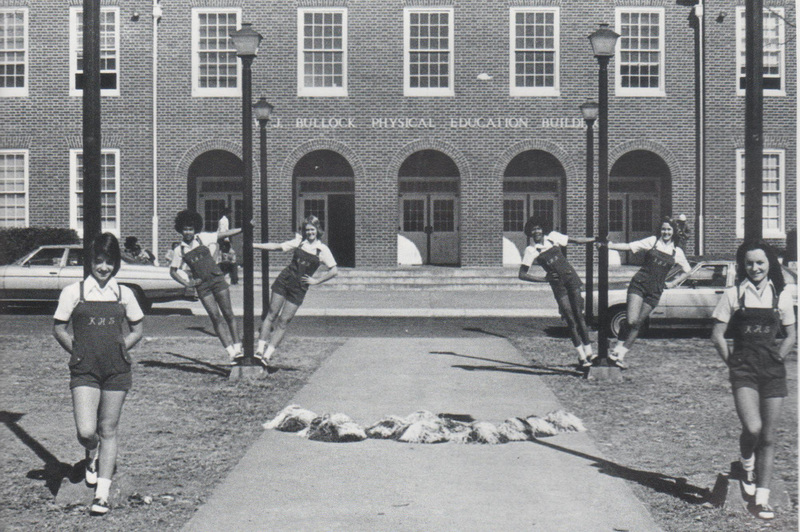 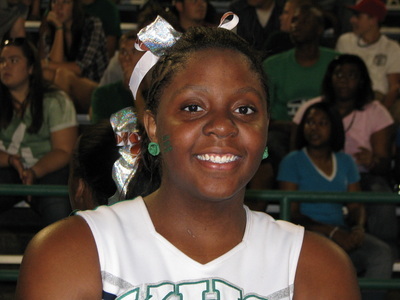 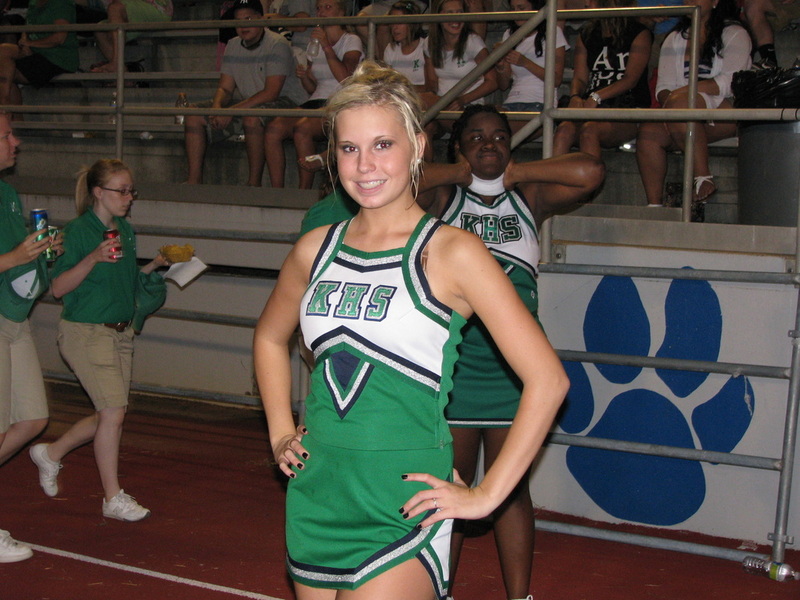 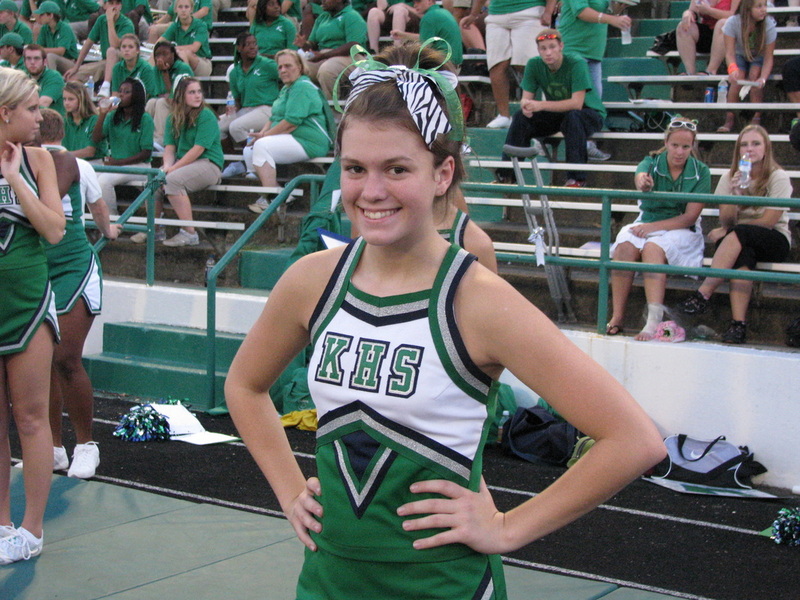 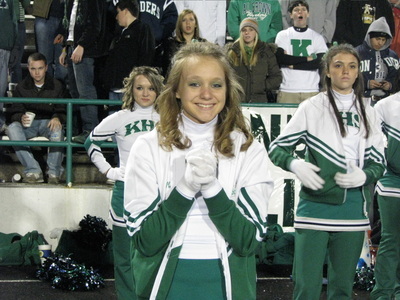 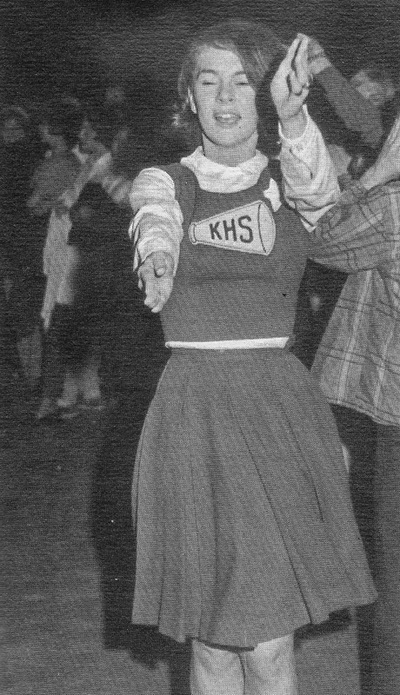 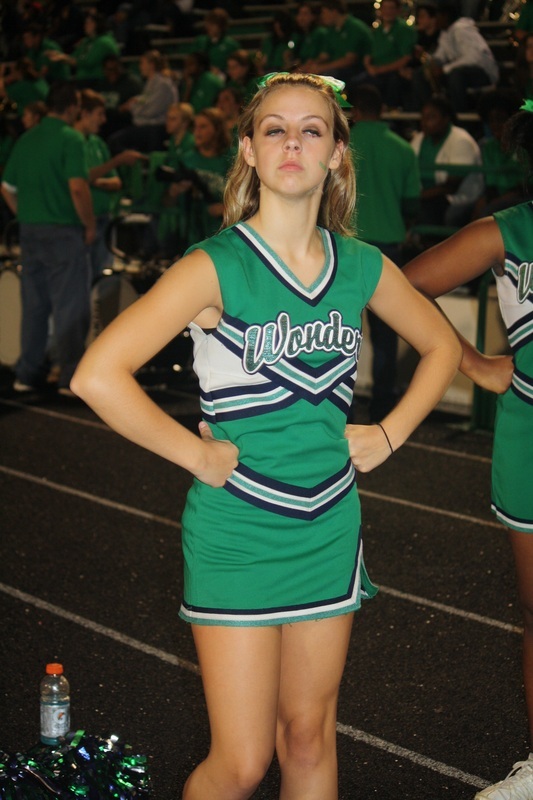 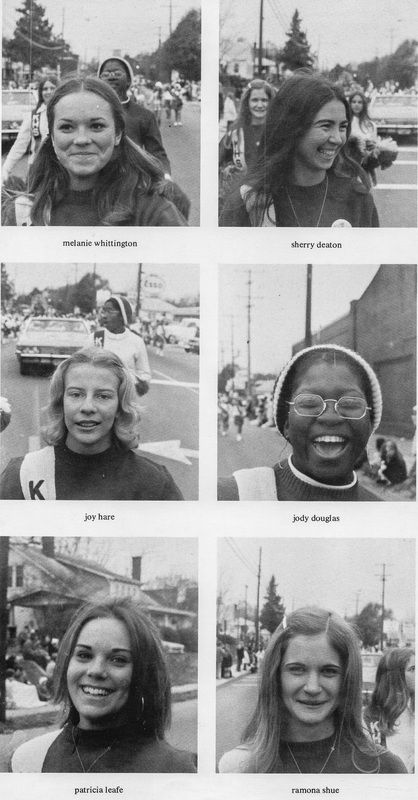 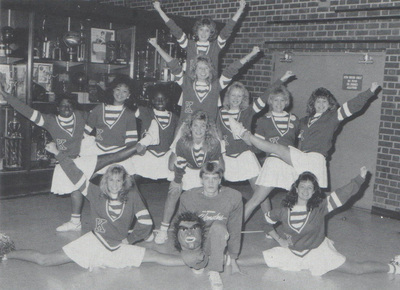 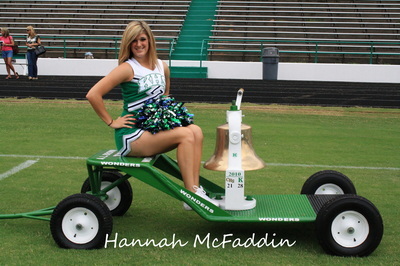 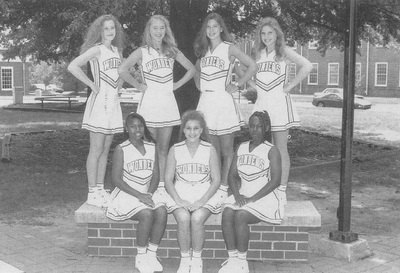 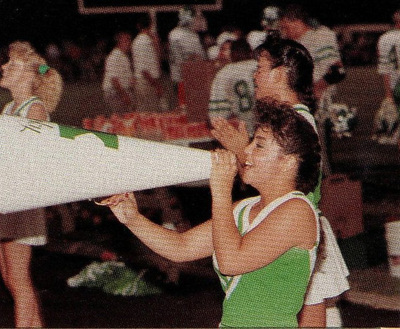 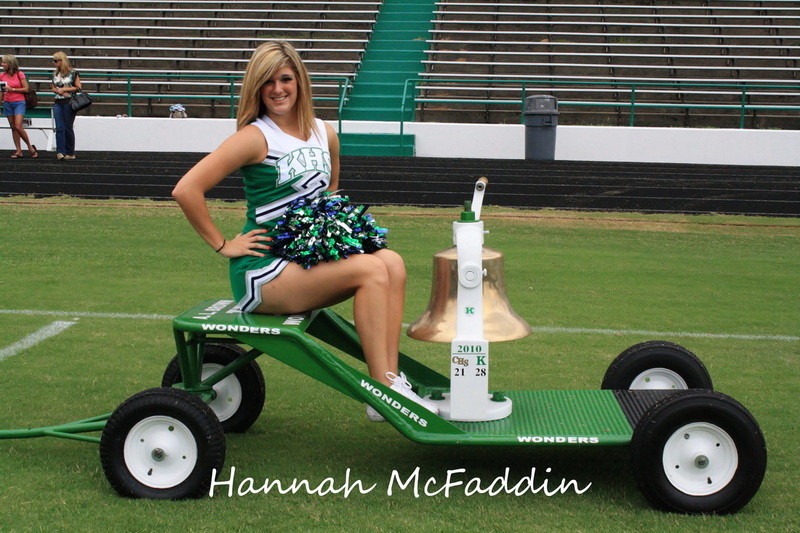 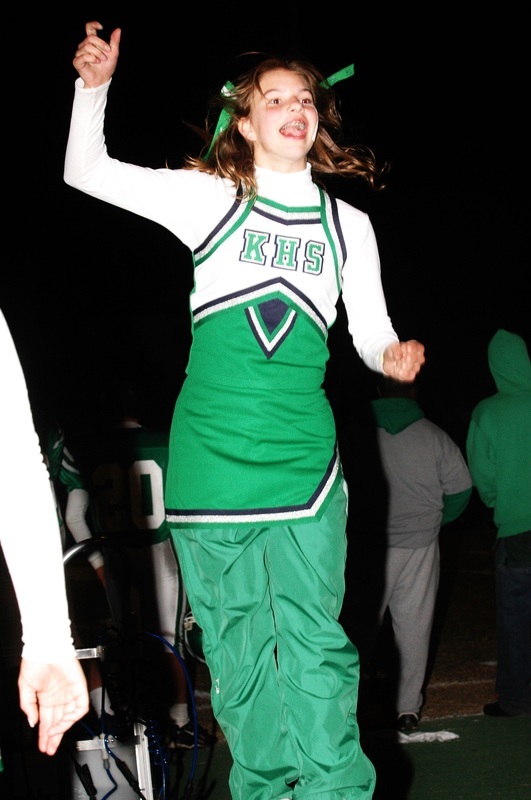 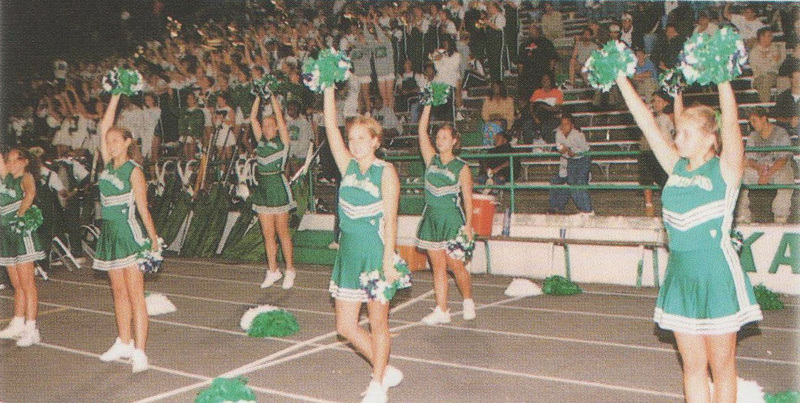 Spirit events such as Concord week and pep rallies were also part of the Wonder Cheerleader's responsibilities. The painting of spirit signs and the selling of buttons and ribbons also fell on the shoulders of these young ladies during and after school. Eventually the continuous wear and tear on the varsity cheerleaders handling dual responsibilities for both varsity and junior varsity became a little more than most wanted to take on and a solution was needed. 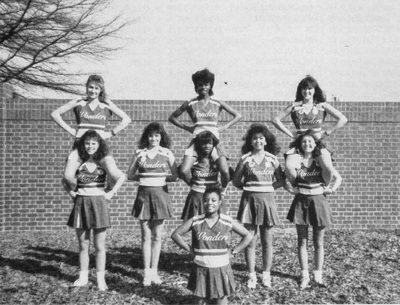 The solution was to form a cheerleading unit that would take sole responsibility of junior varsity football and basketball. 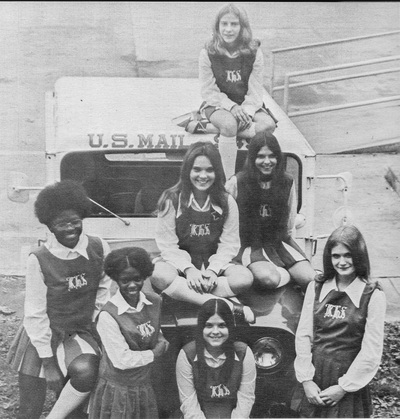 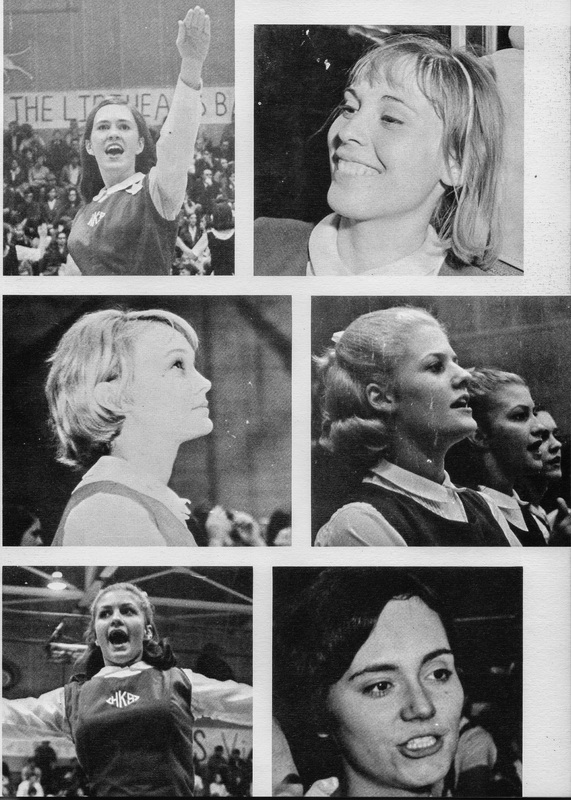 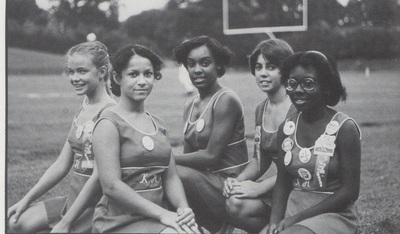 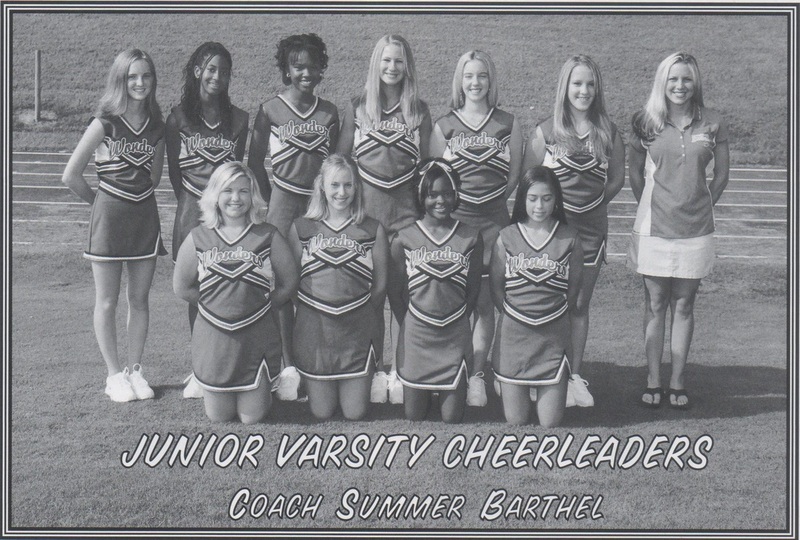 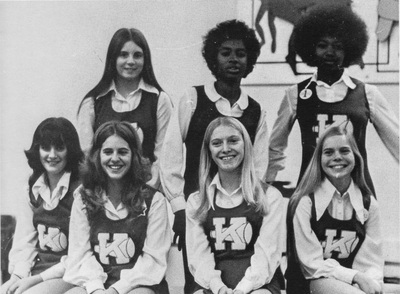 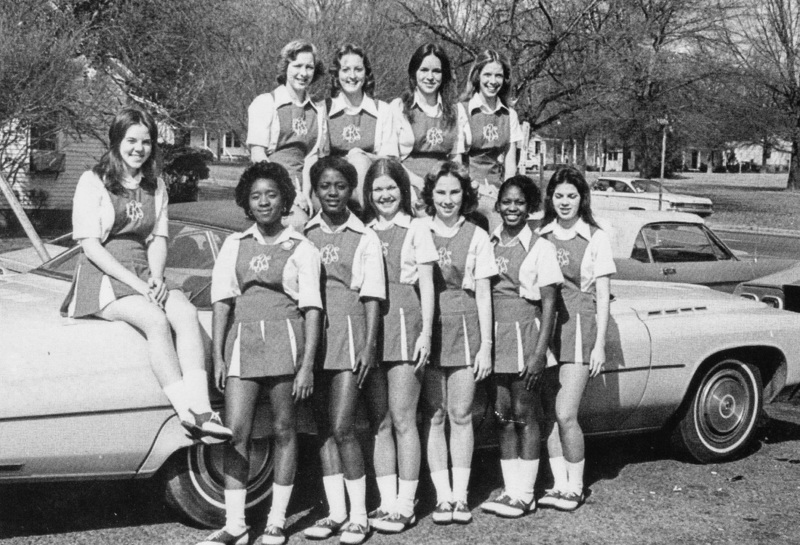 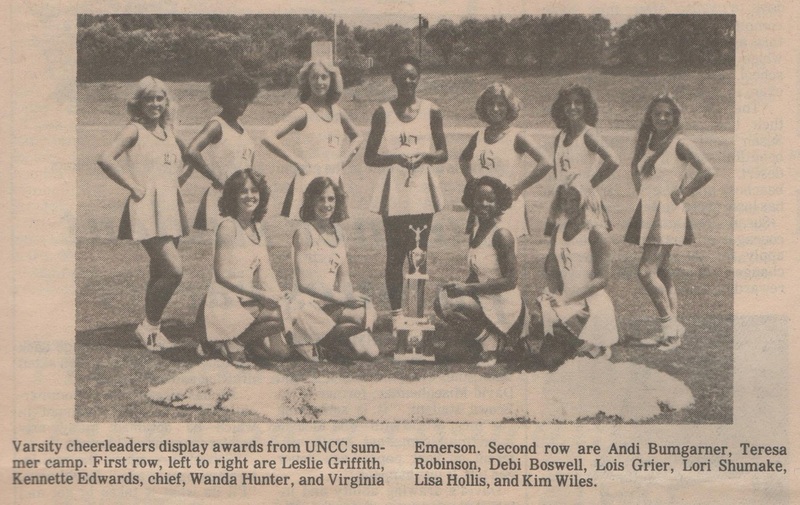 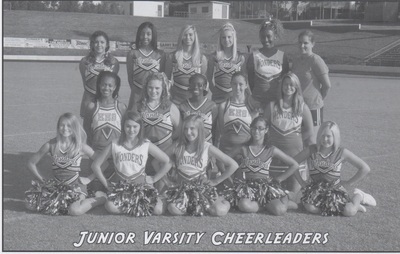 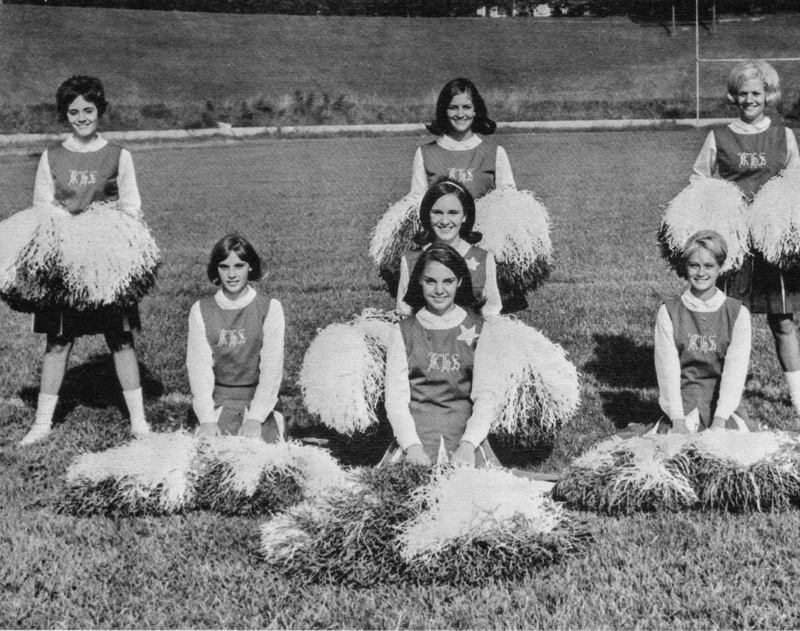 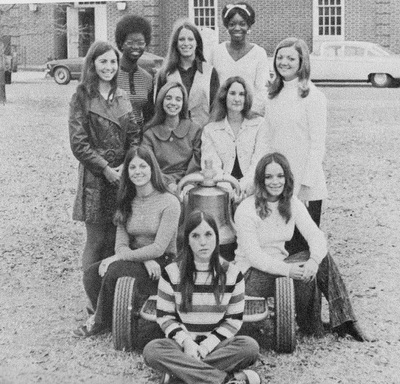 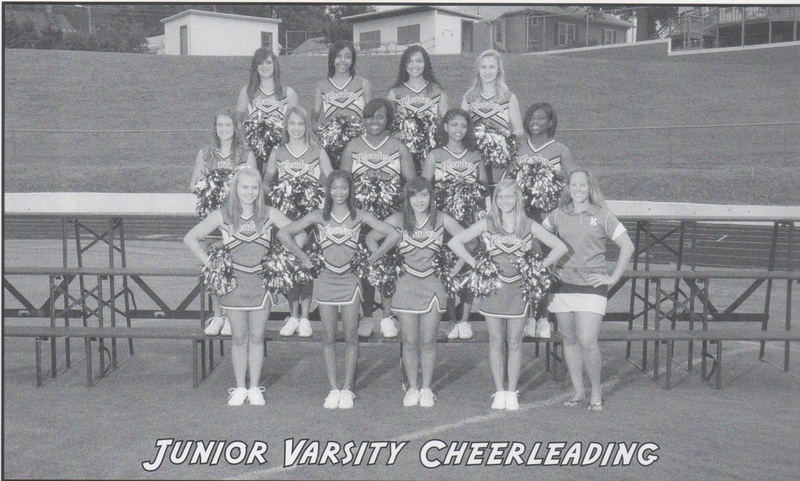 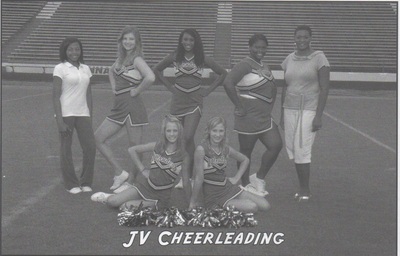 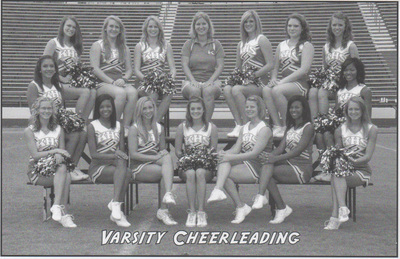 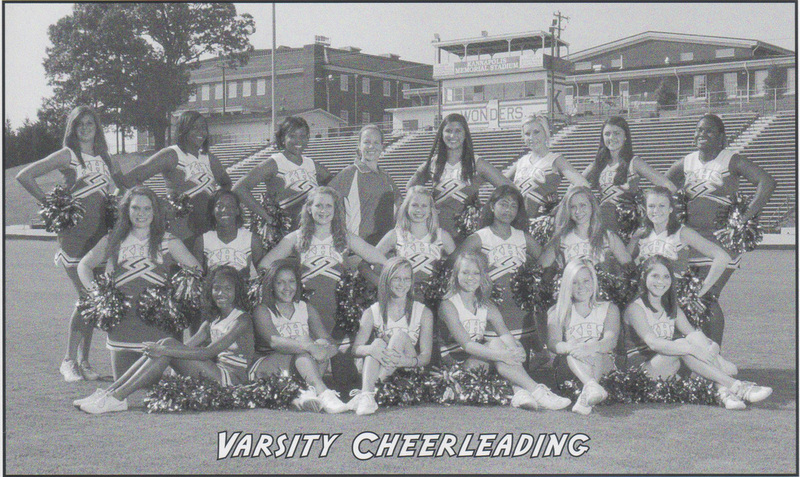 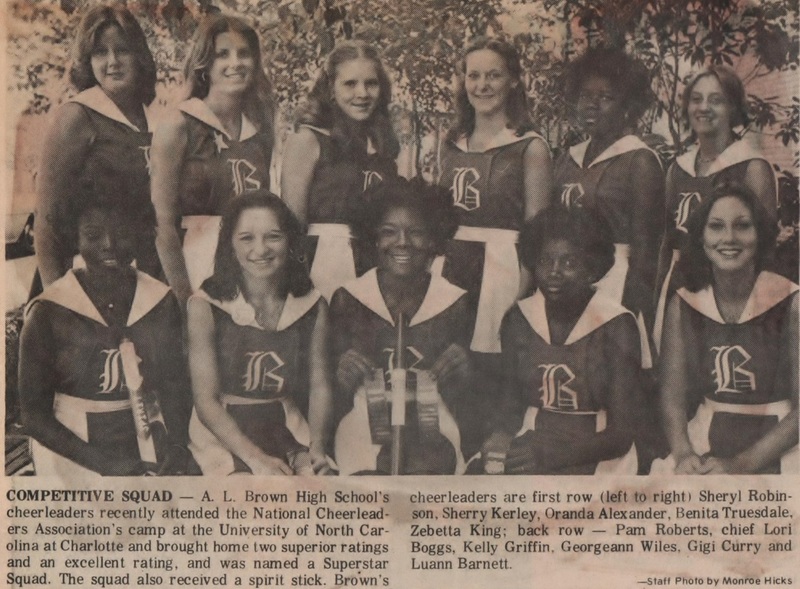 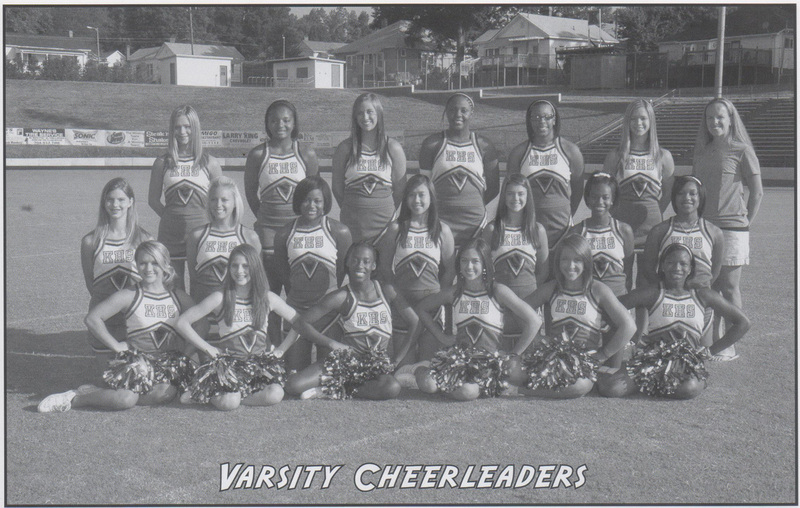 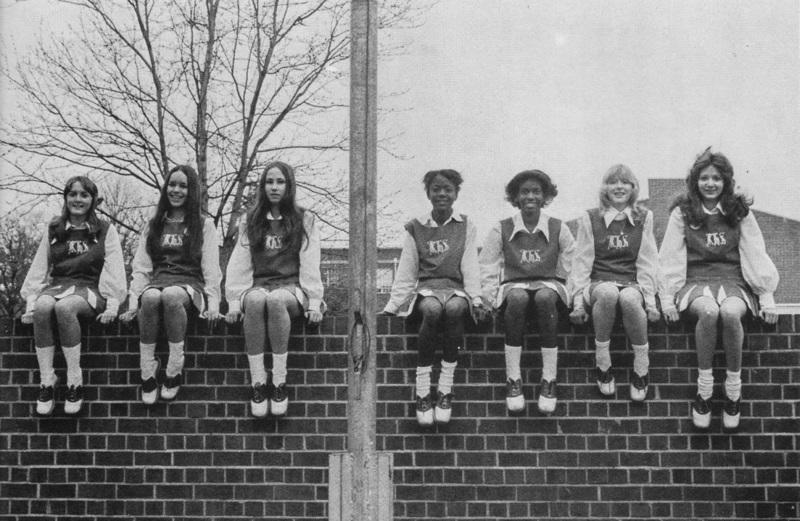 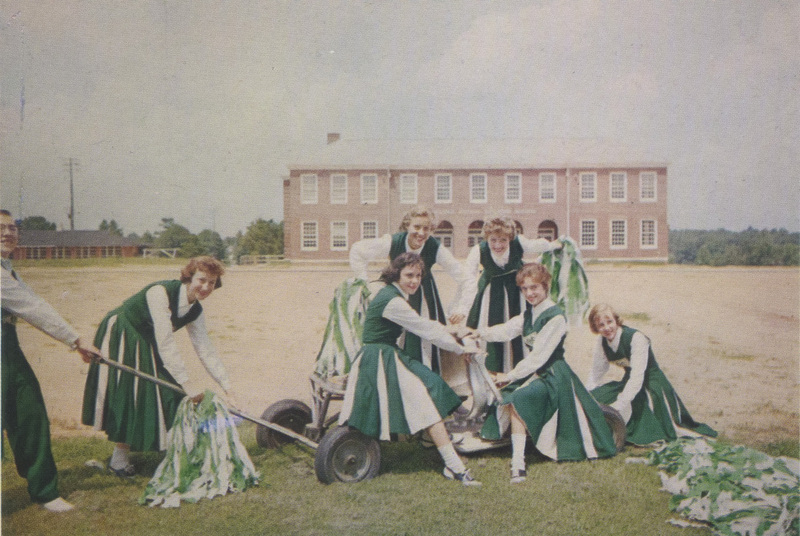 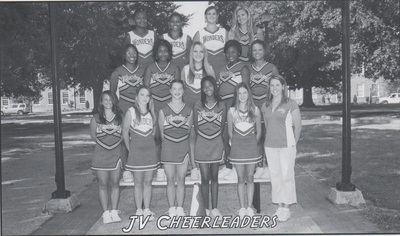 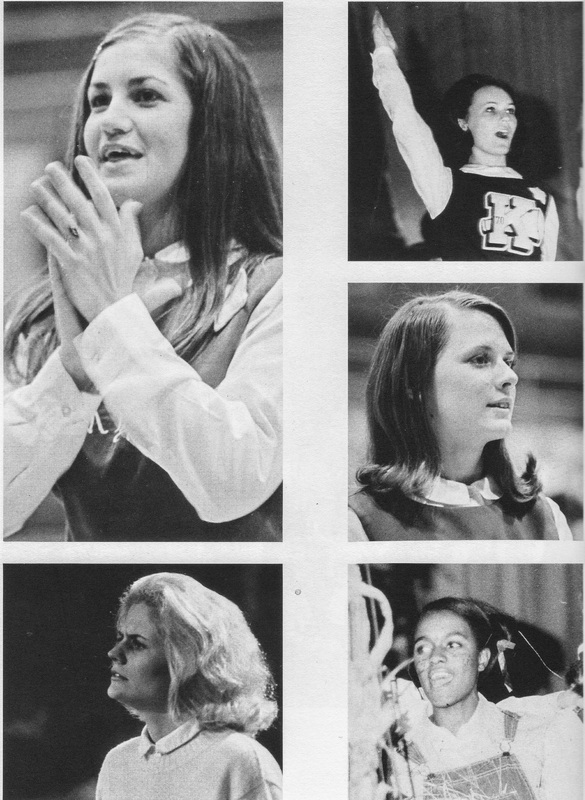 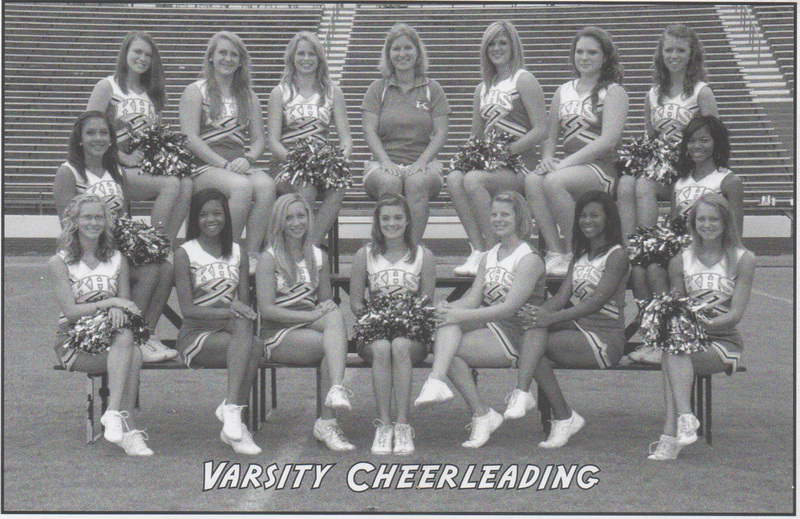 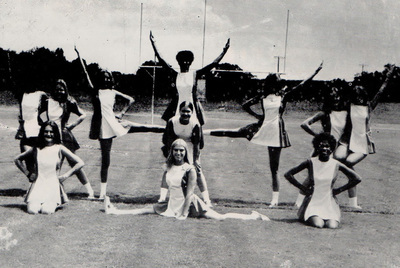 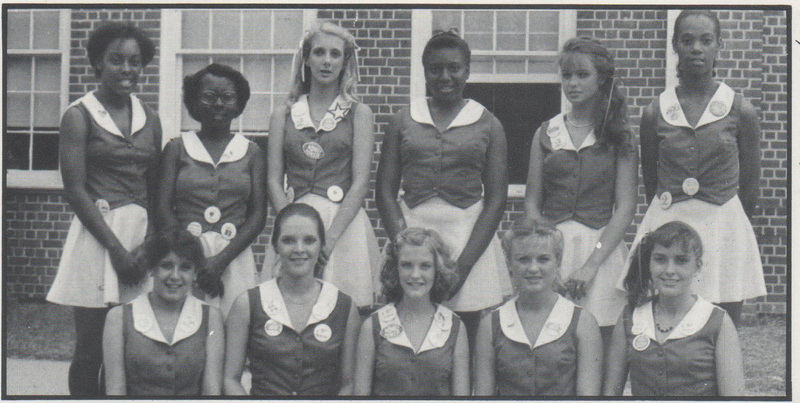 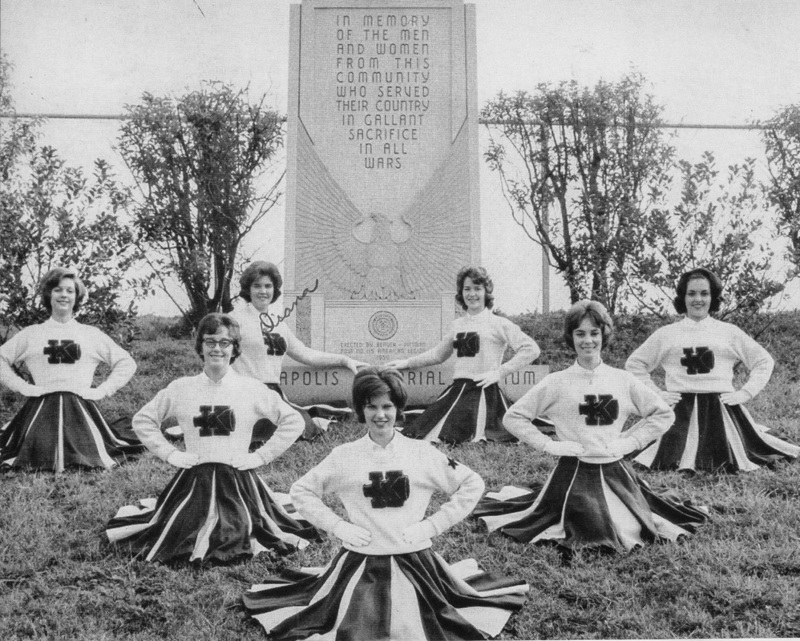 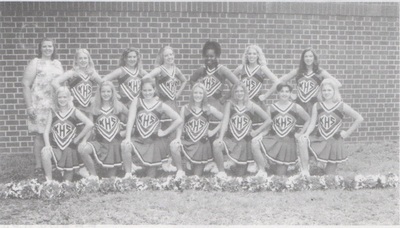 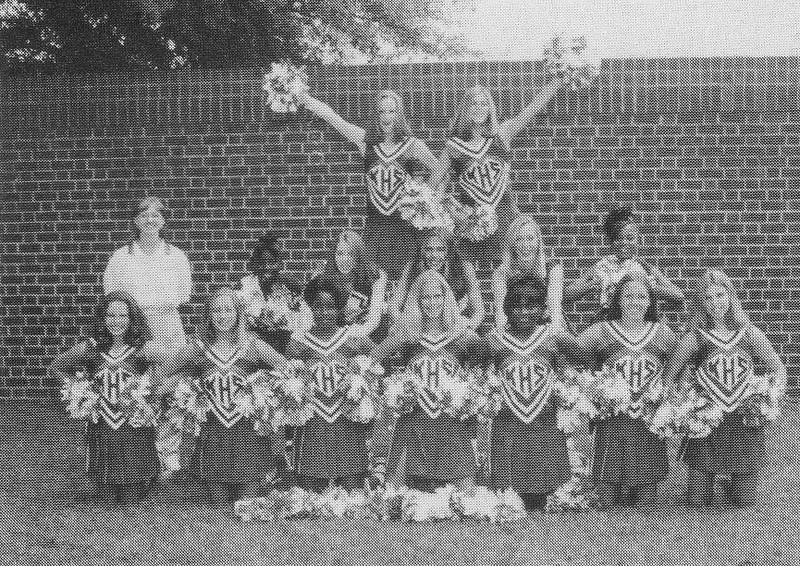 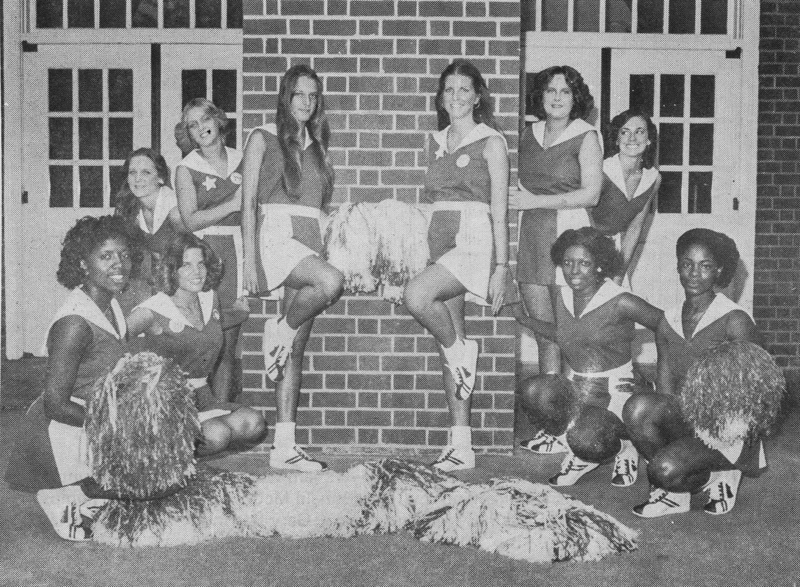 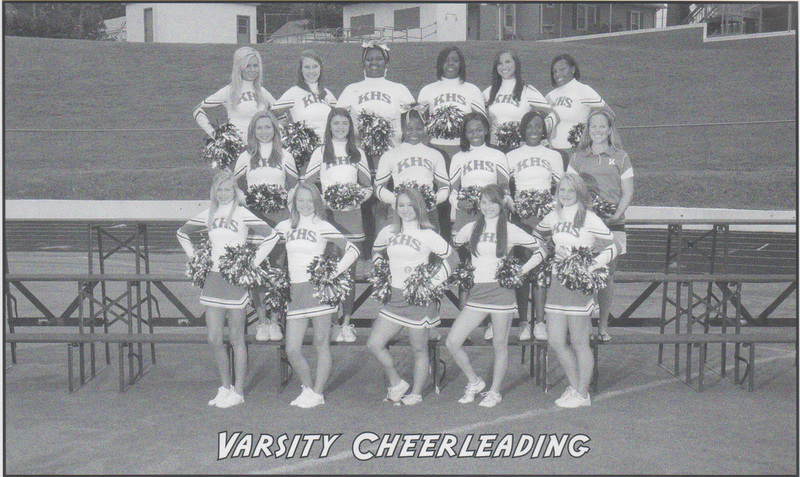 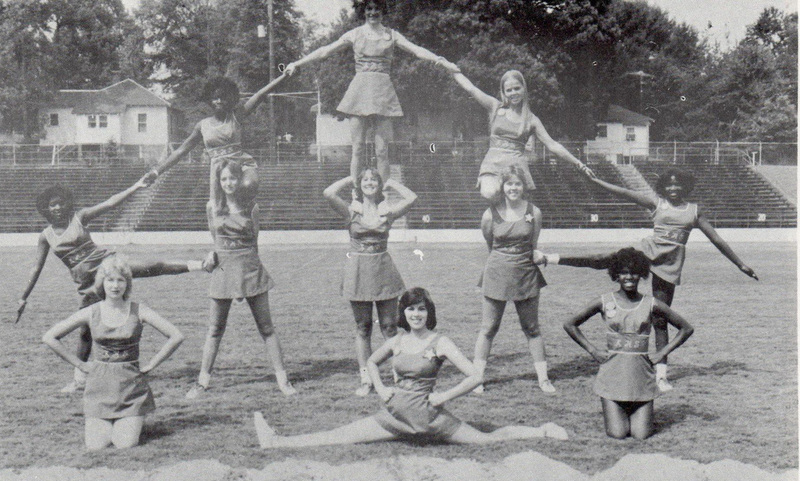 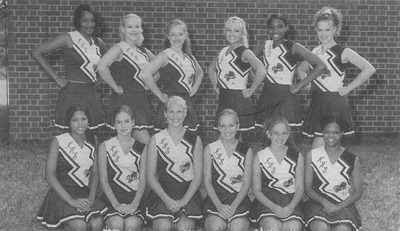 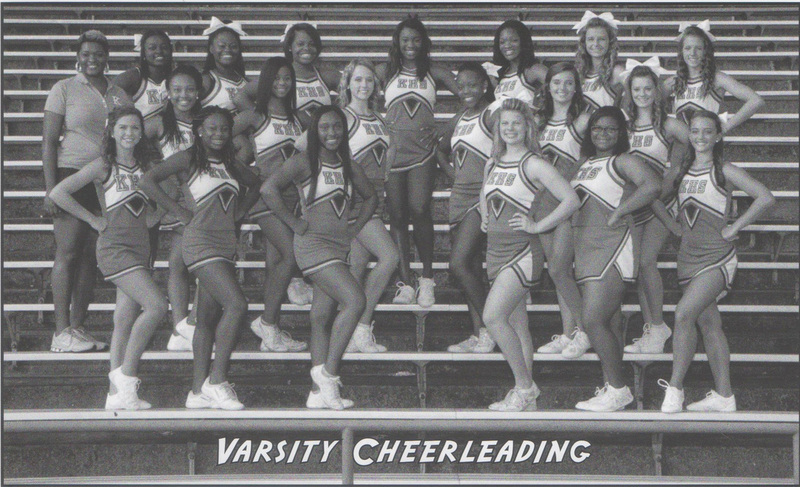 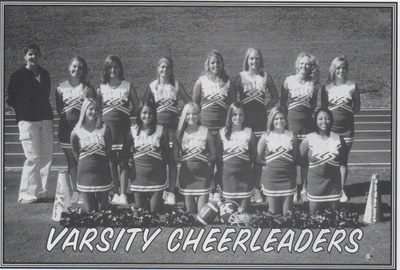 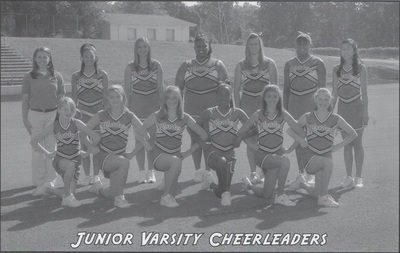 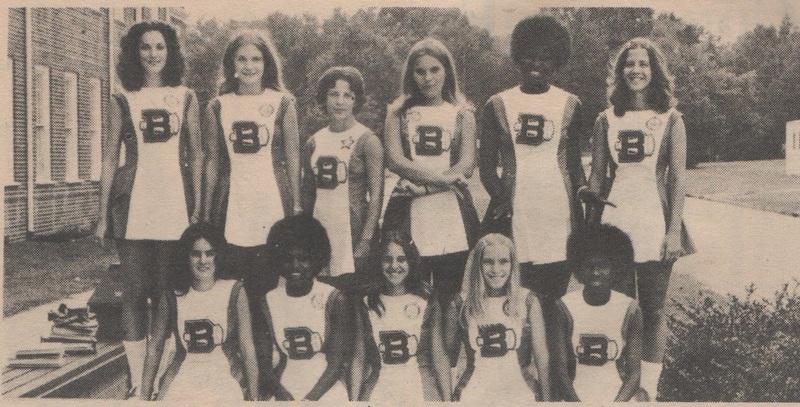 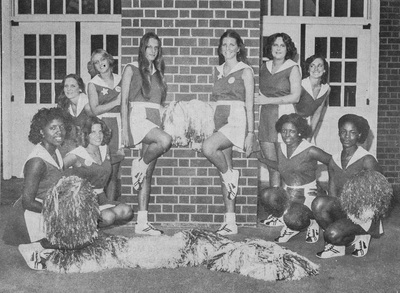 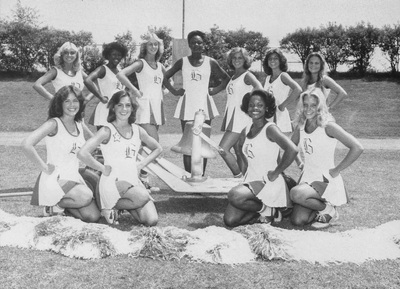 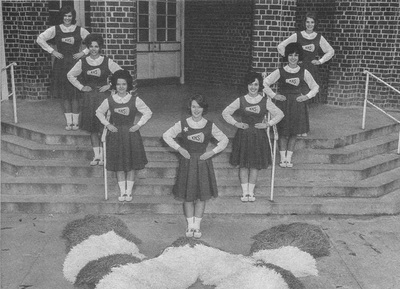 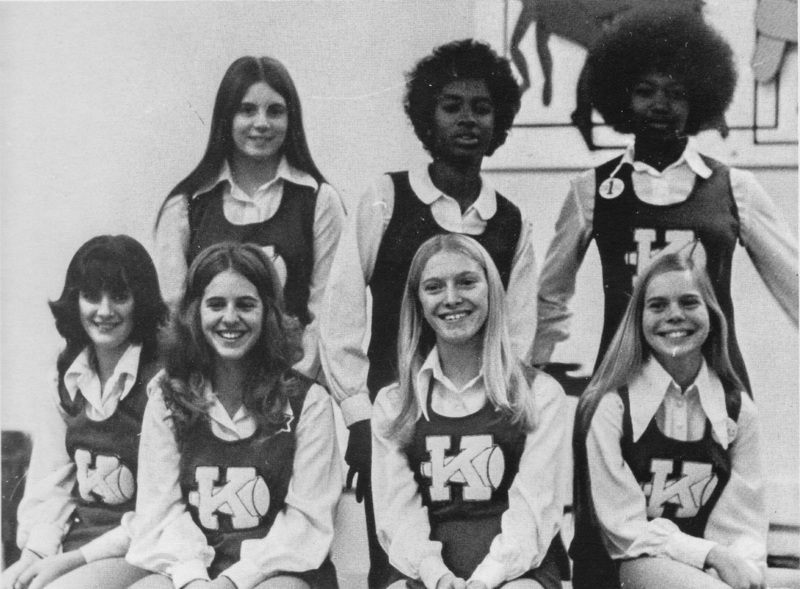 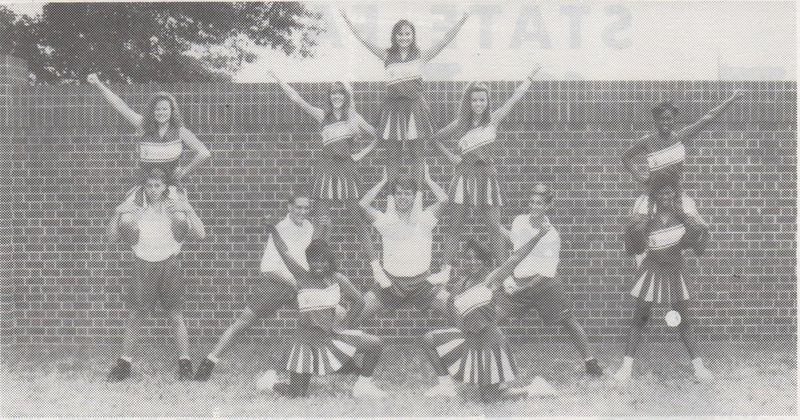 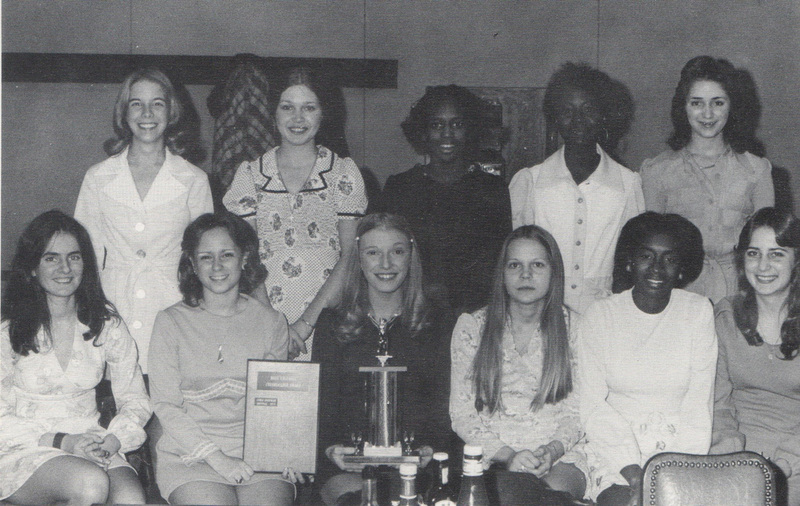 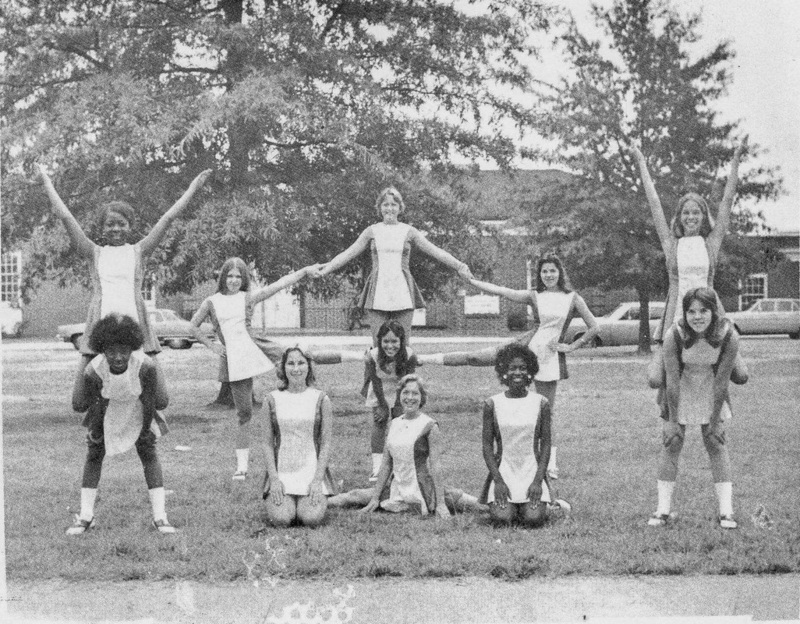 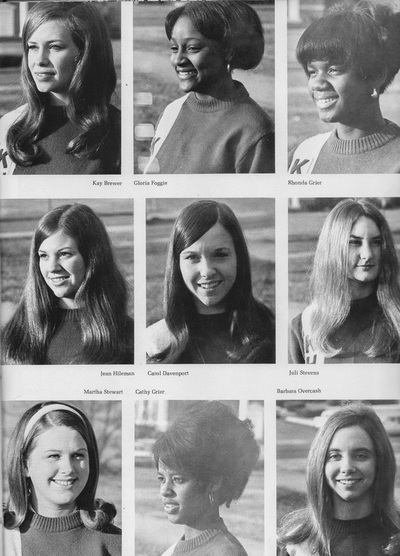 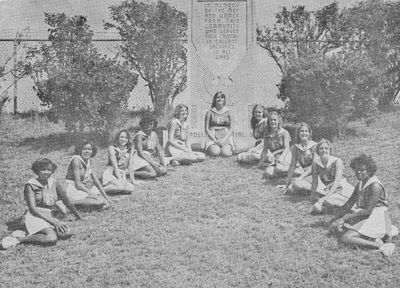 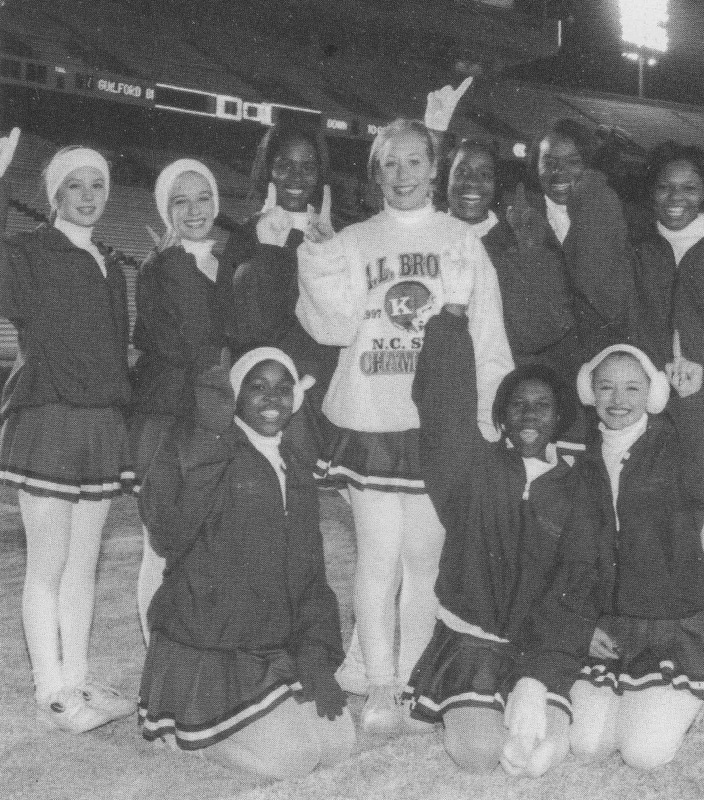 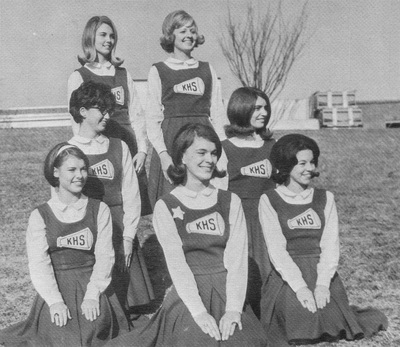 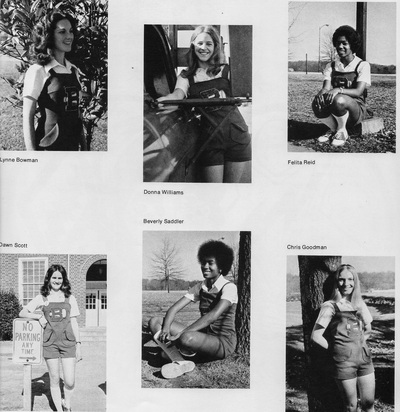 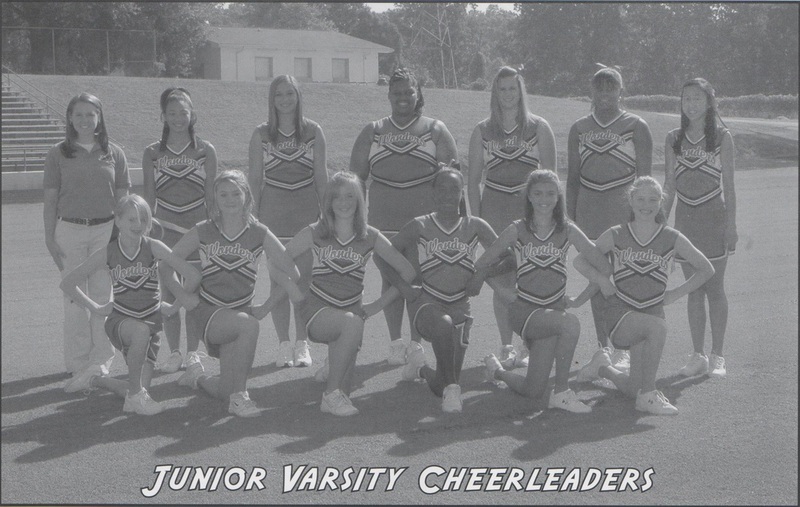 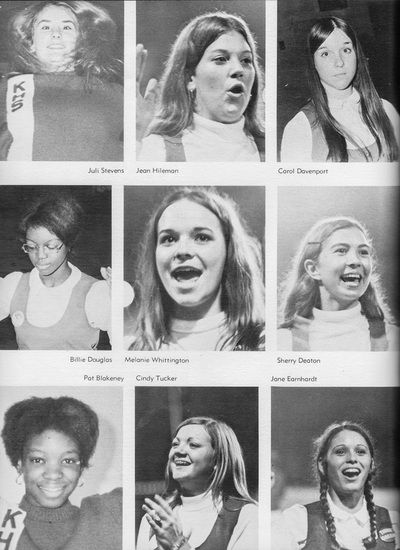 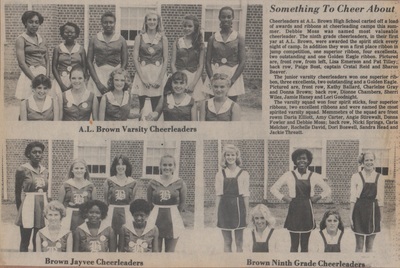 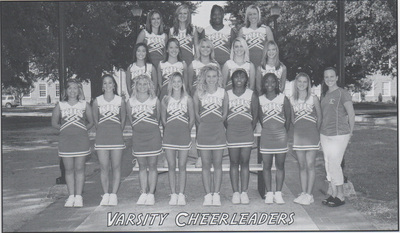 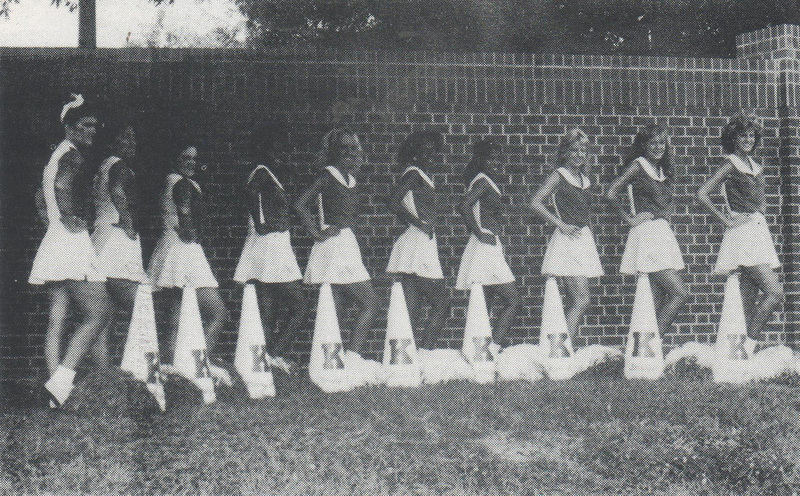 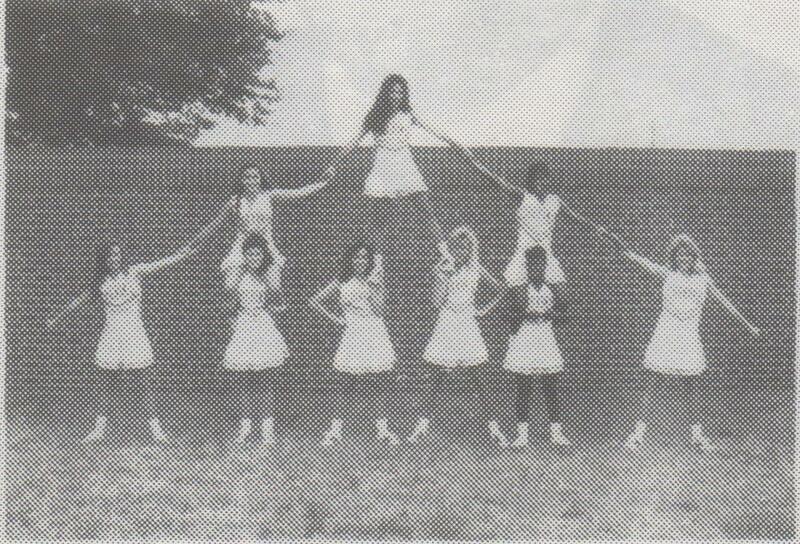 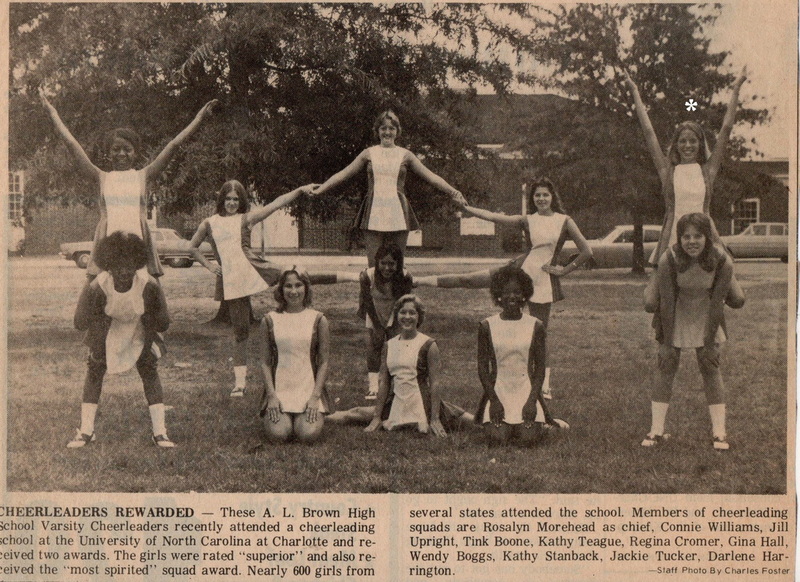 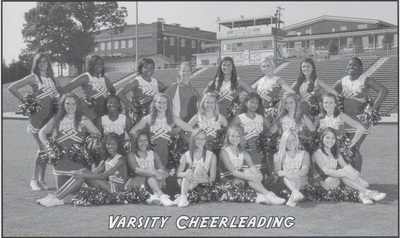 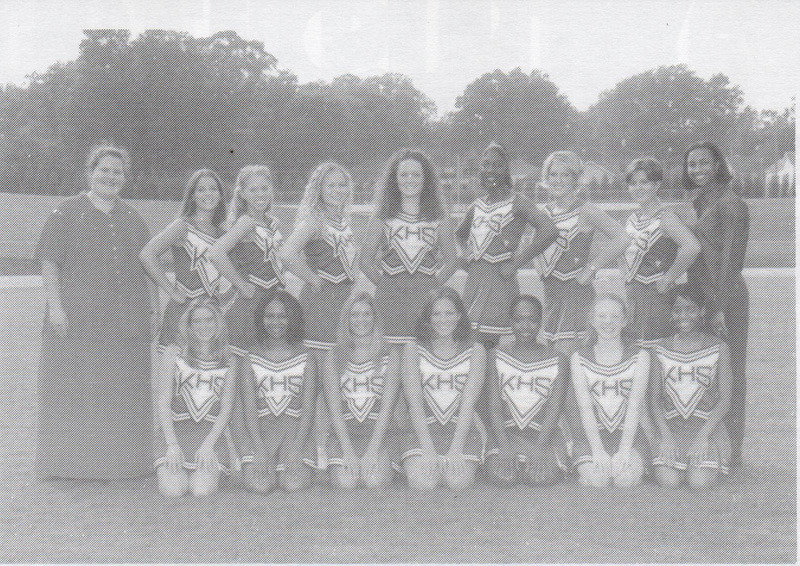 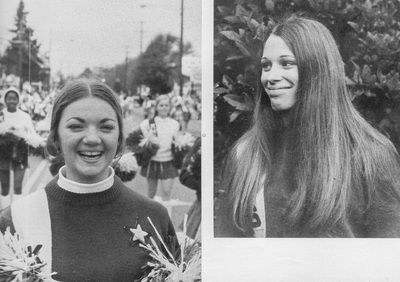 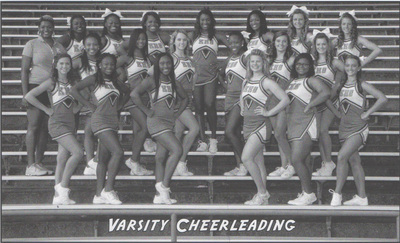 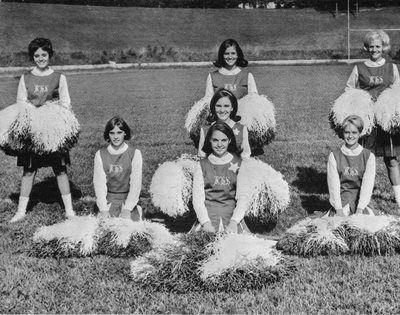 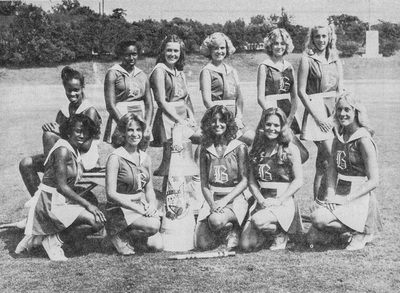 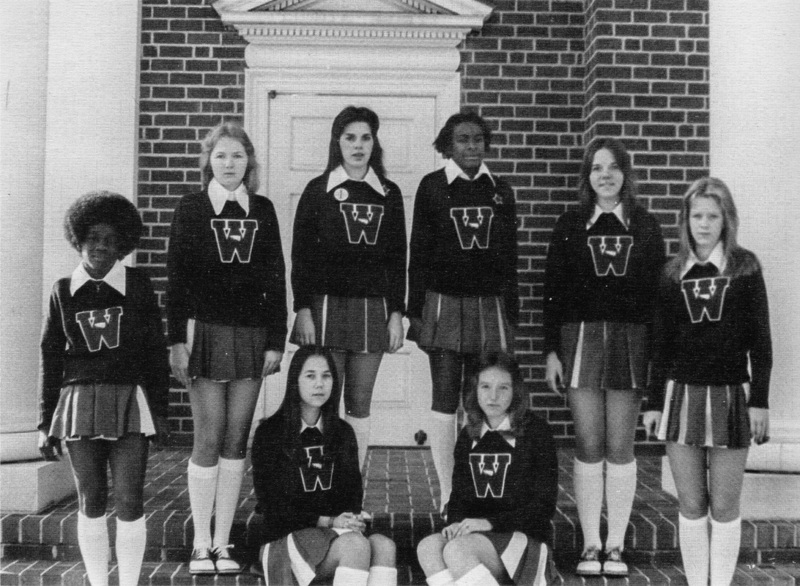 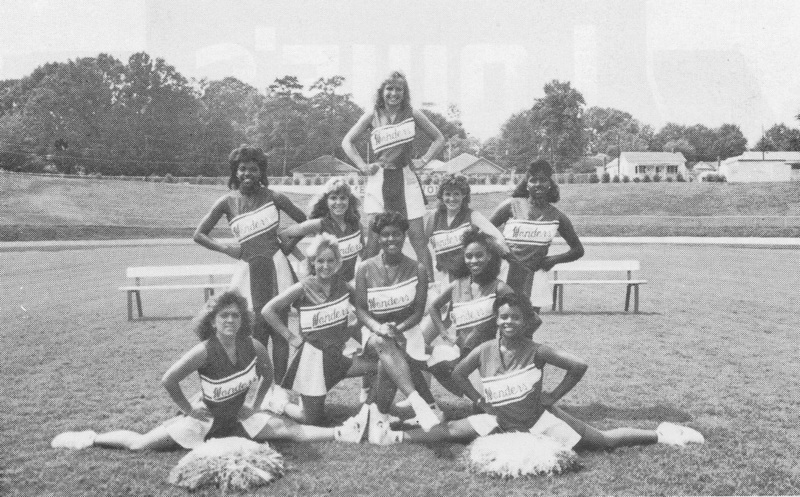 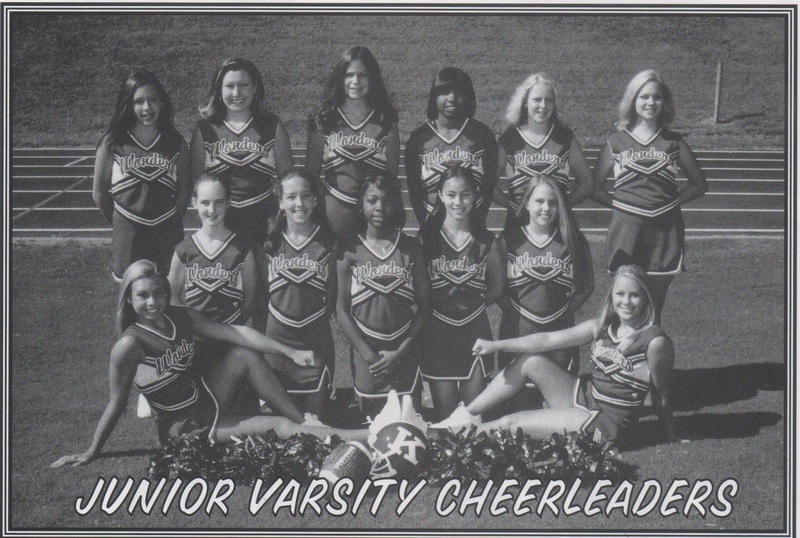 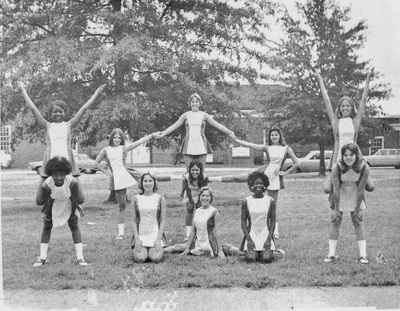 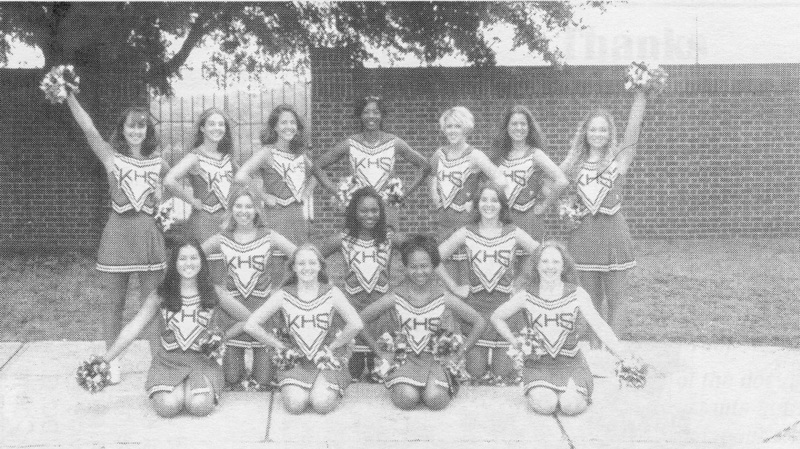 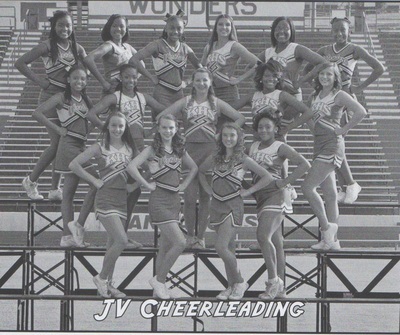 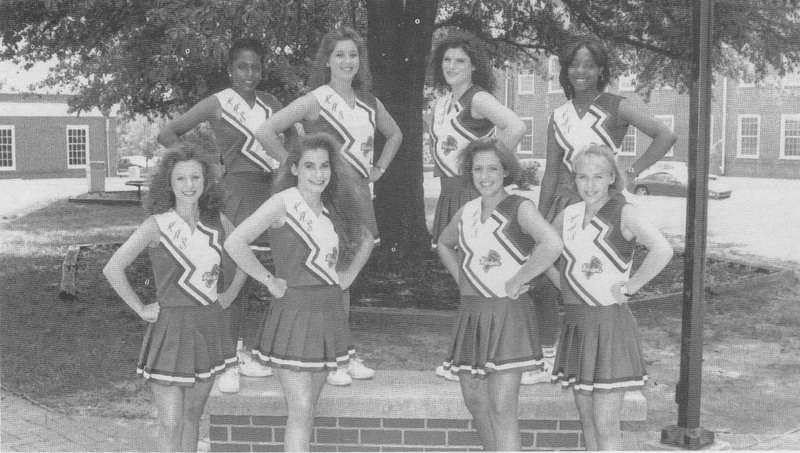 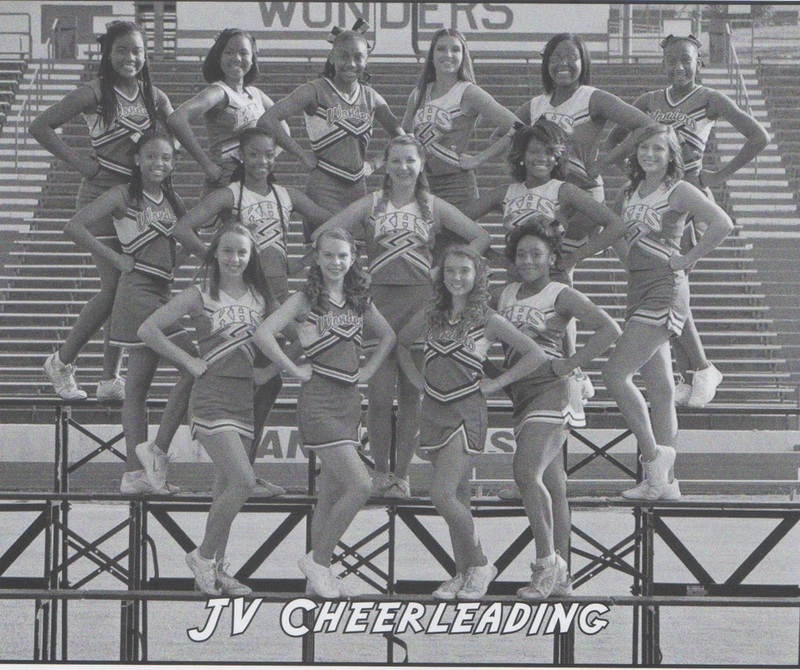 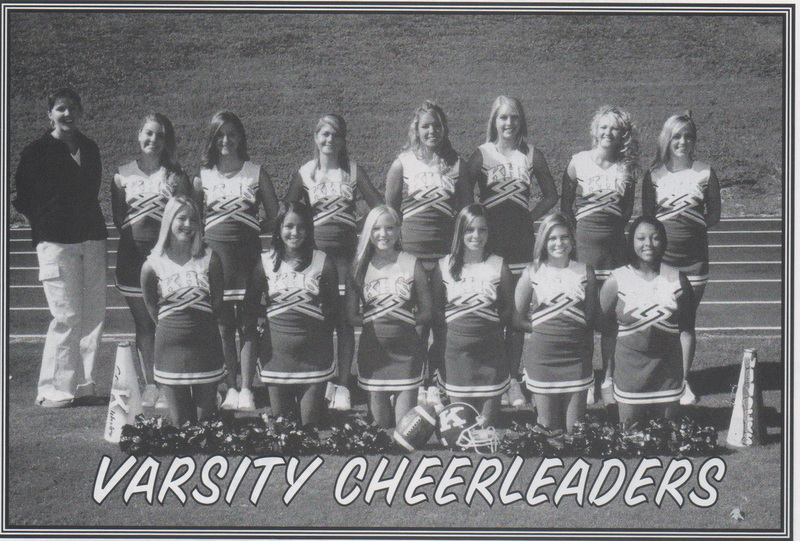 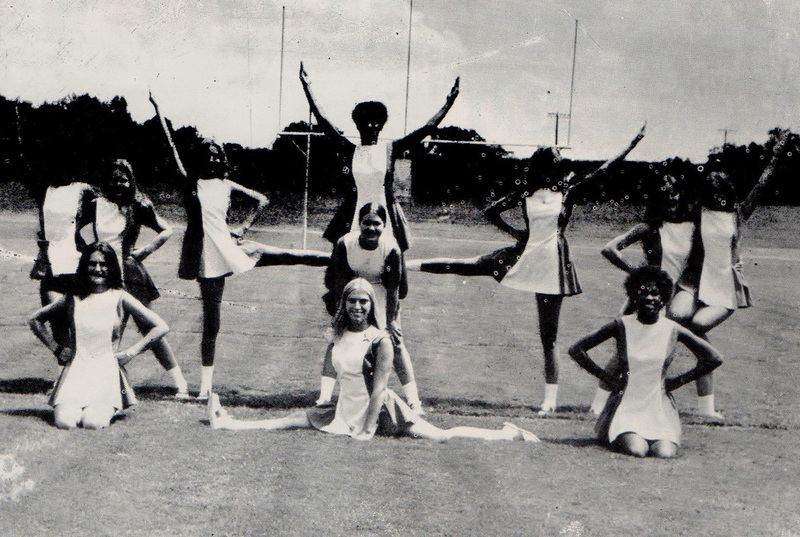 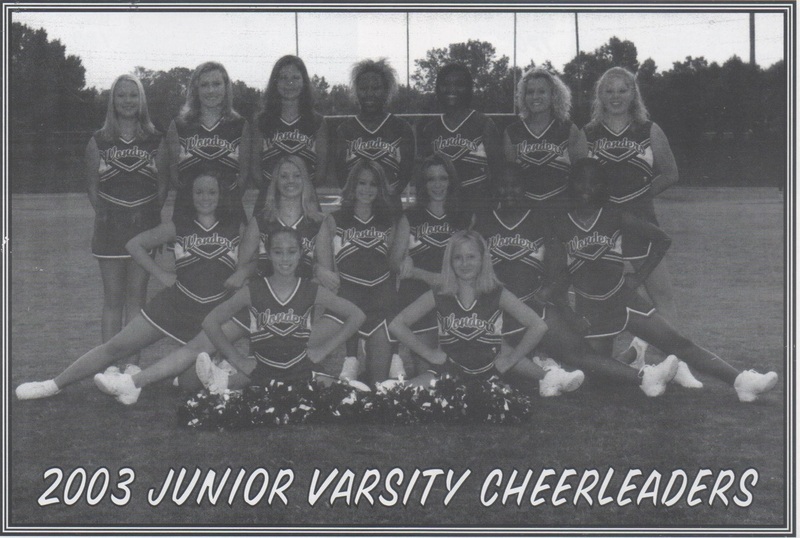 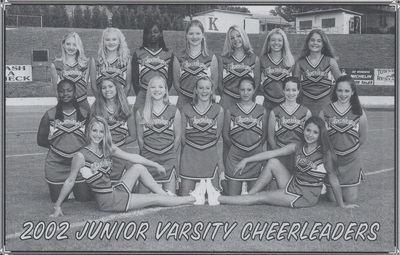 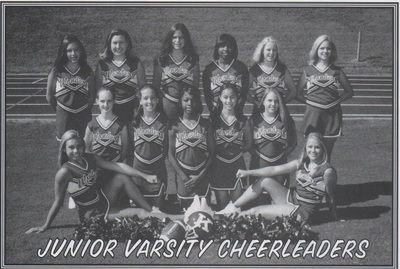 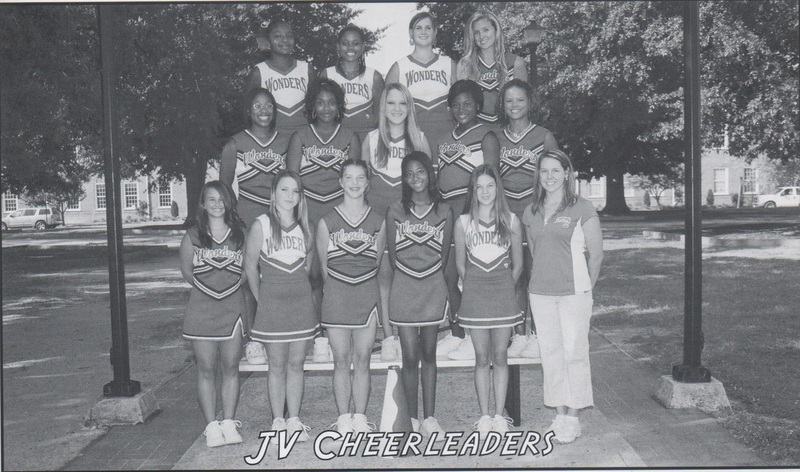 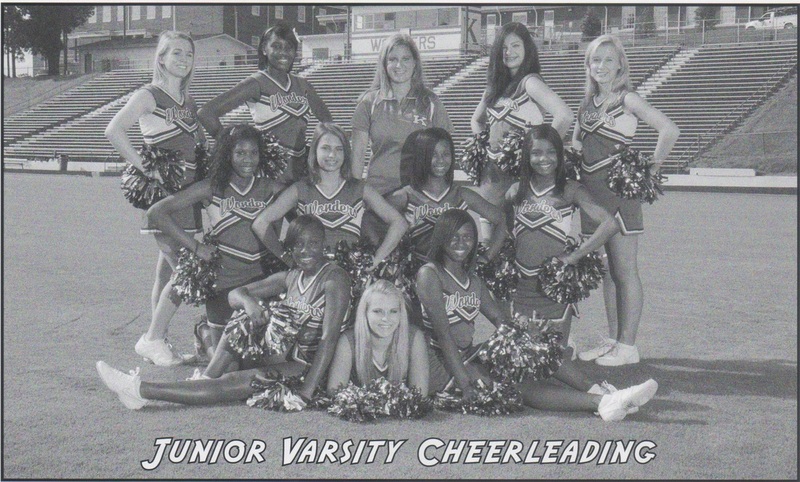 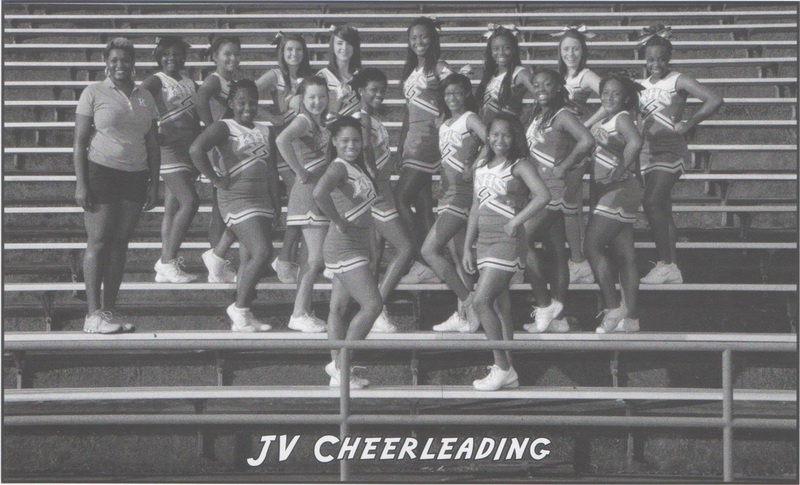 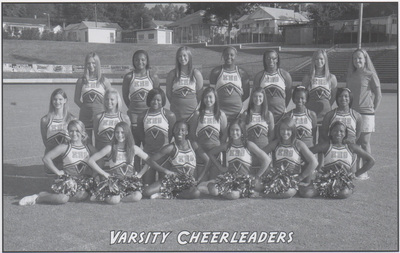 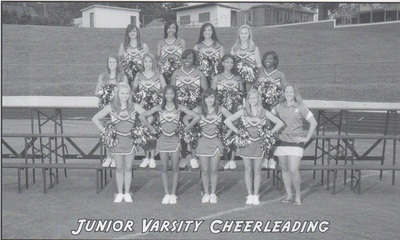 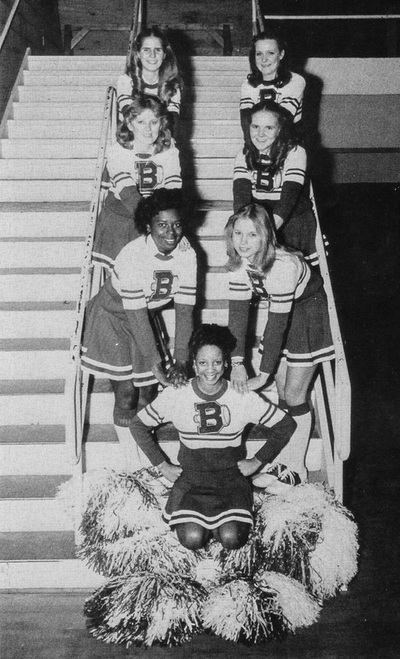 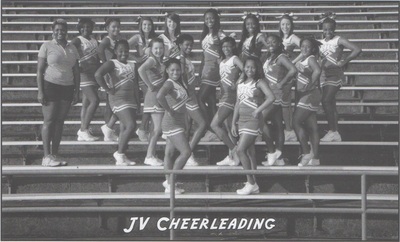 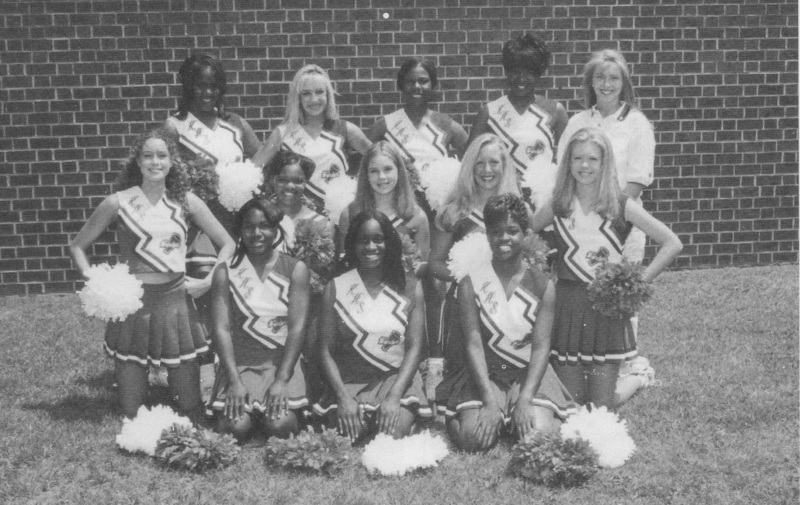 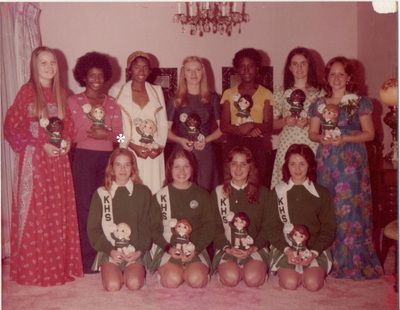 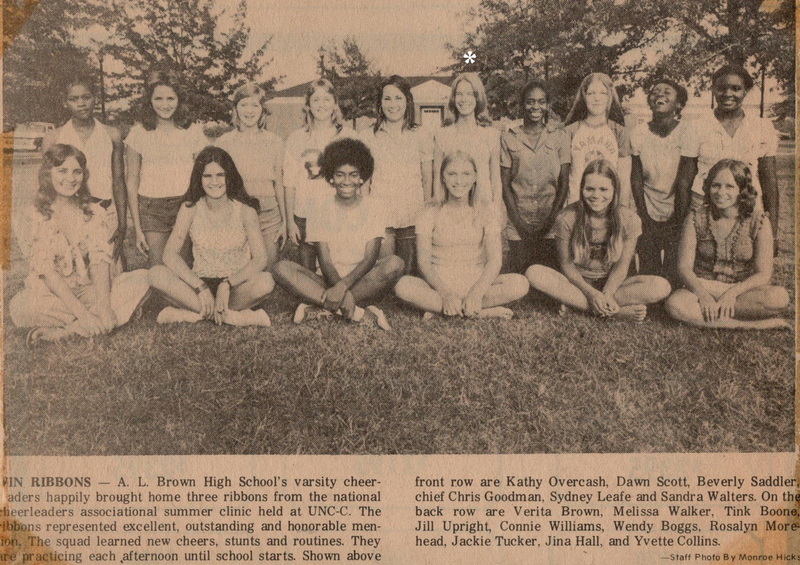 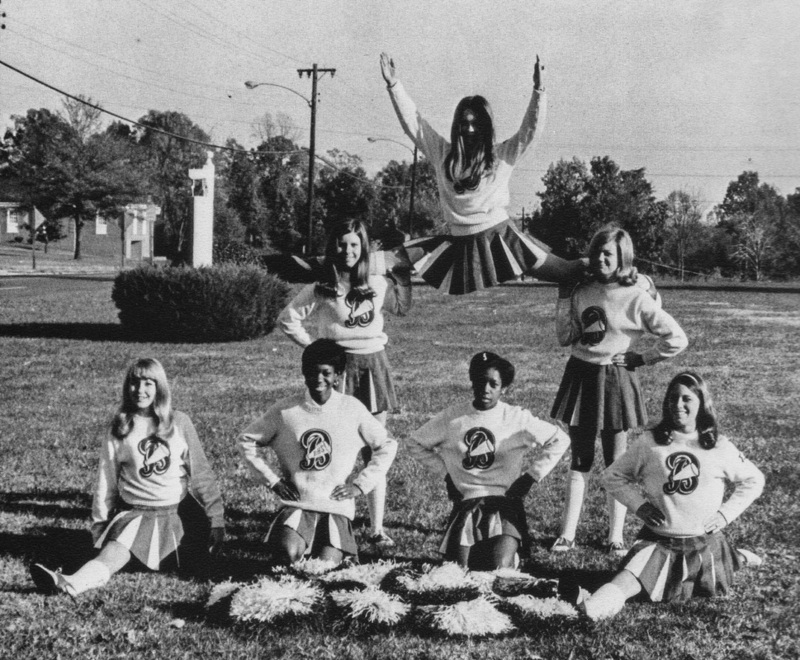 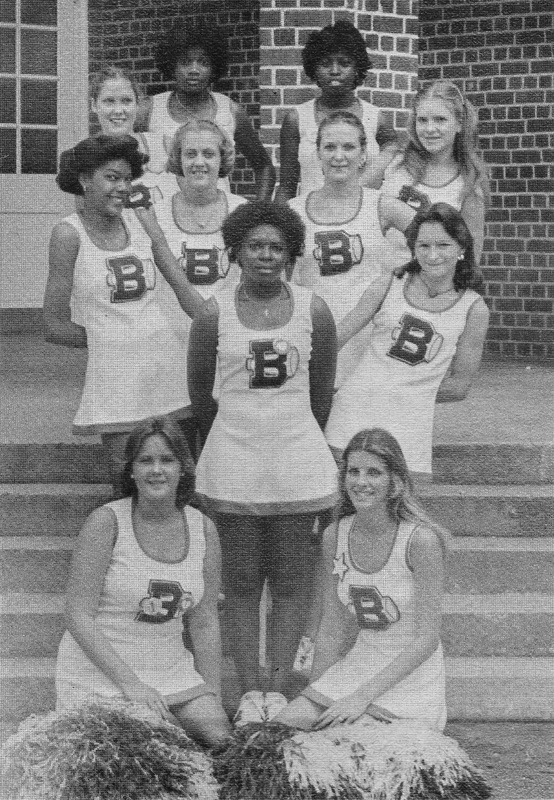 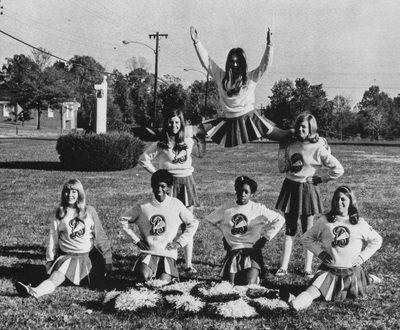 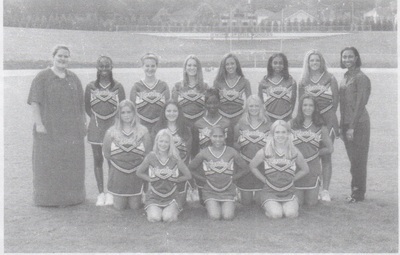 The first Wonder junior varsity cheerleaders appeared during the 1968 season and consisted of seven young ladies. Wonder Cheerleaders have been an integral part of Friday Nights in K-Town for over 84 years, and what would the games be without them? 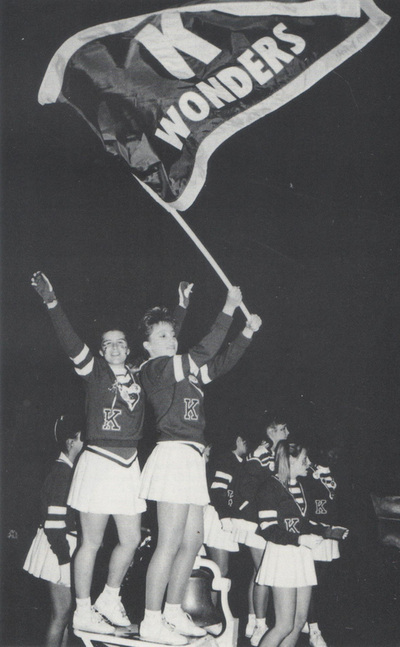 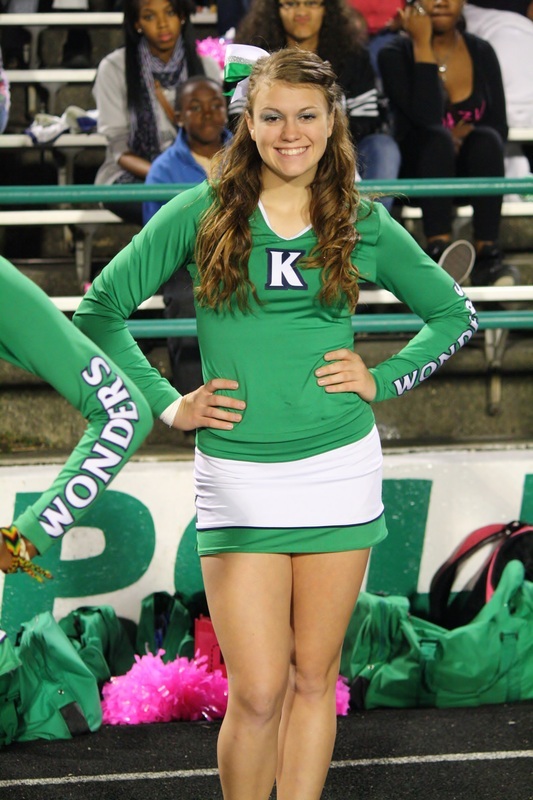 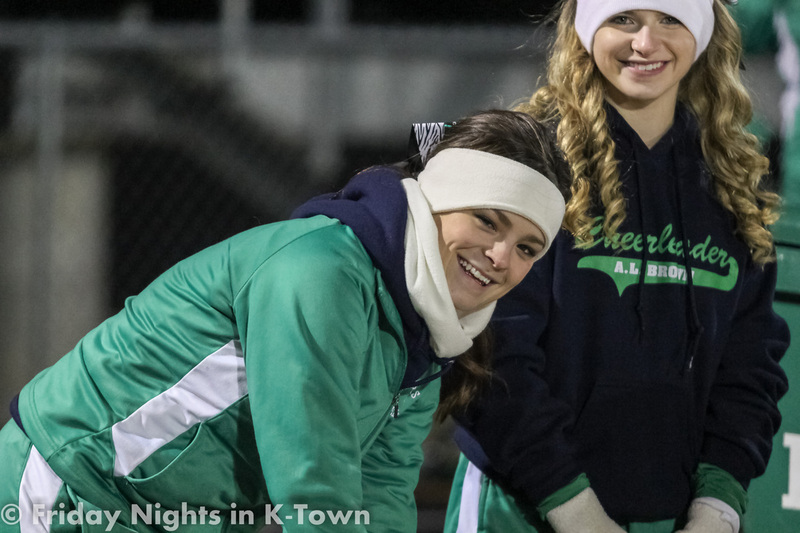 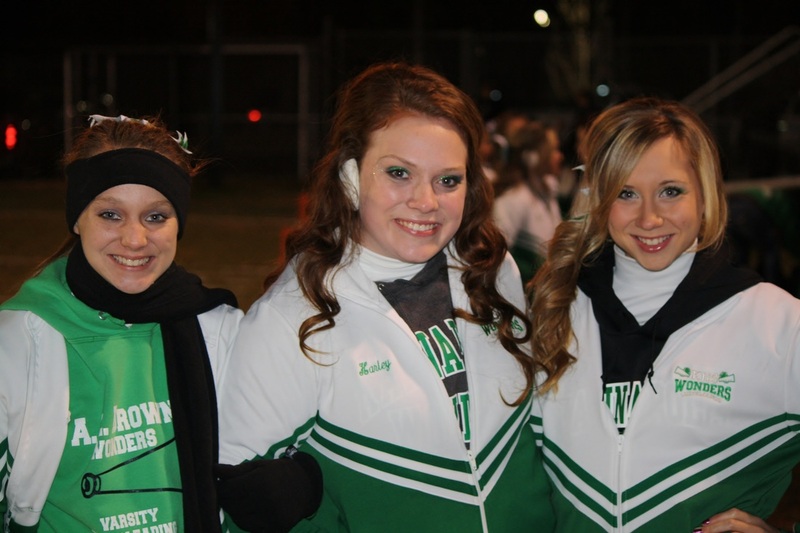 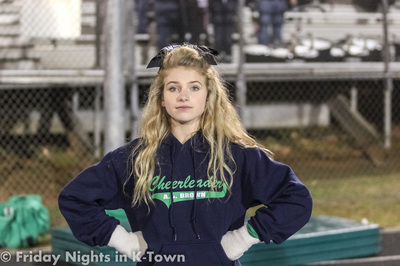 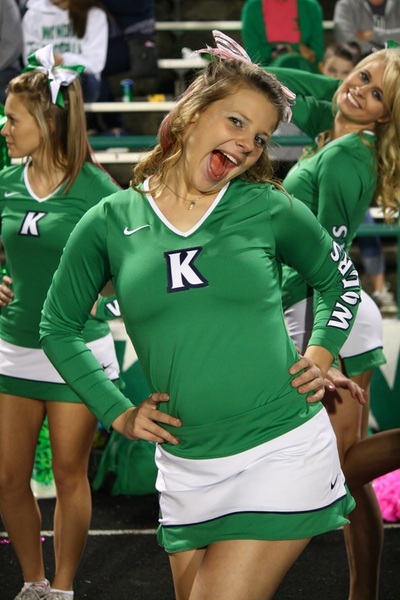 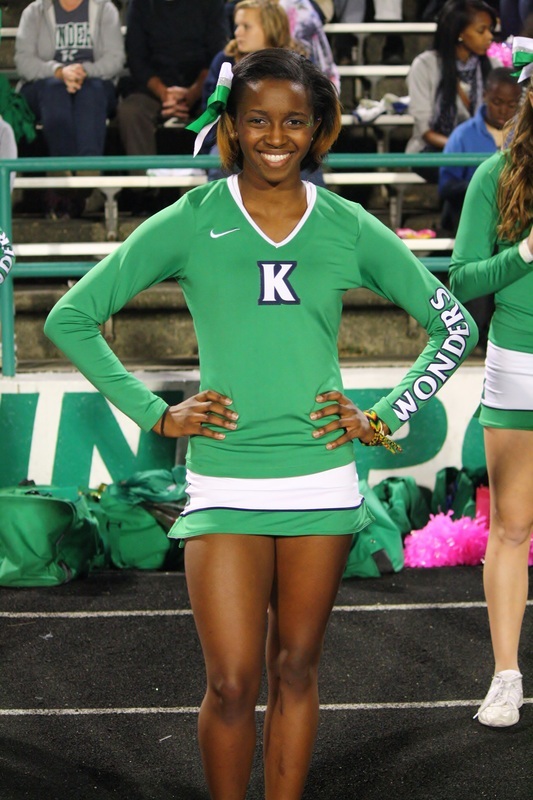 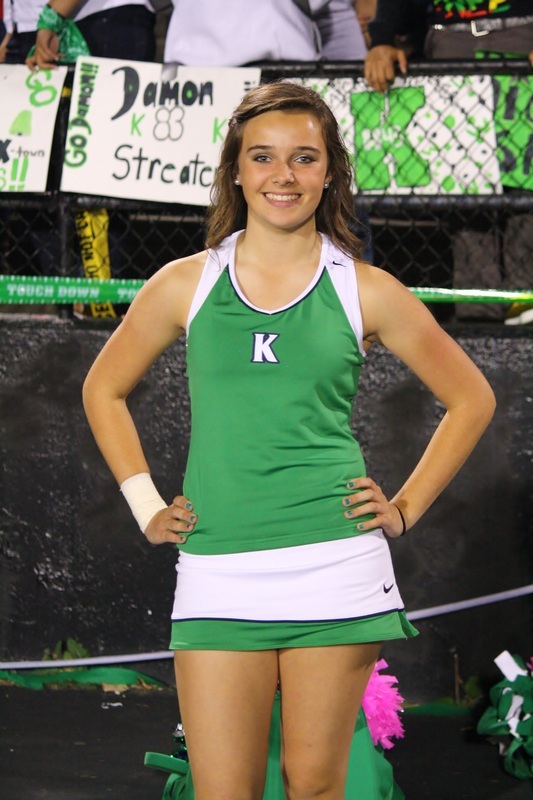 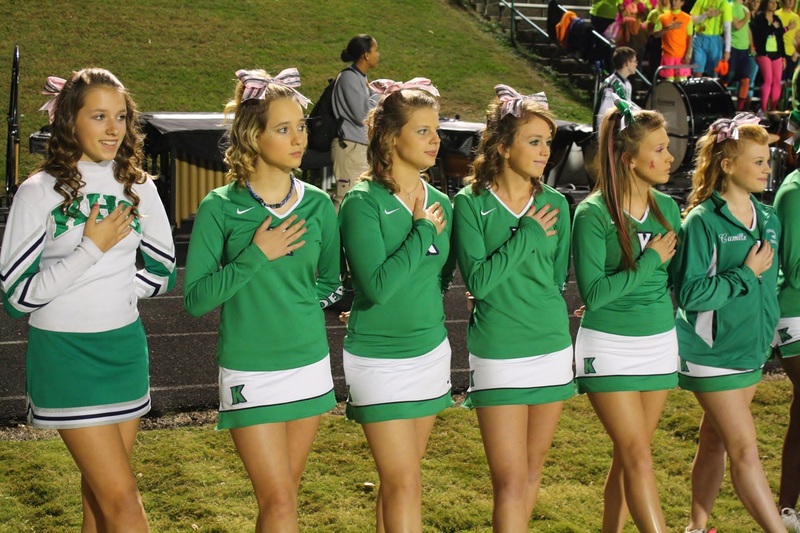 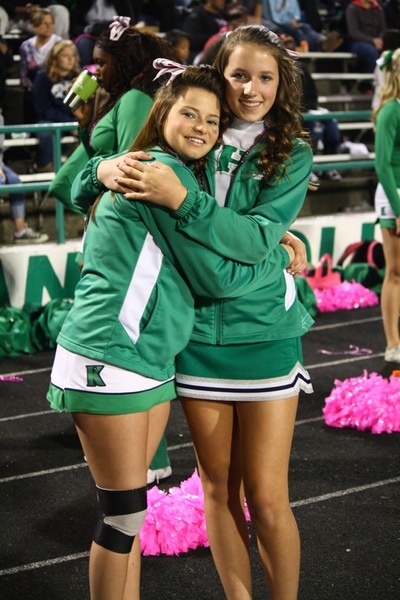 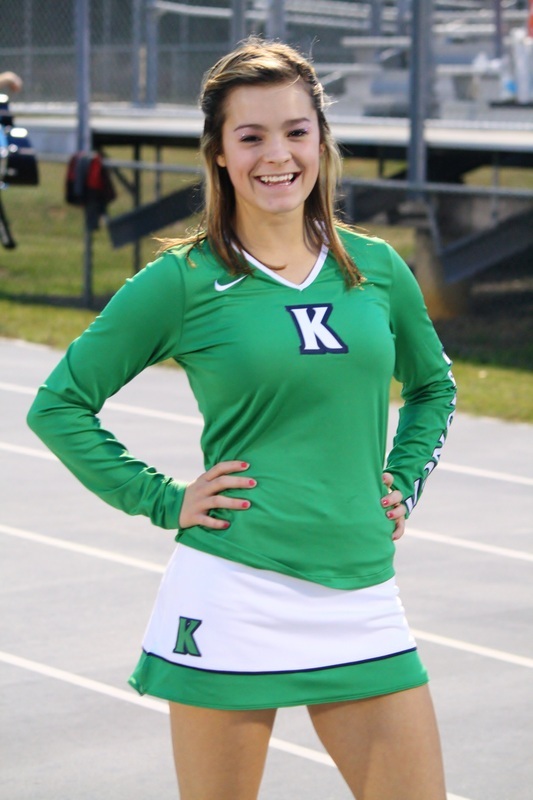 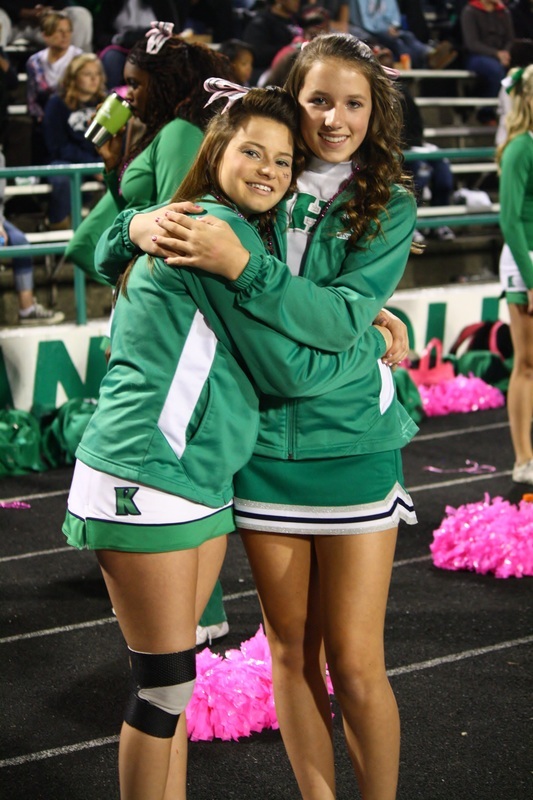 Since 1930, the Varsity and Junior Varsity Wonder Cheerleaders have dedicated themselves every bit as much as the football team and band to bring the most to the Friday Nights in K-Town experience. 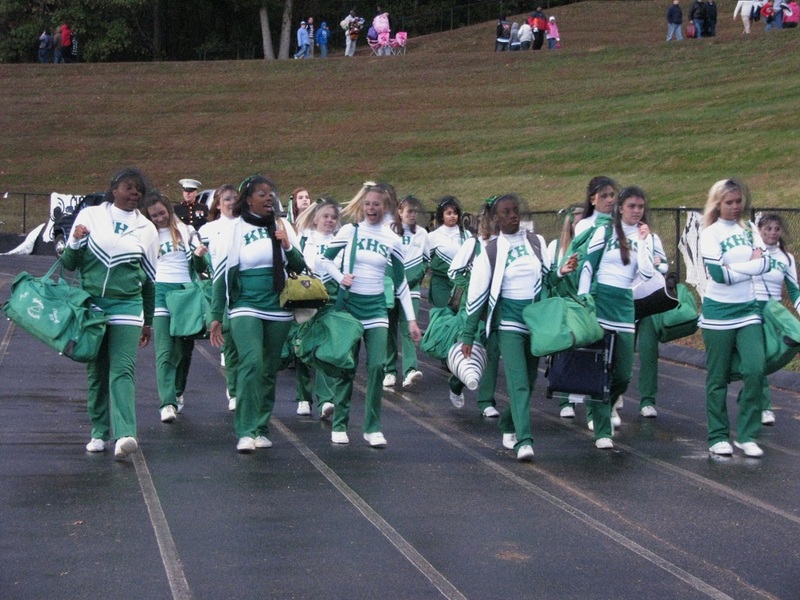 It begins with tryouts in late May and after those lucky ladies are selected they will go through weeks of exhausting preparatory training and camps designed to improve their overall skill and prowess. 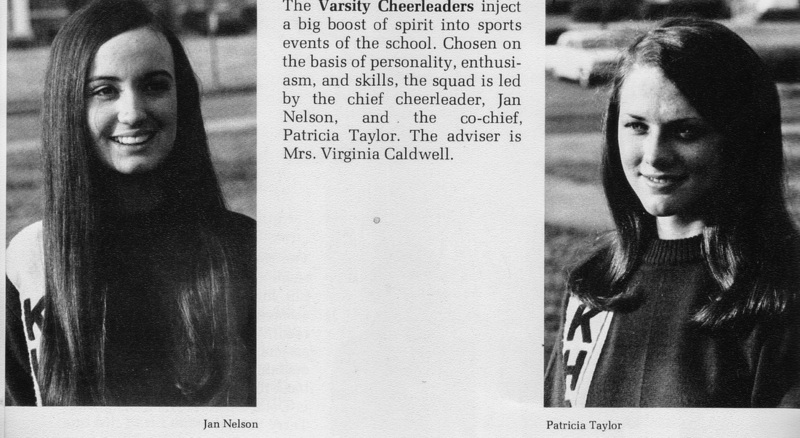 Though the selection process has changed numerous times throughout the decades, the formula is the same. 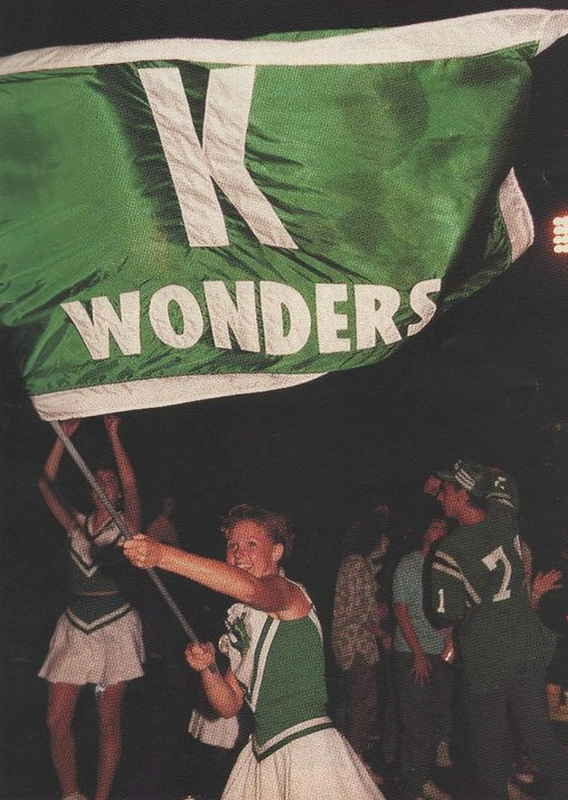 The girls and guys displaying the most spirit, talent and overall appeal are selected to represent the Wonders either on the varsity or junior varsity levels. 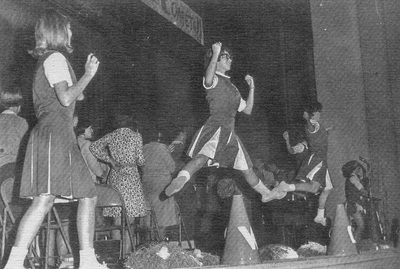 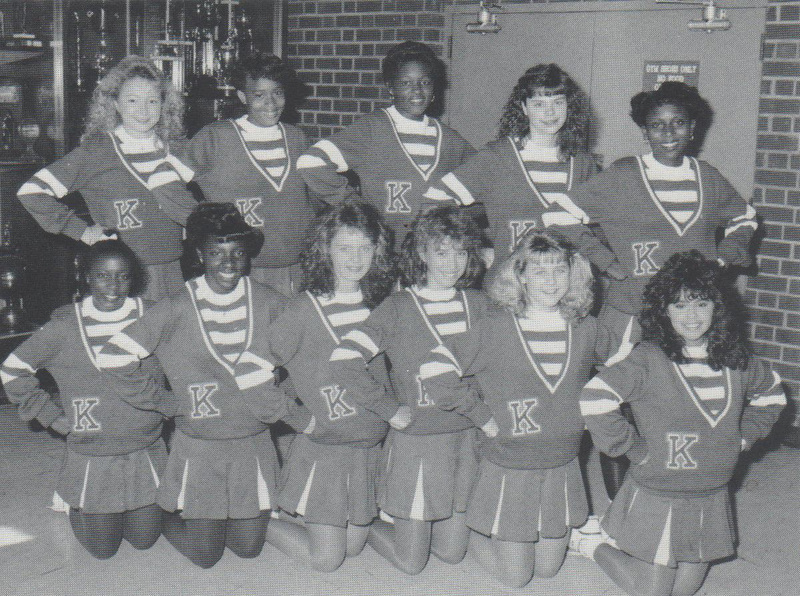 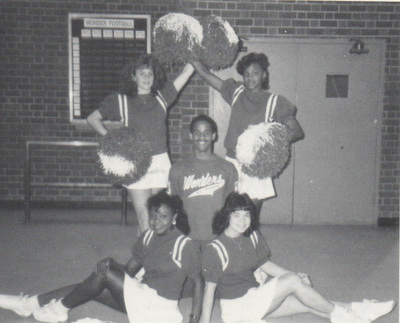 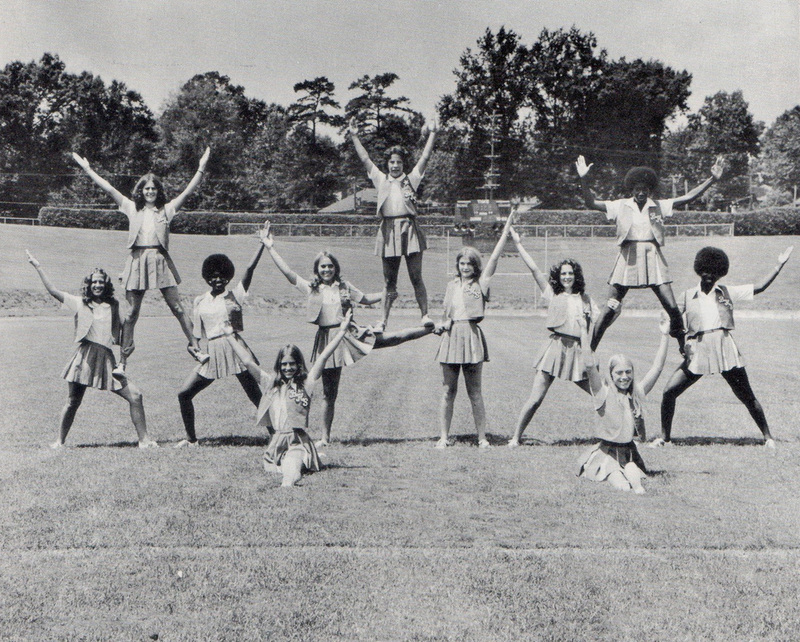 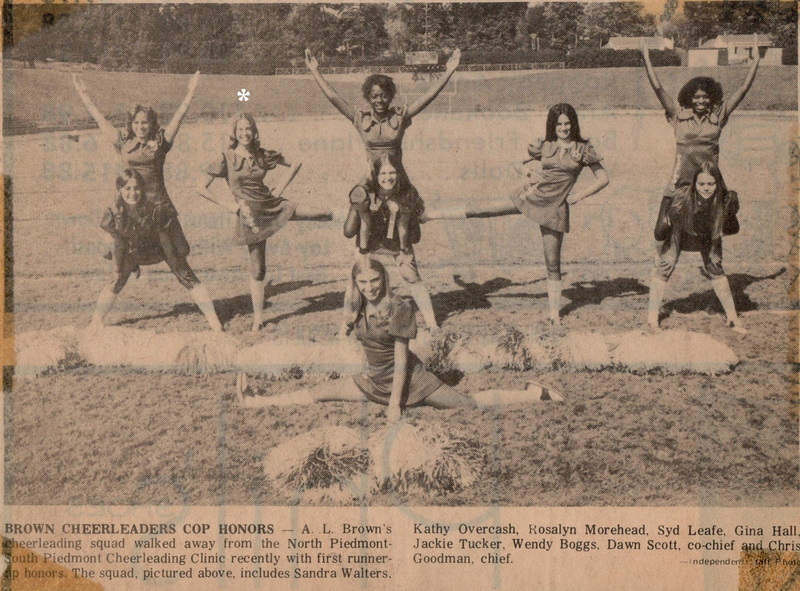 The roots of the first Wonder Cheerleaders can be traced back to the early years at J.W. Cannon High School in the pre war years from 1930 to 1938. 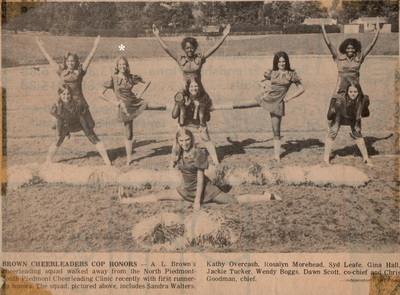 My research has been unable to locate any photos or articles documenting these particular groups however, there is occasional mention of cheerleaders during this time just no materials to back it up. 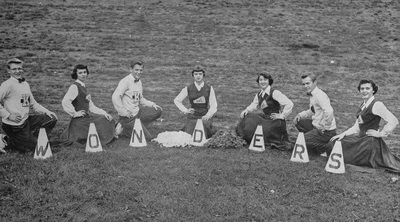 The very first pictured group of Wonder Cheerleaders came in 1946. 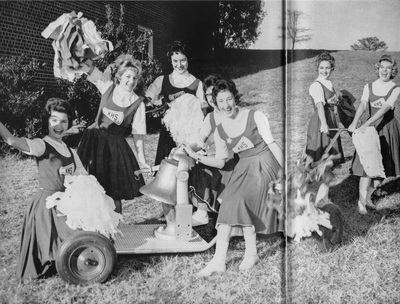 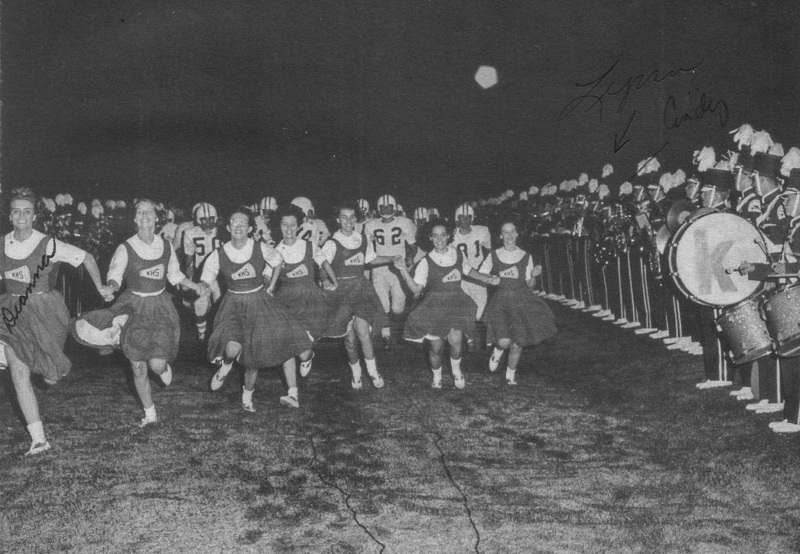 The 1946 Cheerleaders of J.W. 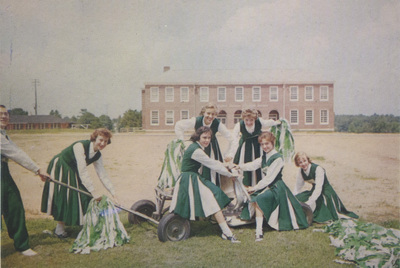 Cannon consisted of four girls and three men. 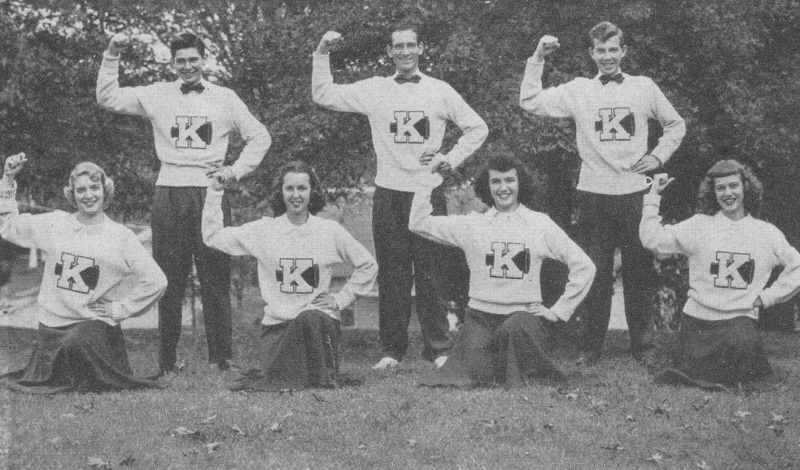 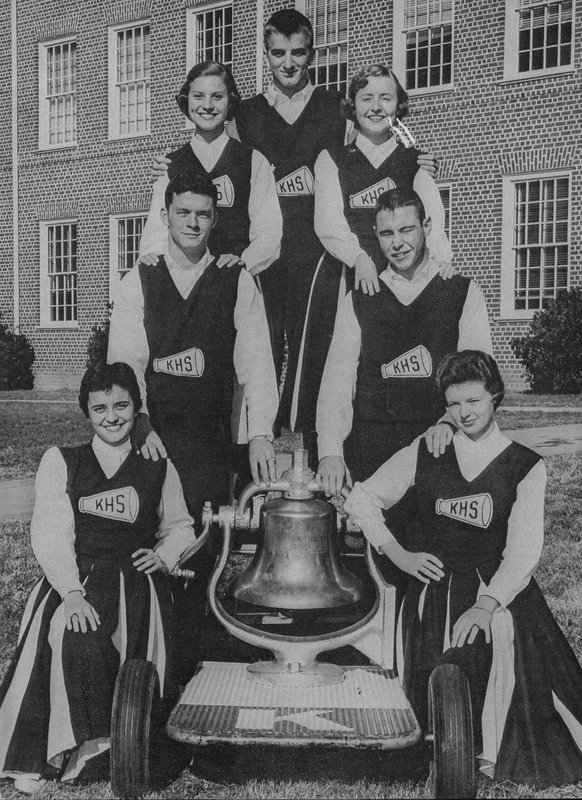 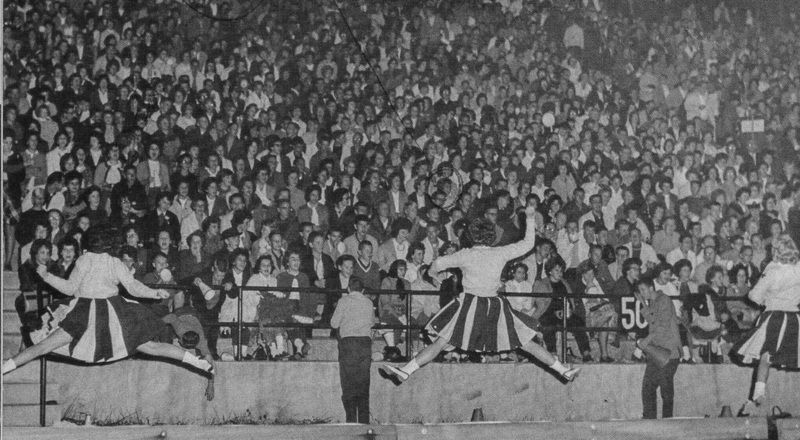 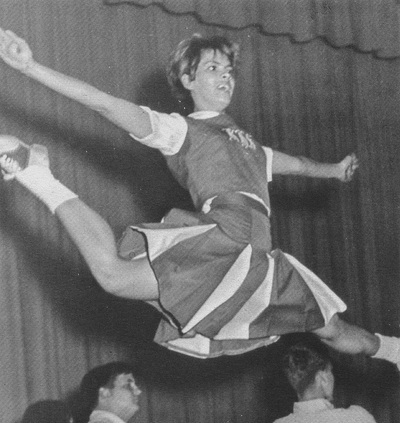 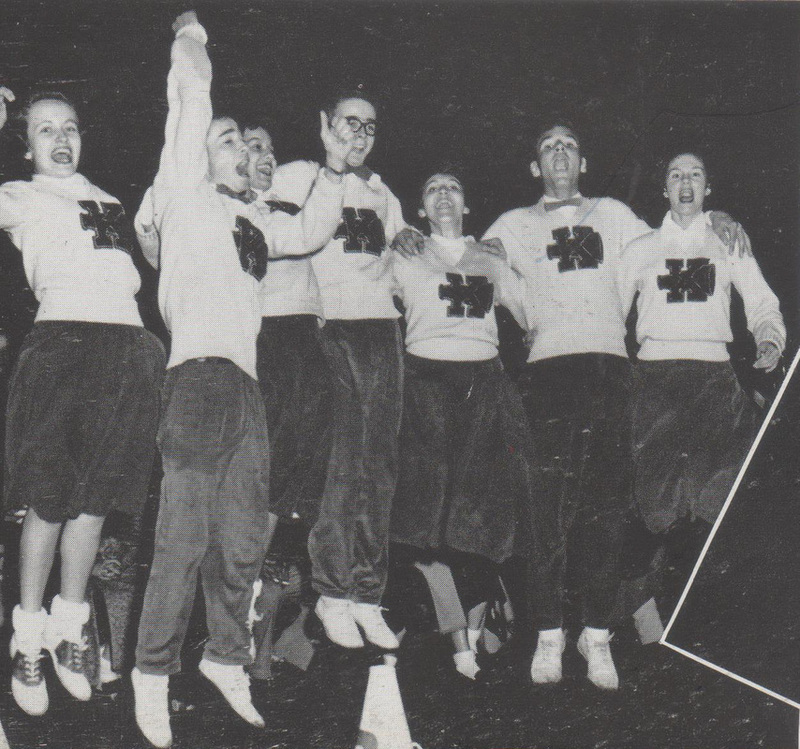 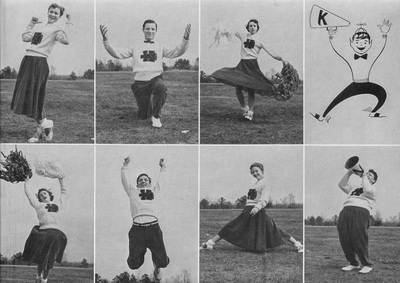 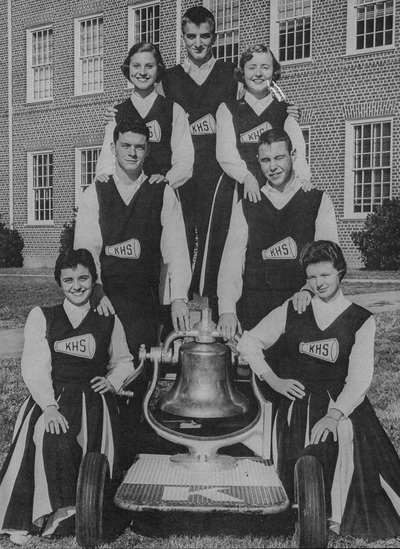 From 1946-1959, Coed cheerleading was common place at both J.W. 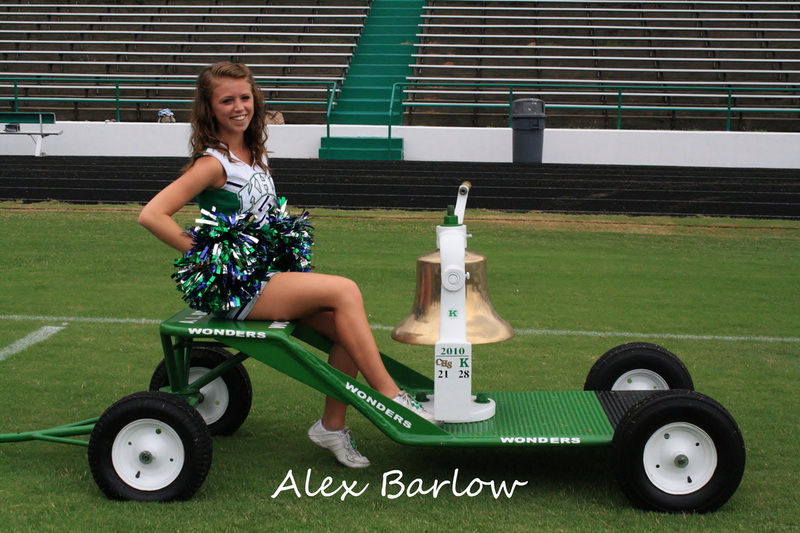 Cannon and A.L. 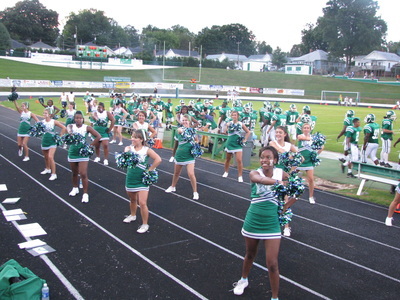 Brown High Schools. 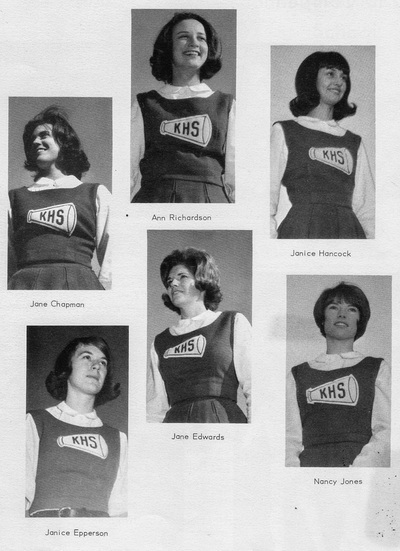 During this period, both guys and girls participated in this somewhat underappreciated endeavor. 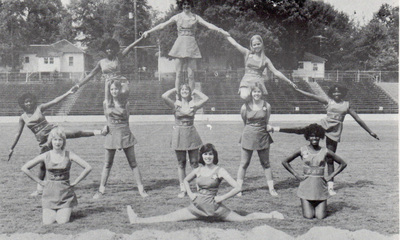 Then after 1959, most male participation ended as females made up the core of the Wonder Cheerleading squads for both varsity and junior varsity. 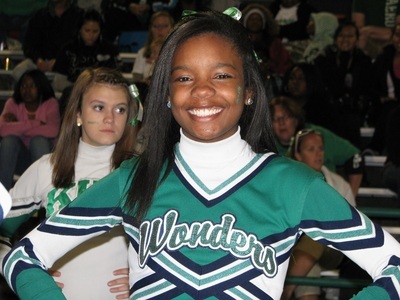 Girls selected to be Wonder cheerleaders have strict rules and guidelines they must adhere to throughout the year to remain on the squad, Coaches and advisors check on a regular basis to make sure they are living up to the standards they have set. This includes maintaining an acceptable grade point average, showing up for classes on time, always having homework and maybe even being involved in a few on-campus activities. 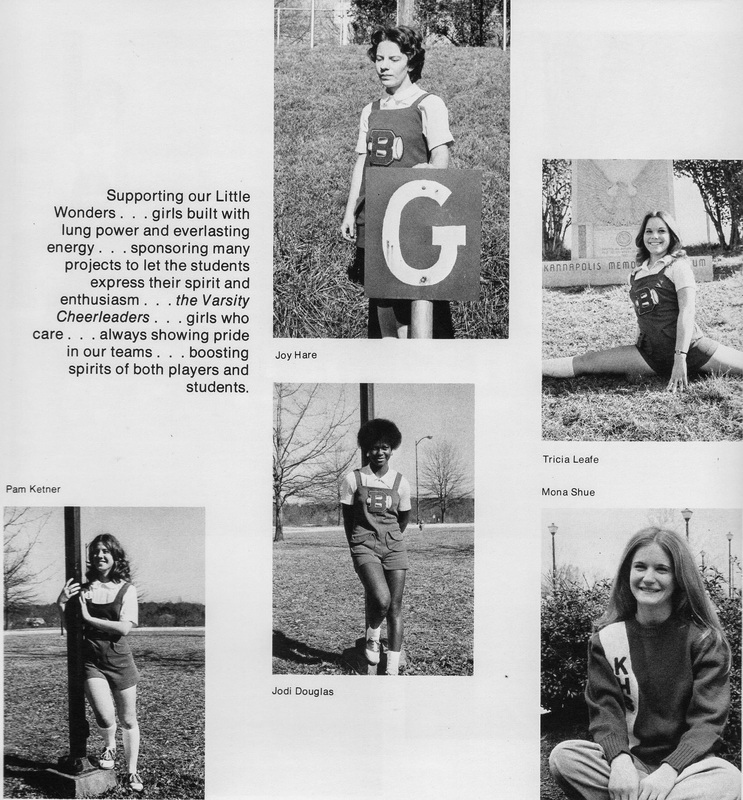 As a top representative of the school, they become role models to many. 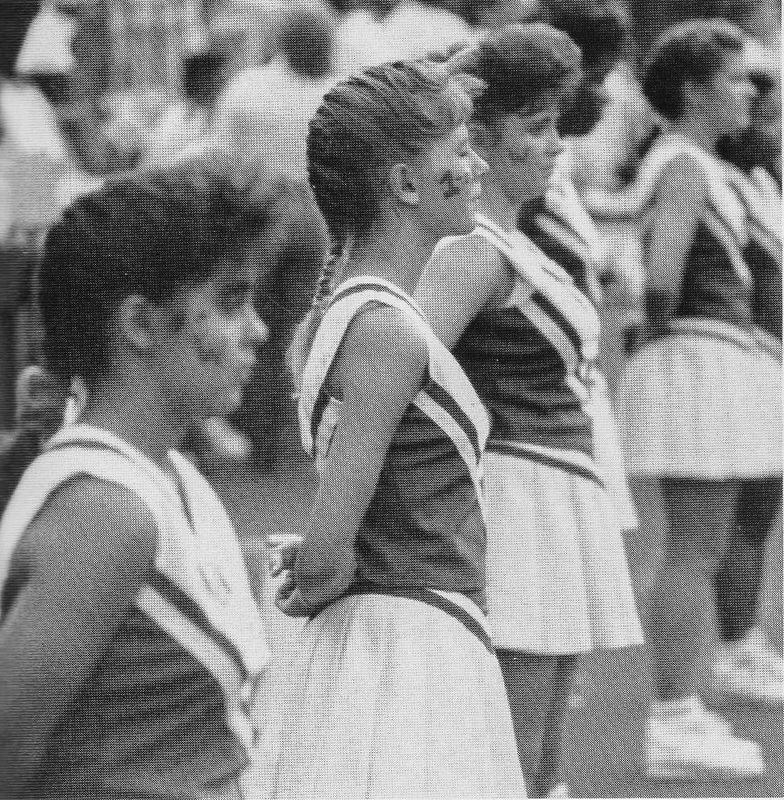 Little girls dressed in cheerleading uniforms, dreaming of one day being in the same position, mock them from the stands and look to them with a sense of awe and wonder. 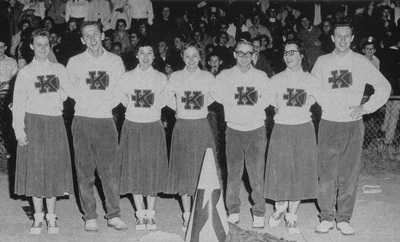 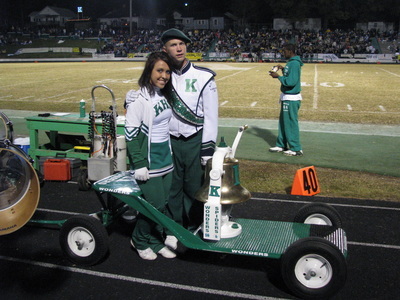 People in the community recognize them from their many appearances in town and at the games and parades. 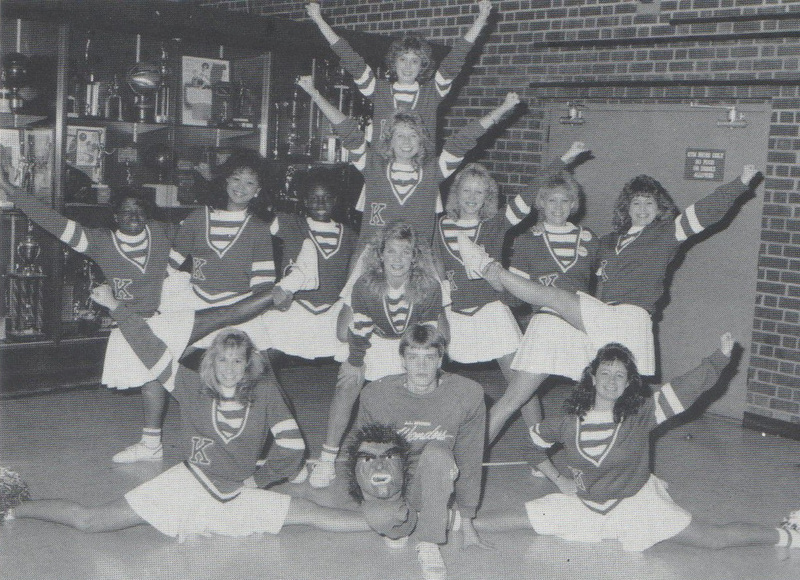 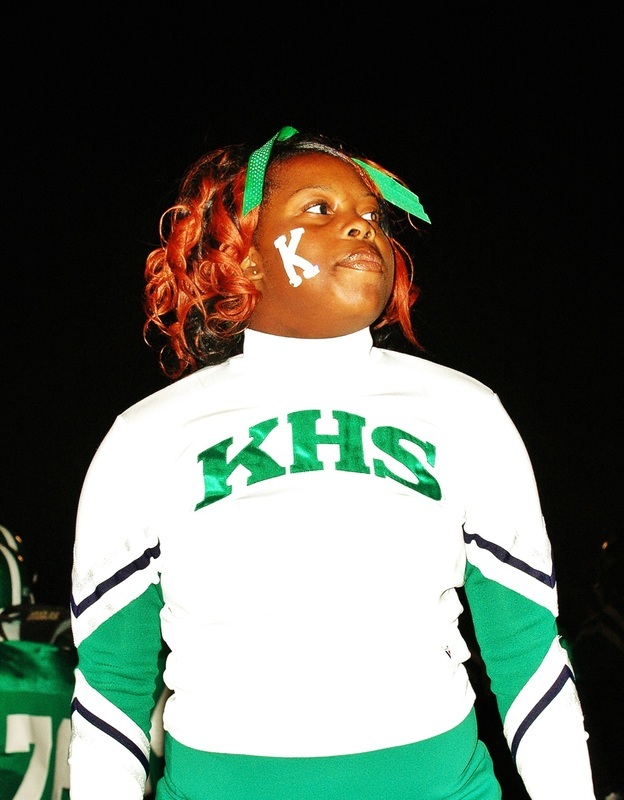 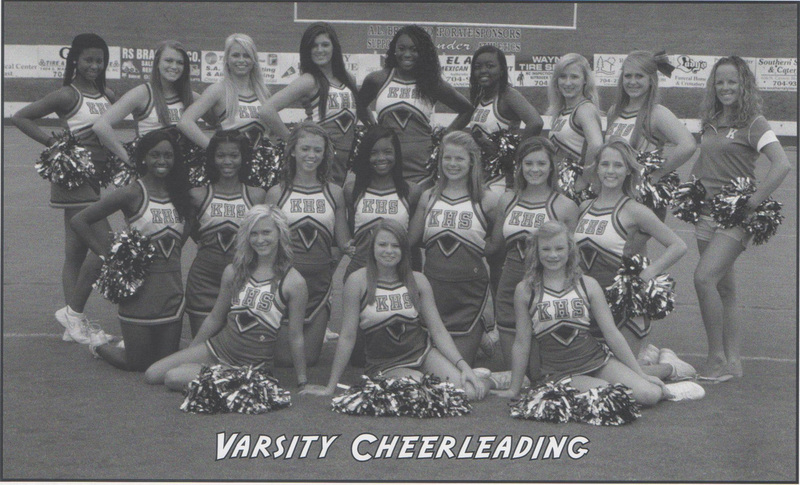 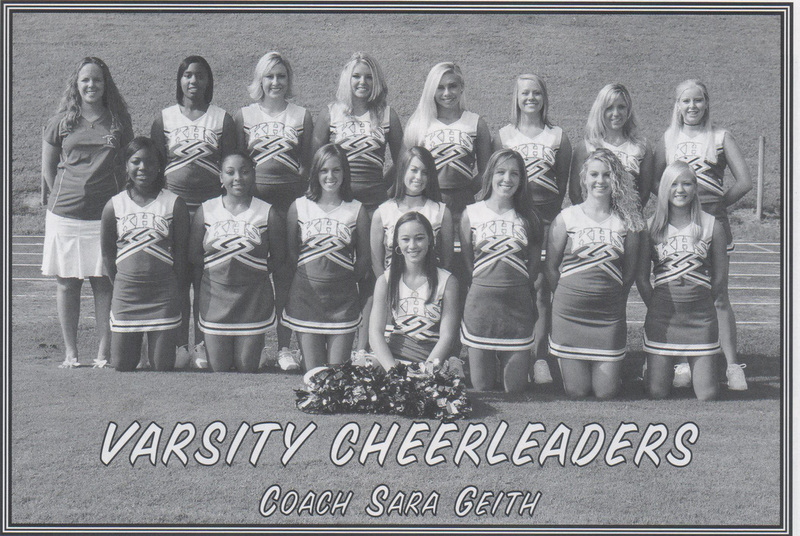 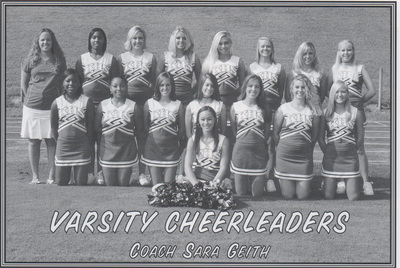 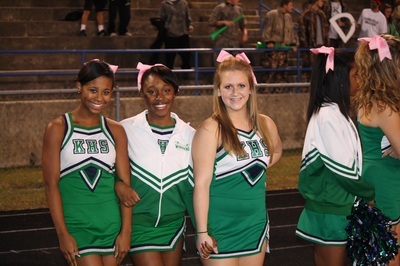 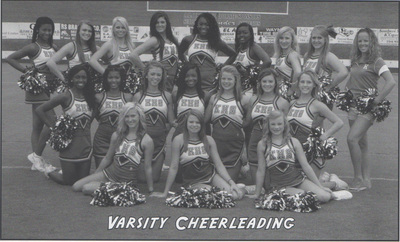 Teachers, staff, coaches, and students from the school always seem to know exactly who the cheerleaders are. 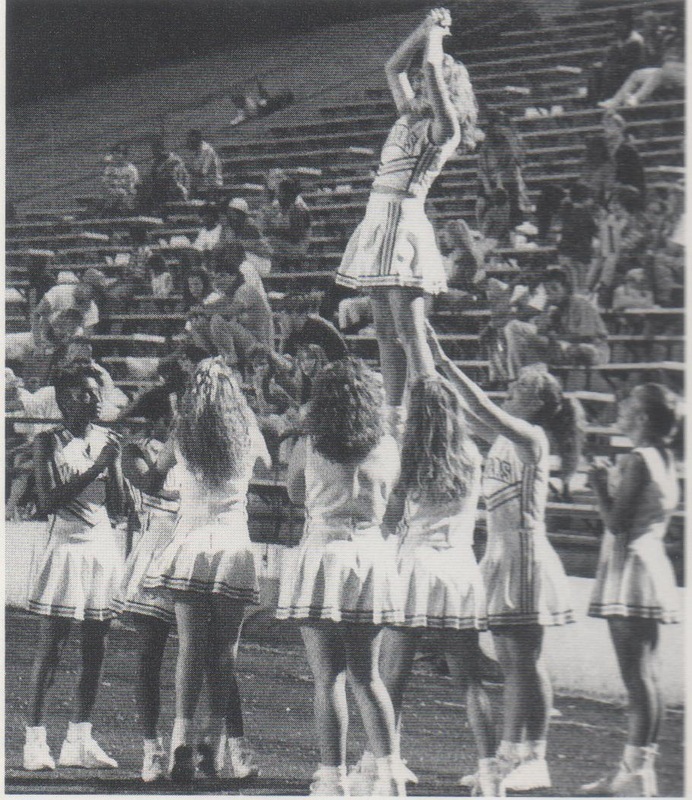 Having talked to many former Wonder cheerleaders they all seem to to echo this simple truth, Having been a cheerleader at A.L. 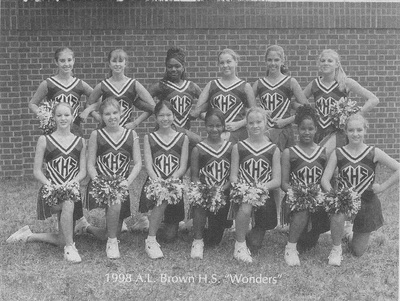 Brown High School was one of the most memorable experiences of their high school days and the bonds and memories they made have followed them well into their adult lives. 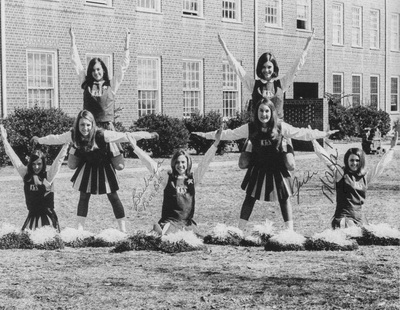 To say the tradition of Wonder cheerleading is a proud tradition may be underscoring it's significance totally. 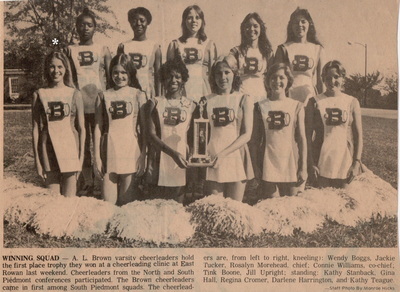 Since cheerleading was established at Princeton University in 1887, young ladies and men from every state in the union have given all they have in the tank to support their athletic teams at school related sporting events for over well over 100 years. 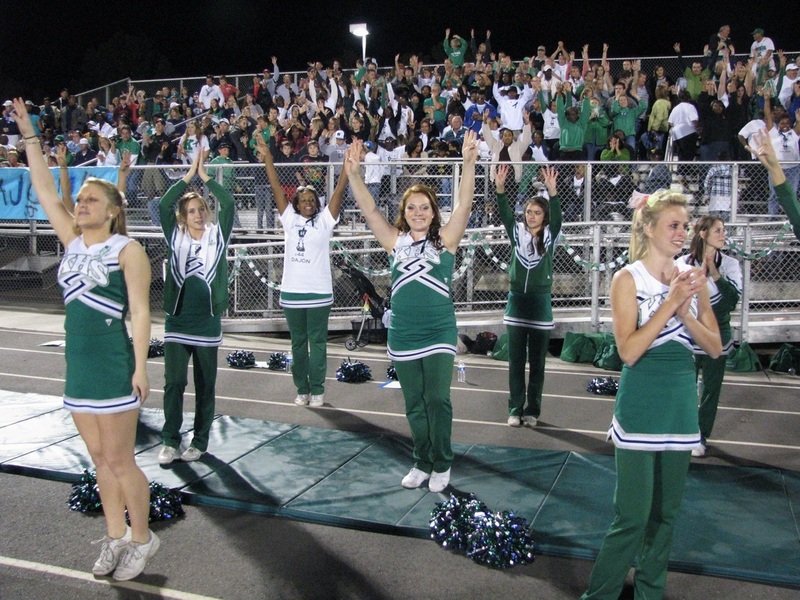 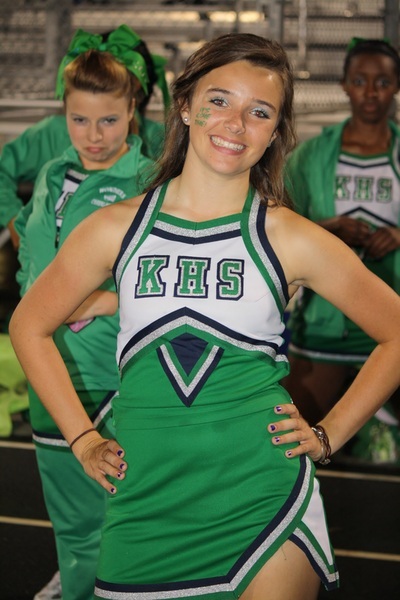 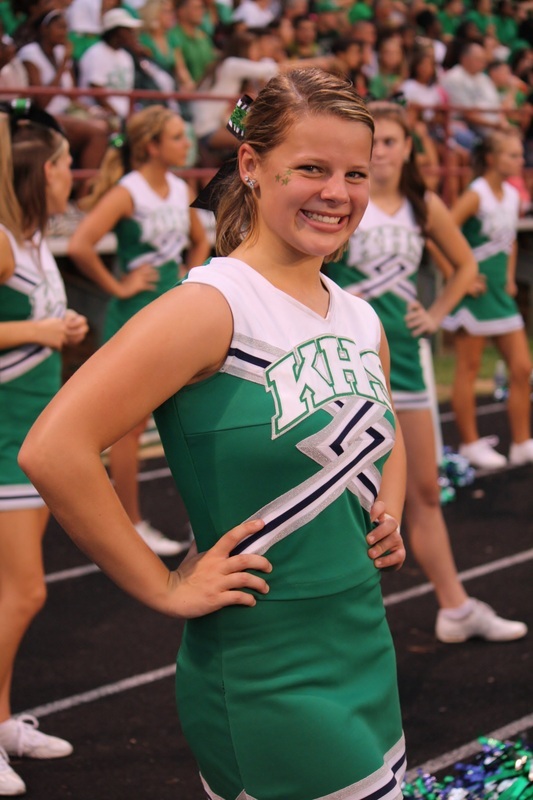 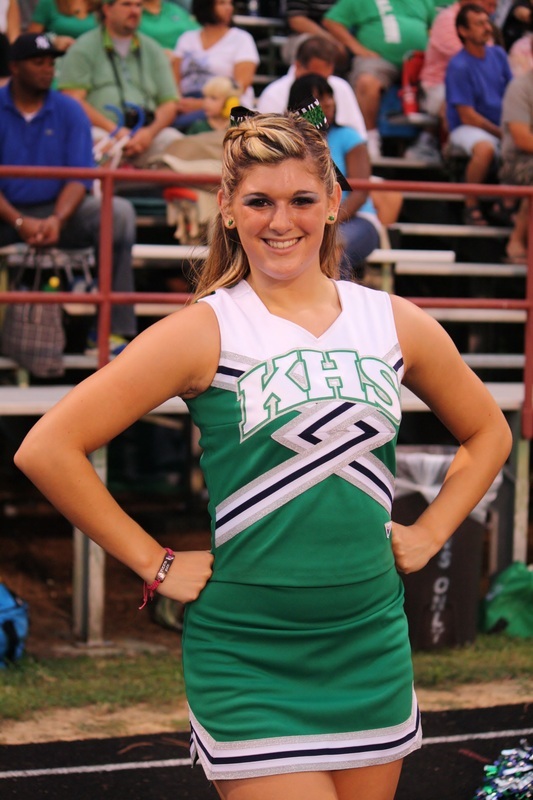 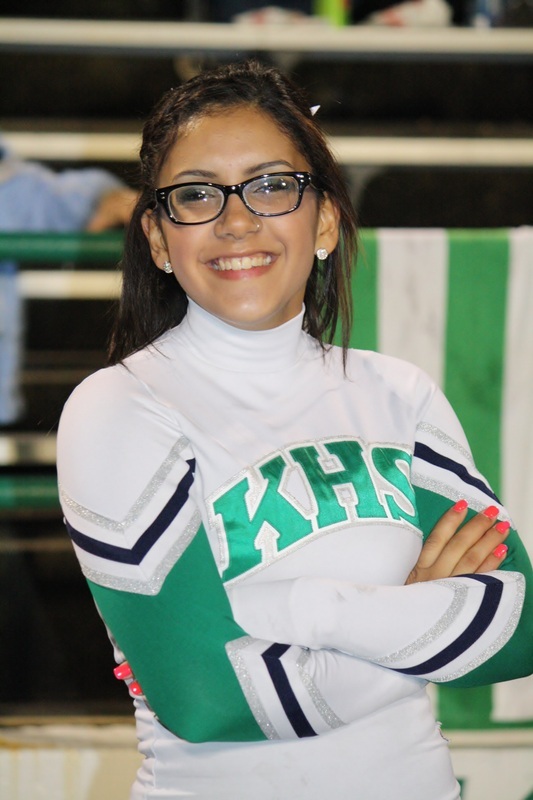 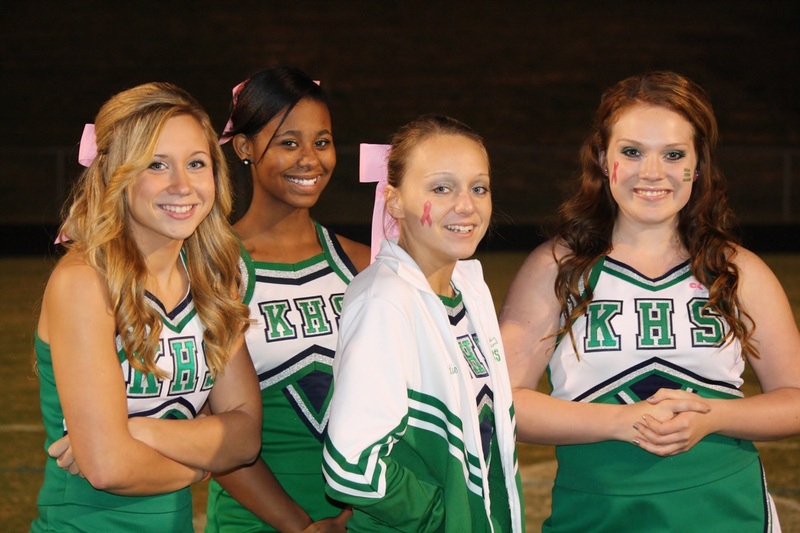 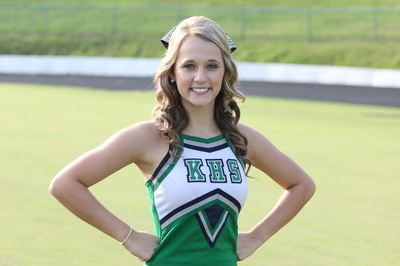 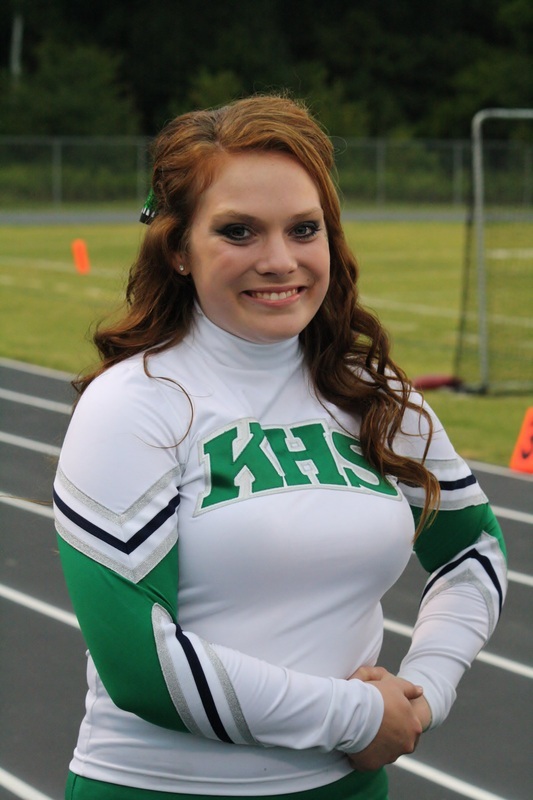 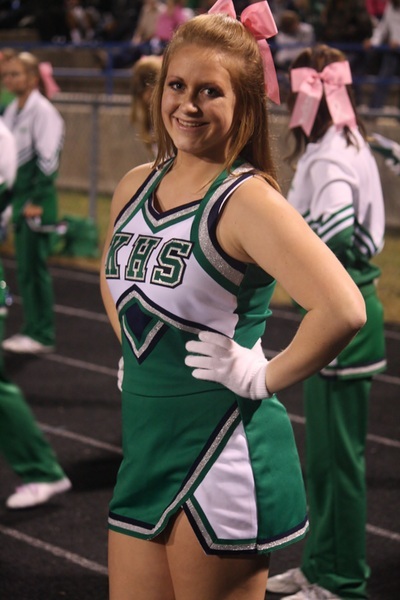 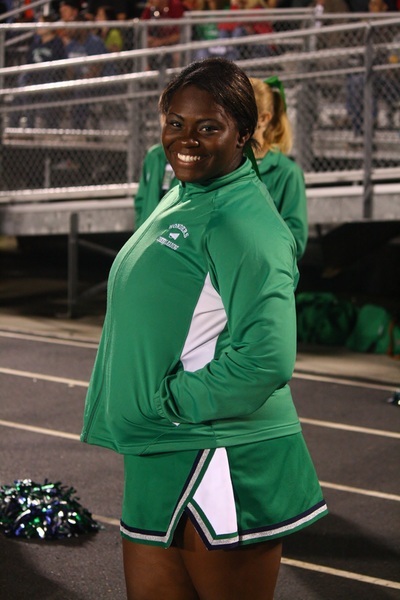 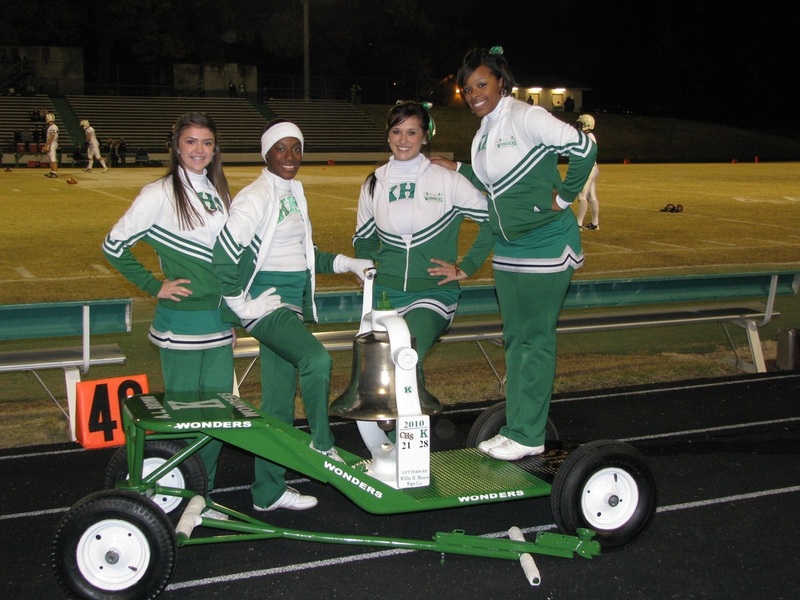 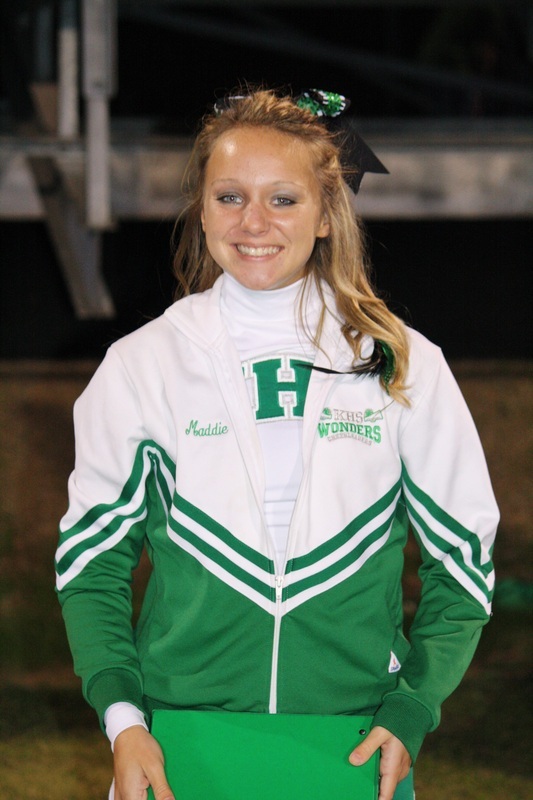 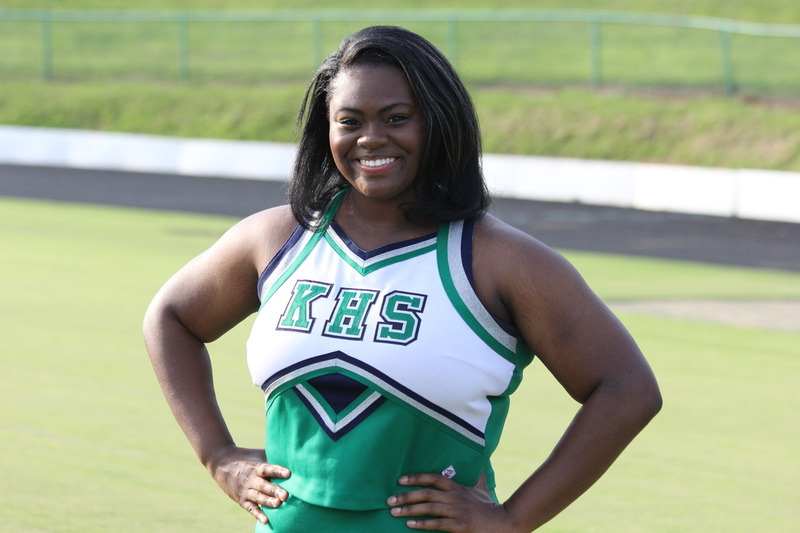 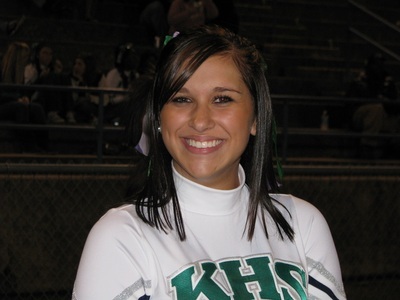 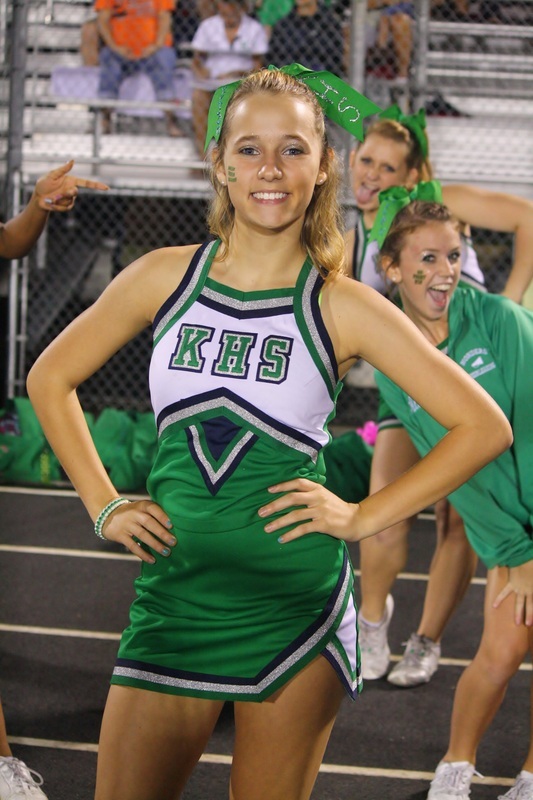 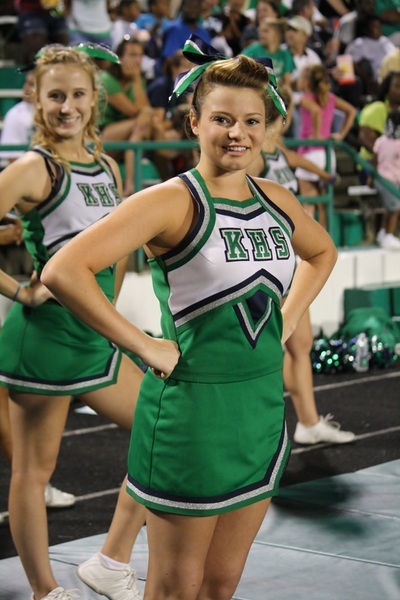 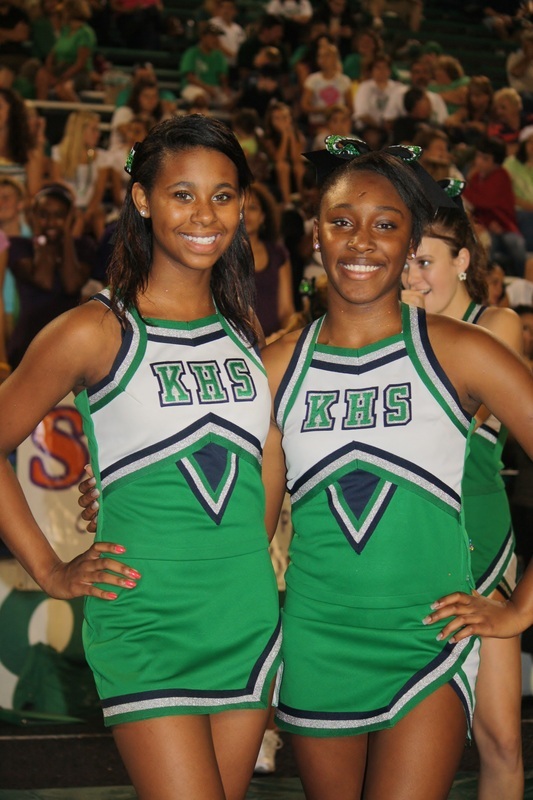 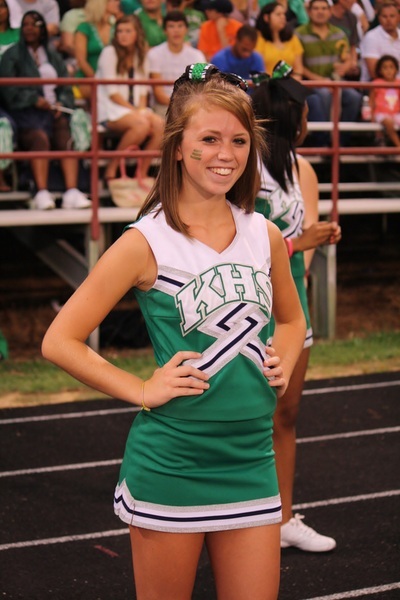 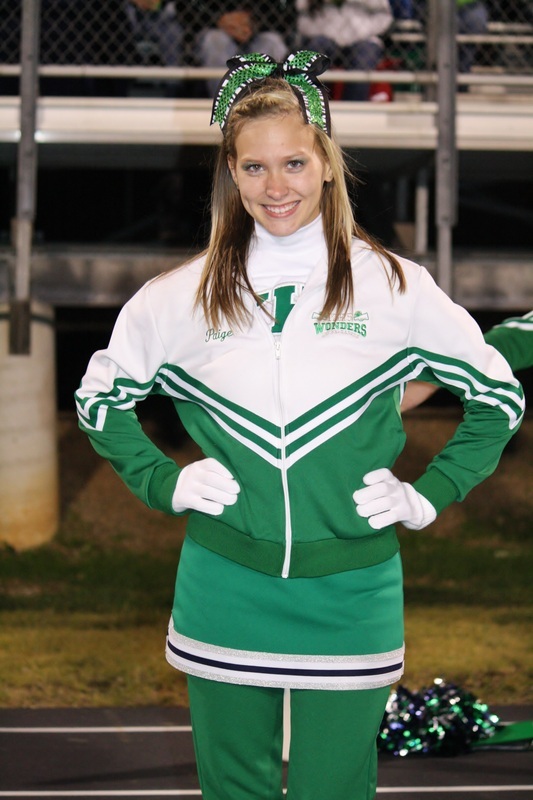 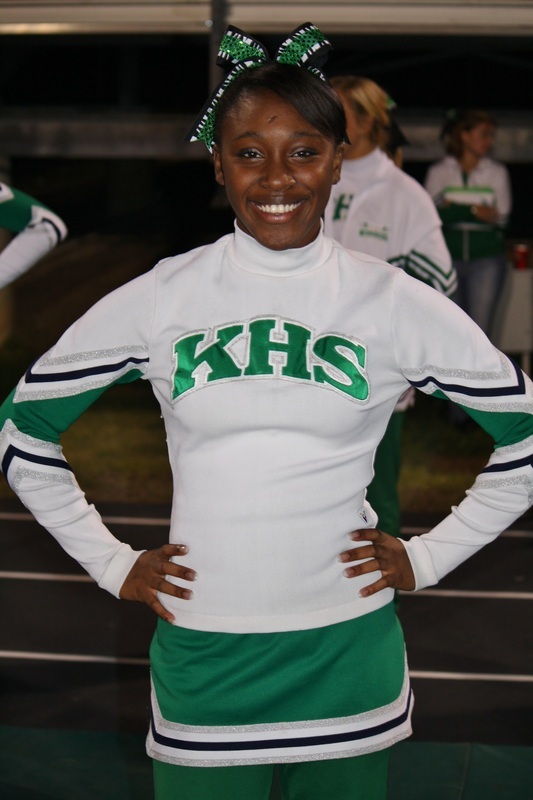 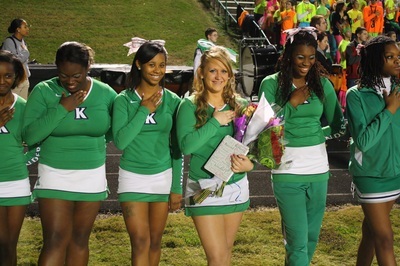 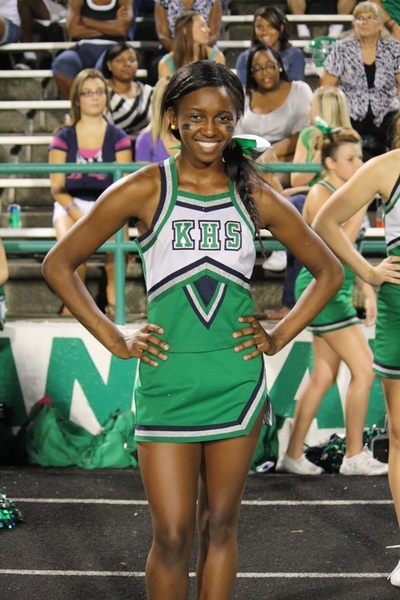 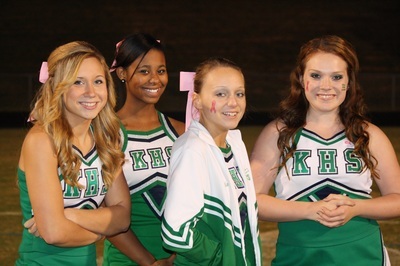 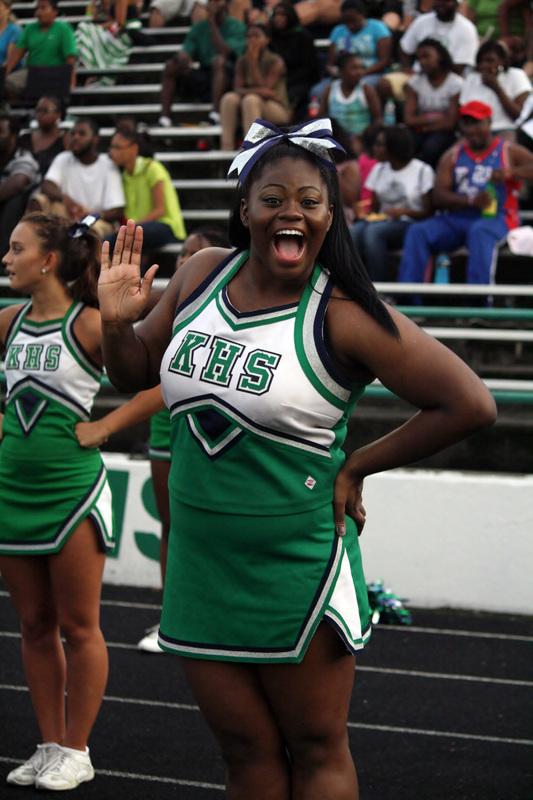 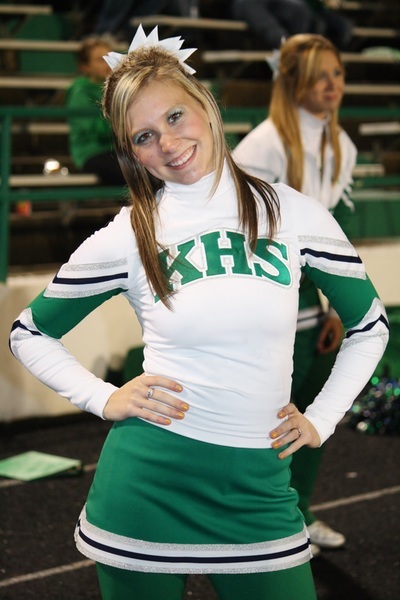 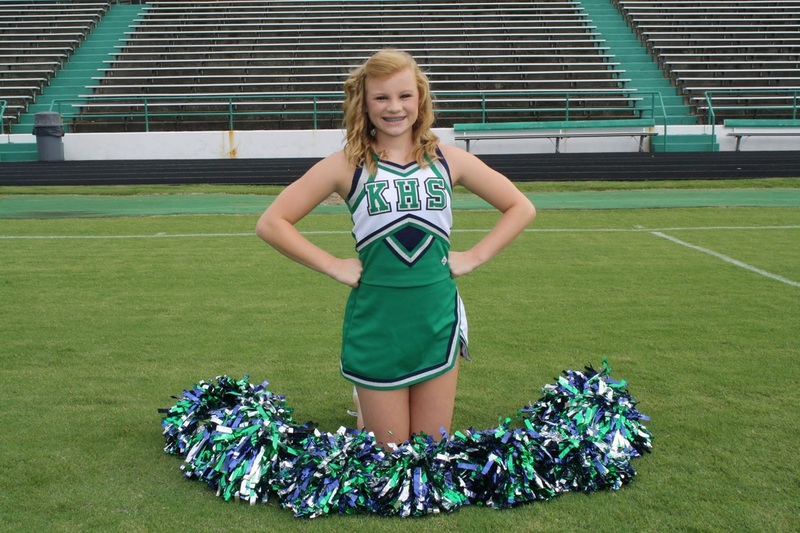 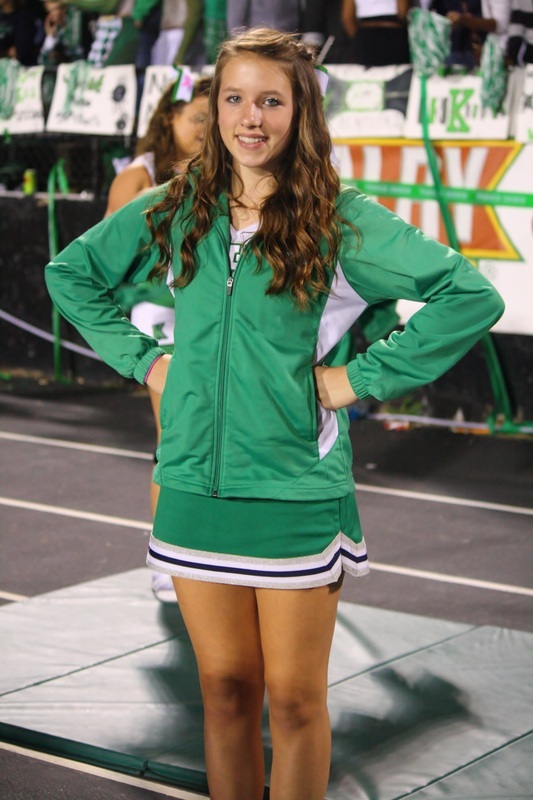 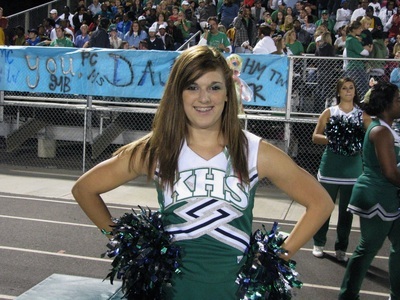 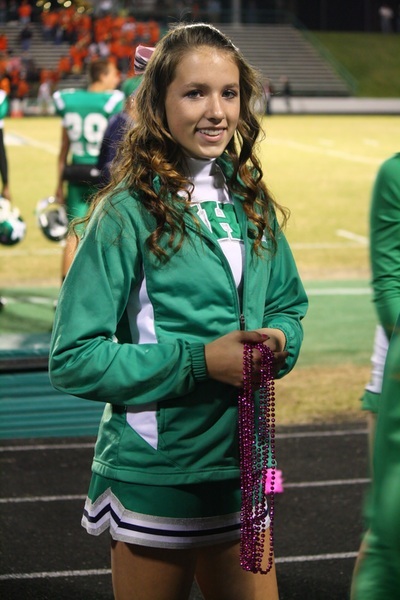 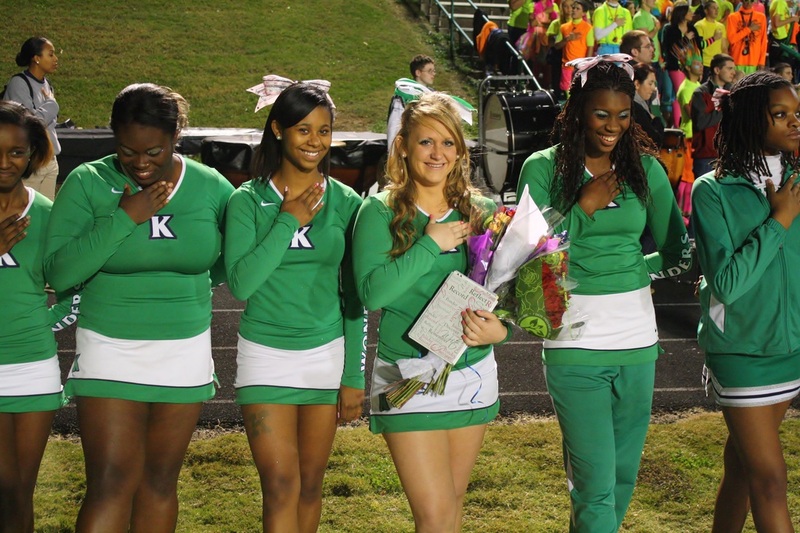 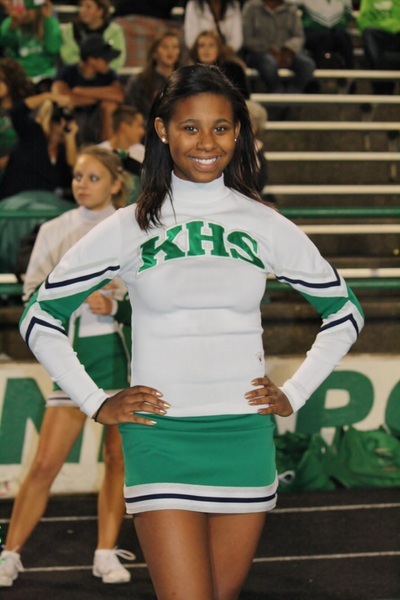 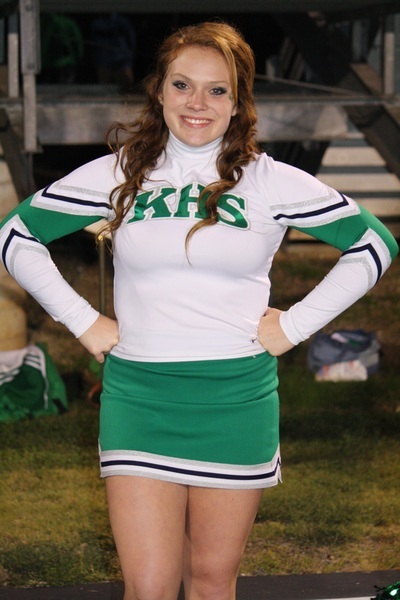 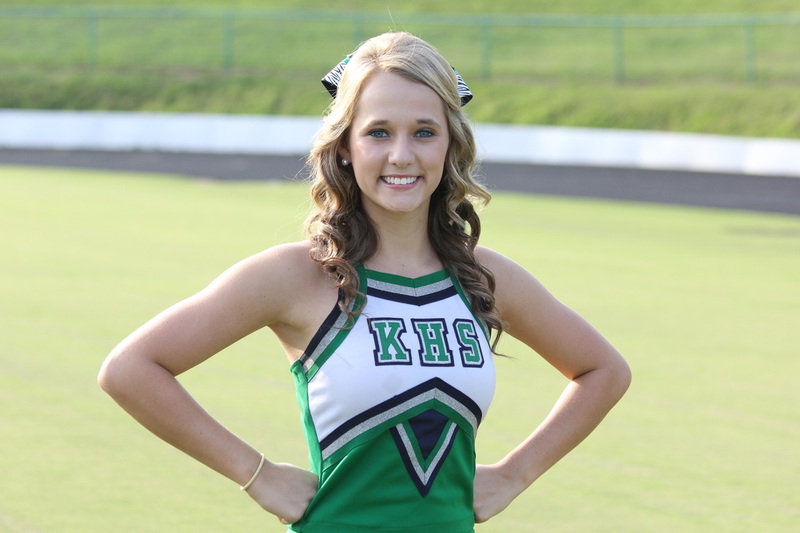 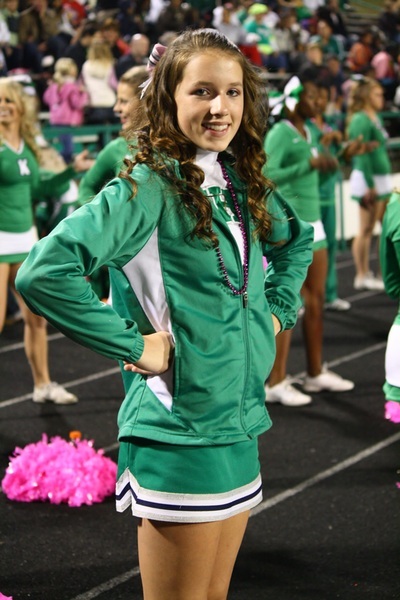 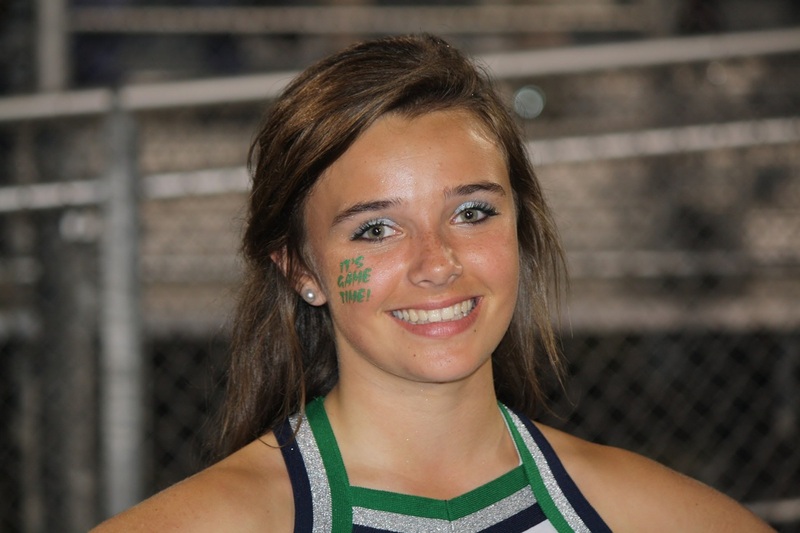 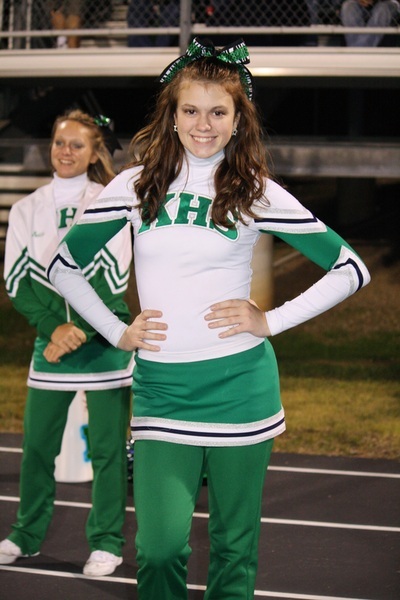 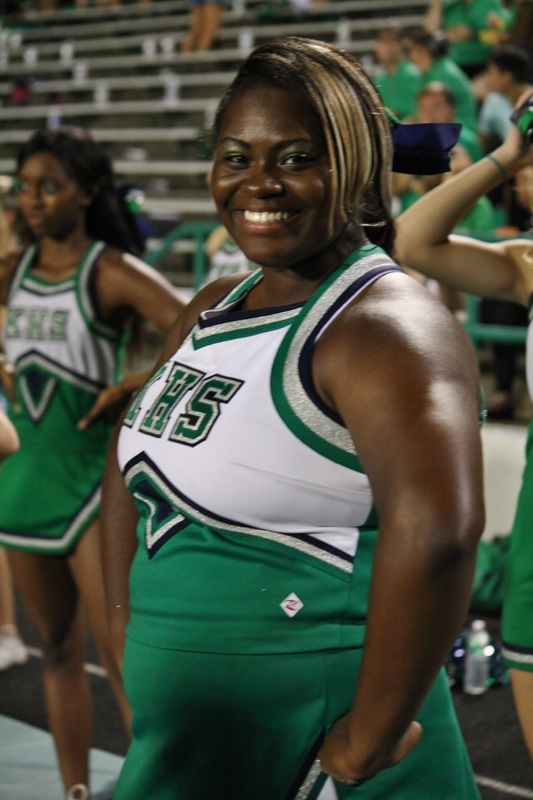 The primary objective for high school cheerleaders at any school is to promote and maintain a high level of spirit and enthusiasm within their schools and their communities. I know cheerleading on the high school level has changed drastically through the years with some change being good and some not so good. In an ever changing social climate the biggest struggle has been securing qualified teachers and coaches to assist these young ladies in their chosen extracurricular school activity. It can't be over emphasised that good coaches and instructors should have some background in organized cheerleading to be able to effectively coach this skill set. 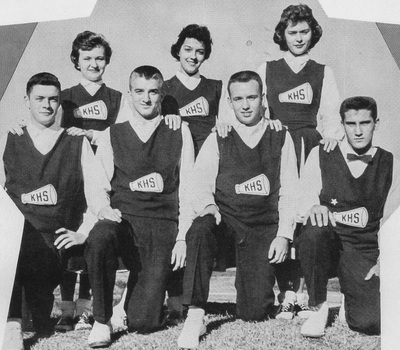 It can't be over emphasised that the teachers and coaches must have a good morale compass so that this quality can be passed down to their students who in turn will represent the school with dignity and class. "The 2006 Wonder Cheerleader's Calendar"